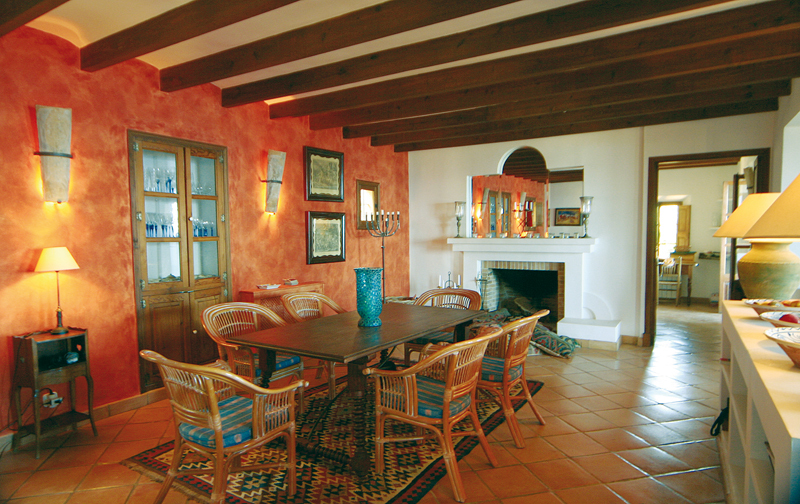 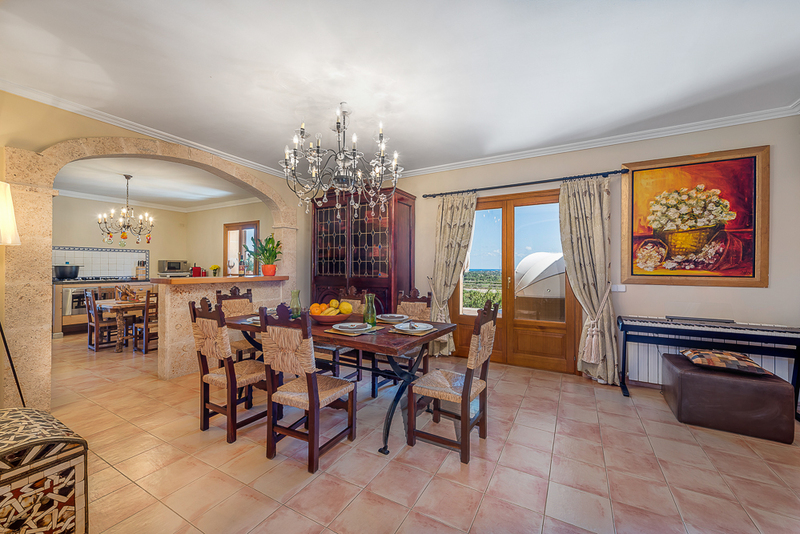 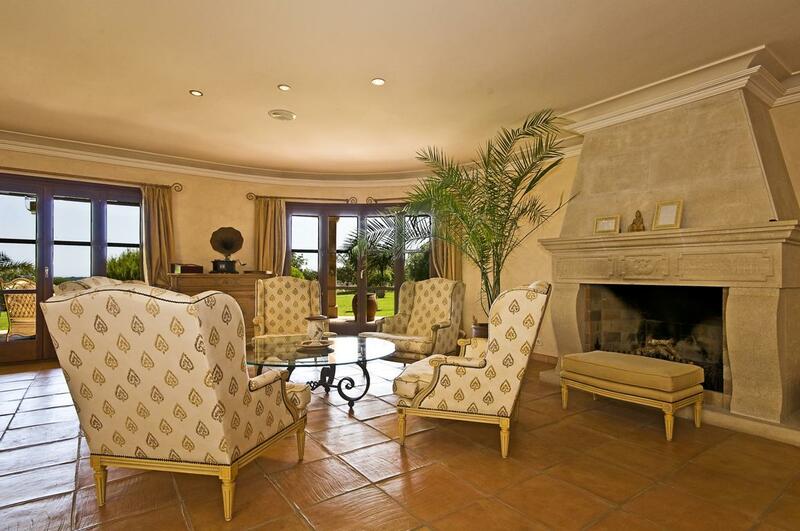 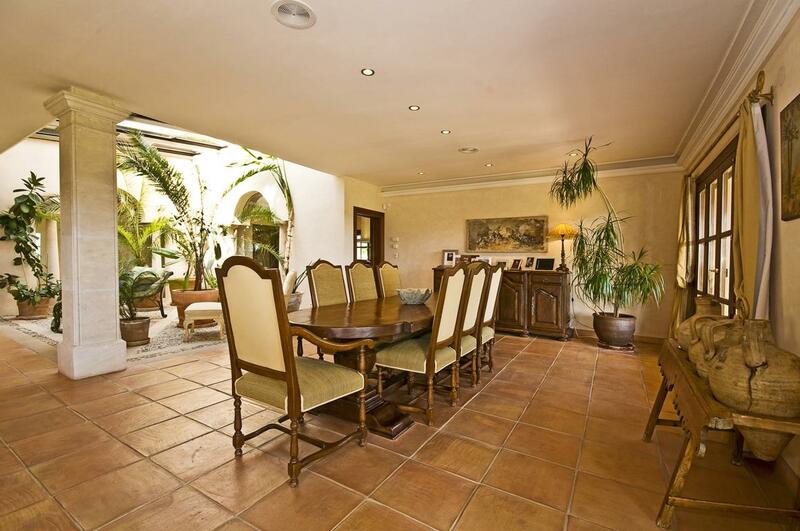 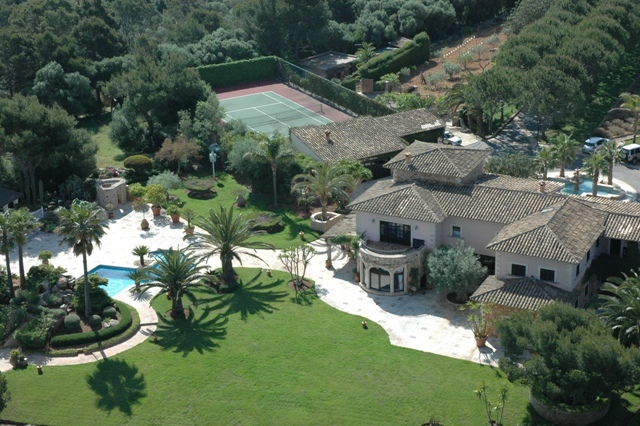 The villa offers large spaces for entertaining. 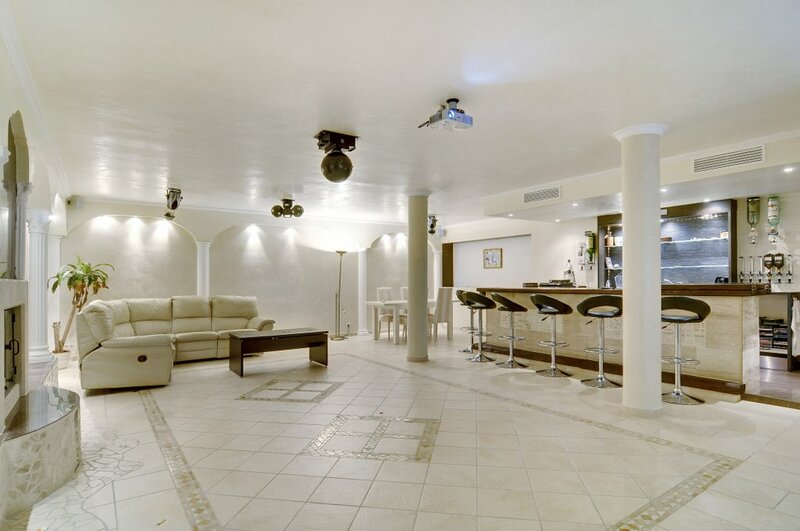 Besides the spacious lounge, there is a party room in the cellar with a large home cinema screen to celebrate all kind of event. 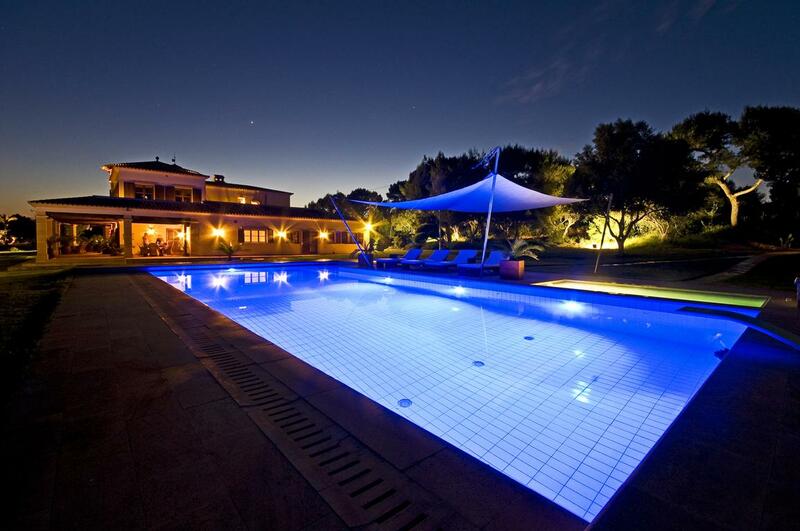 Outdoors the extensive pool and adjoining whirlpool invite for refreshing and relaxing hours. 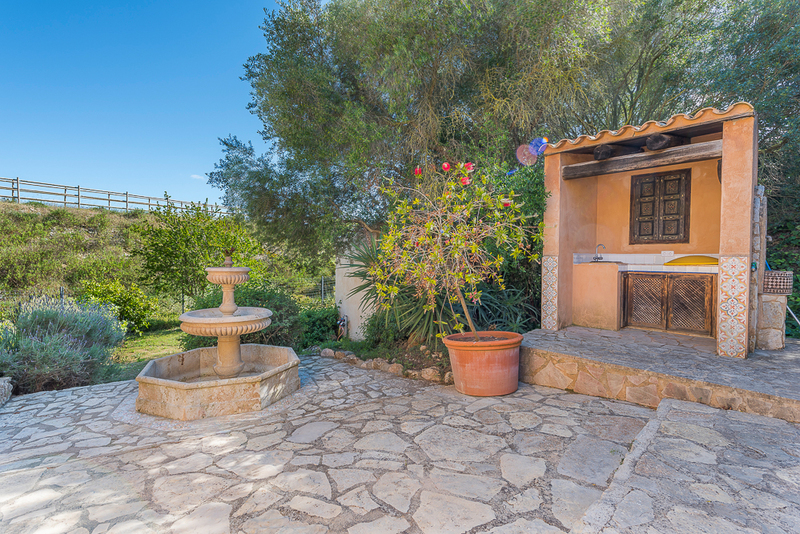 Many shady places can be found in the garden and the built-in BBQ allows for al fresco cooking with the whole family. 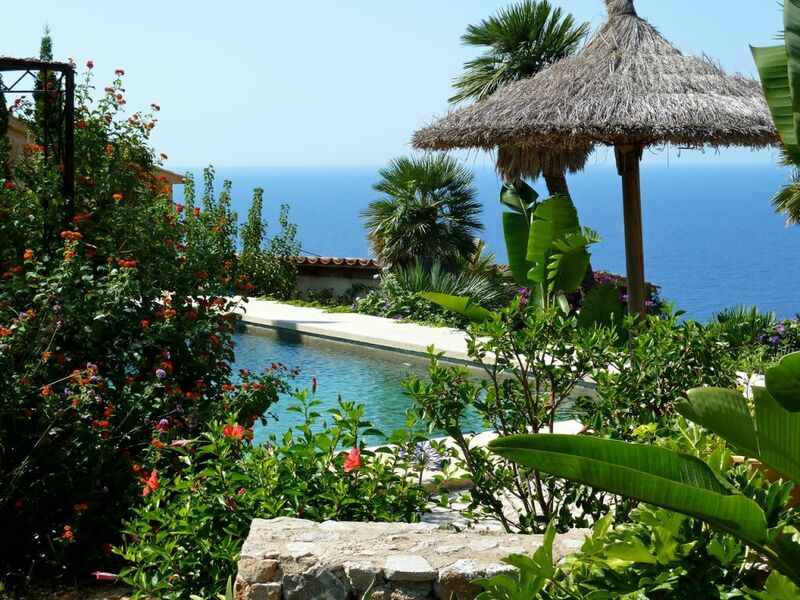 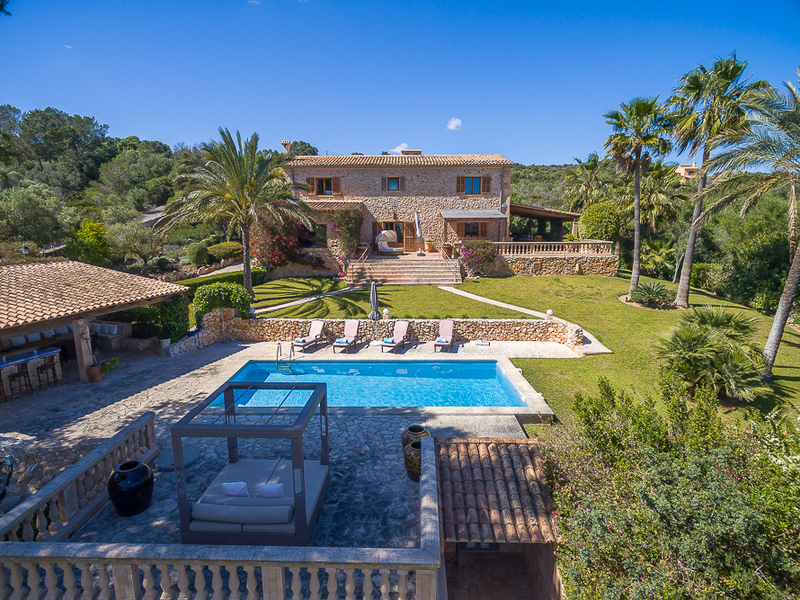 Finca Son Beltrán is an exceptional home on a large private property high above the ocean with stunning comfort, generous space and a luxurious Mediterranean ambience enhanced by spectacular sea views and fantastic sunsets. 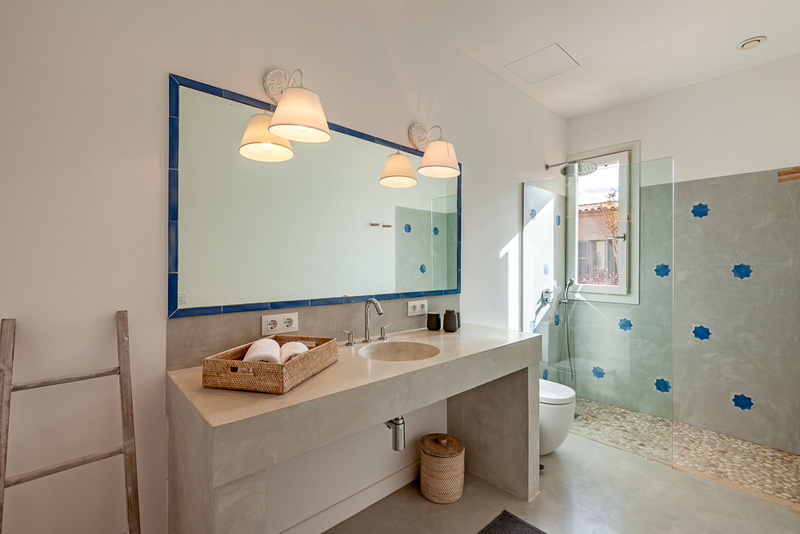 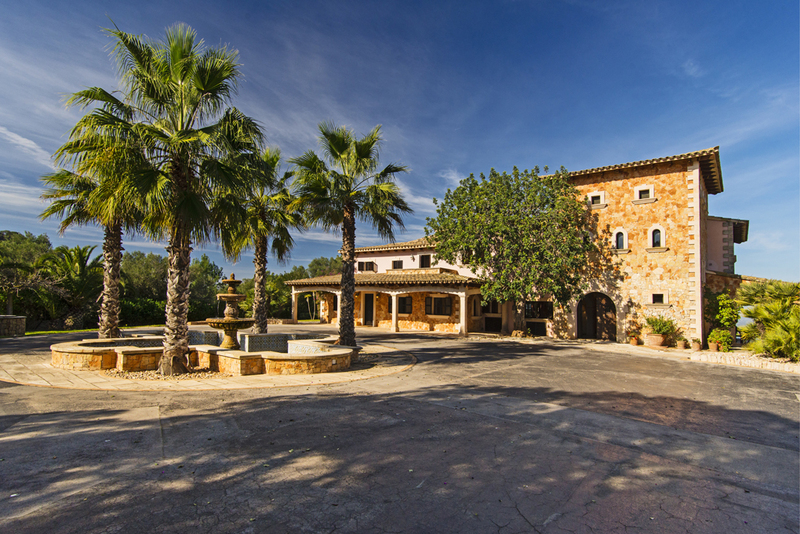 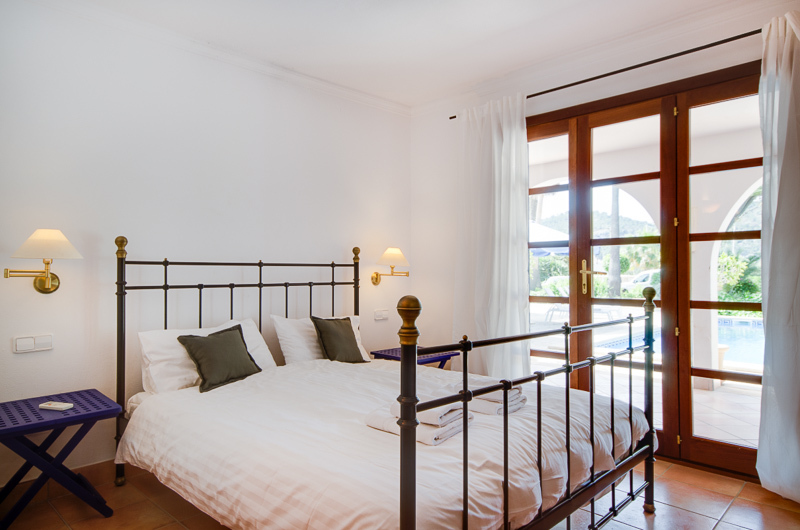 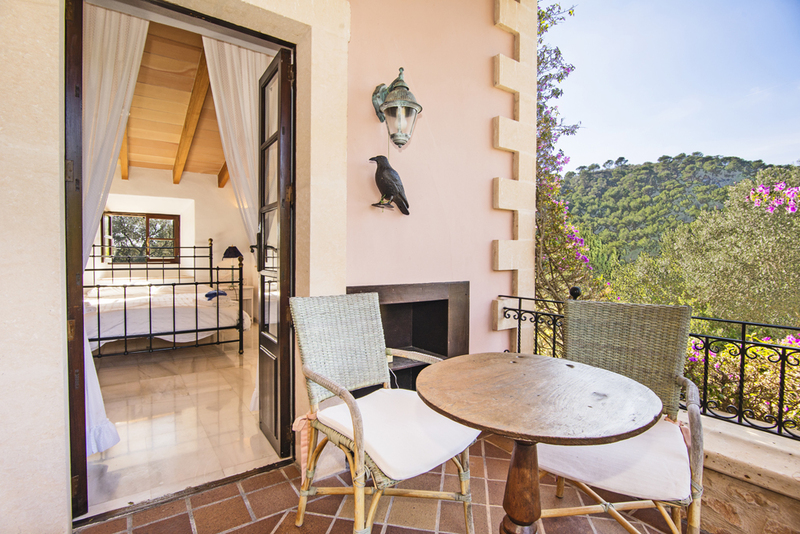 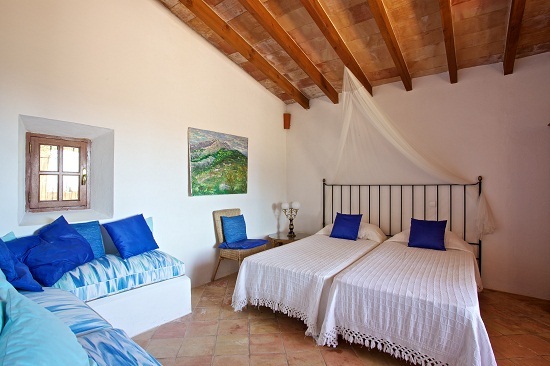 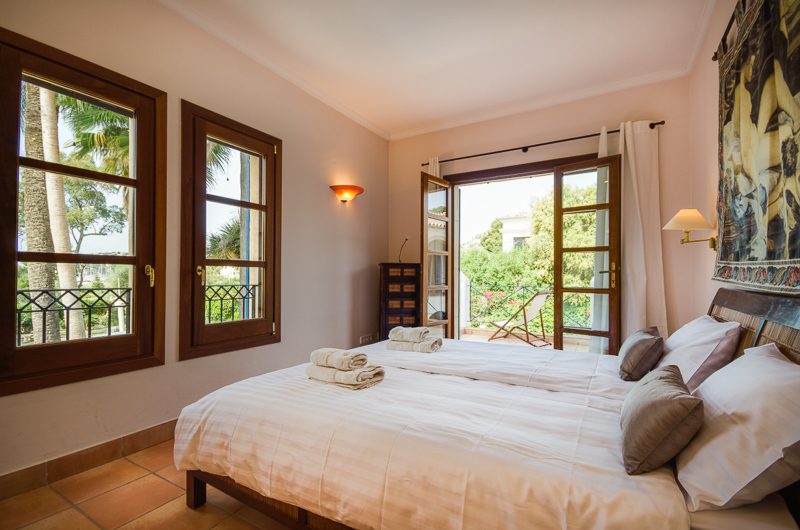 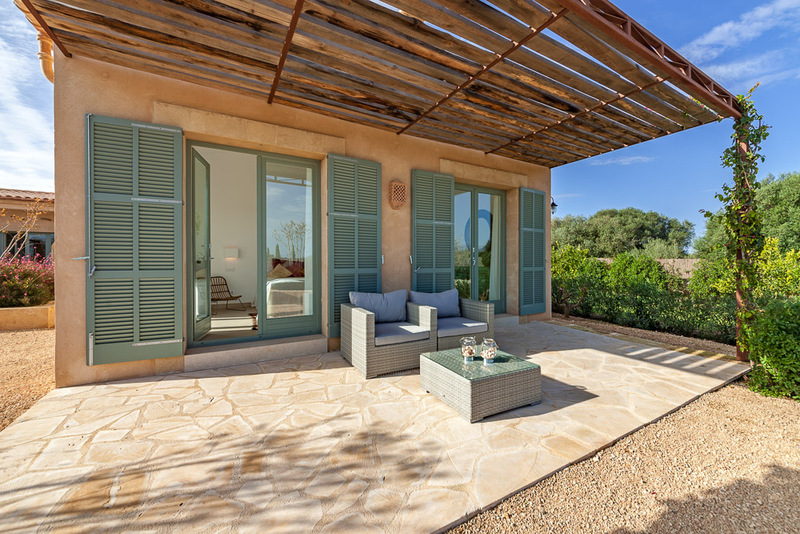 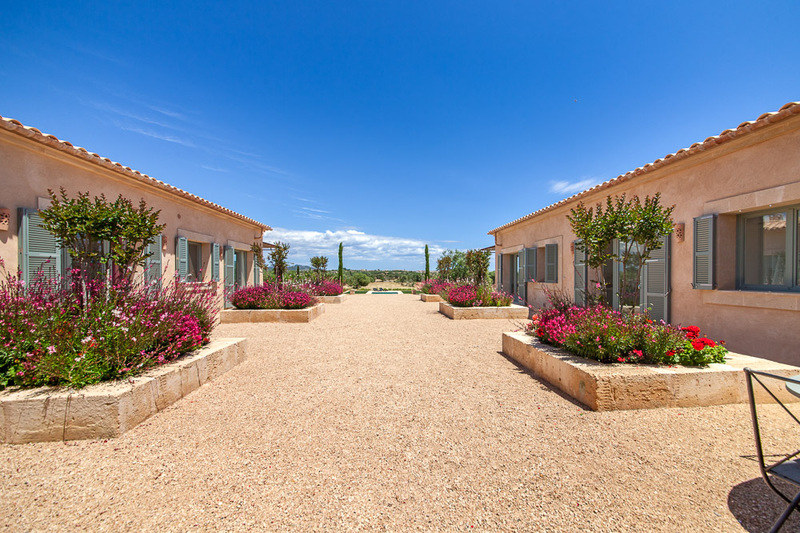 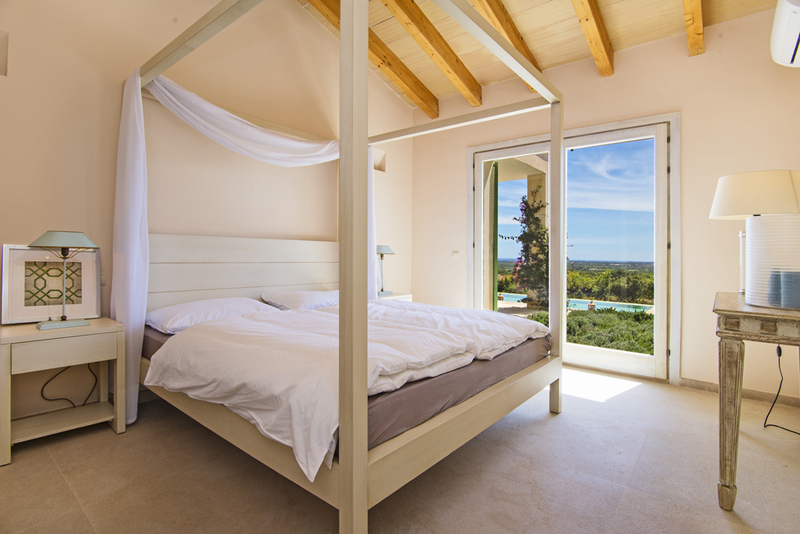 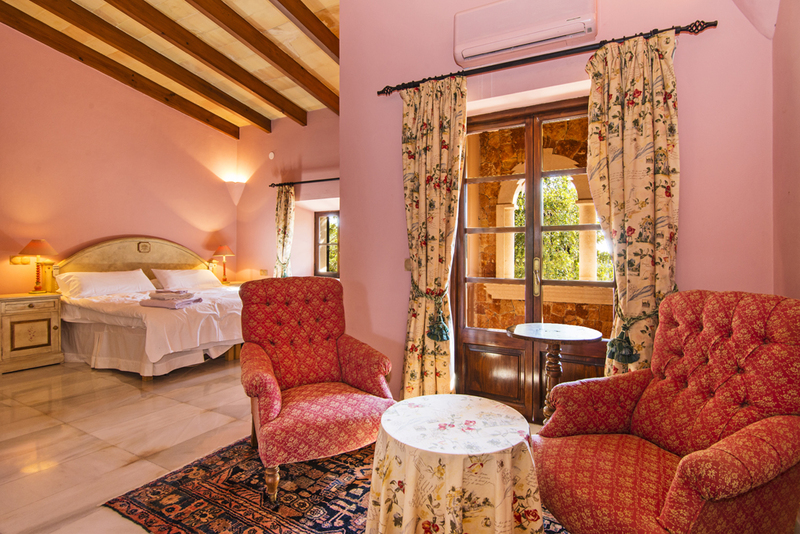 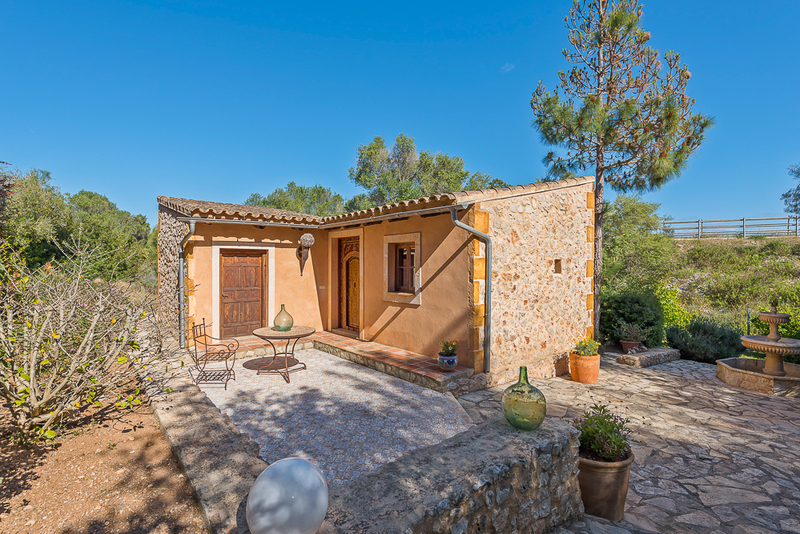 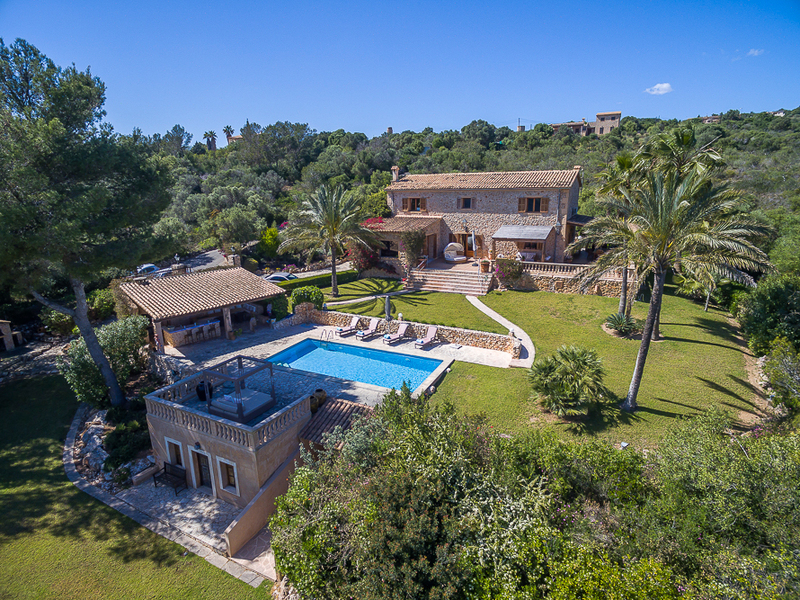 Staying here, close to the picturesque artisan village of Deía, but off the beaten tracks and amidst the pristine nature of the scenic west coast, is equivalent to experiencing the very best, Mallorca has to offer. 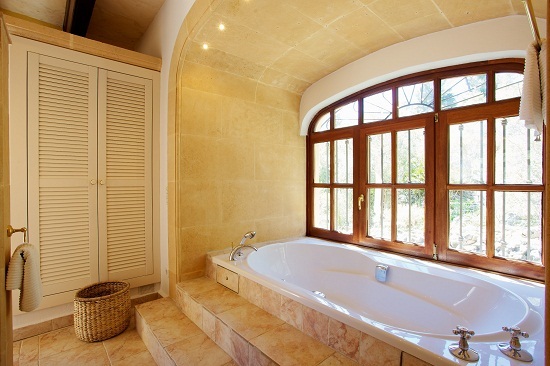 Central heating allows for all year occupation. 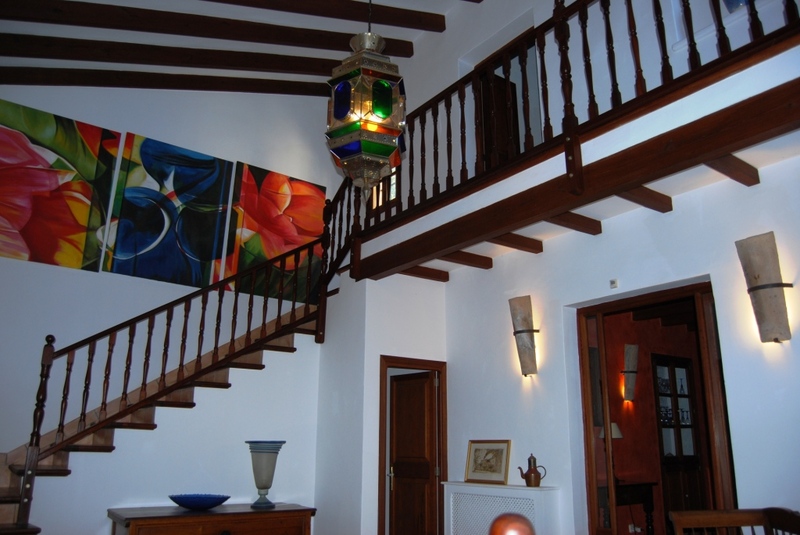 The Finca has 3 levels. 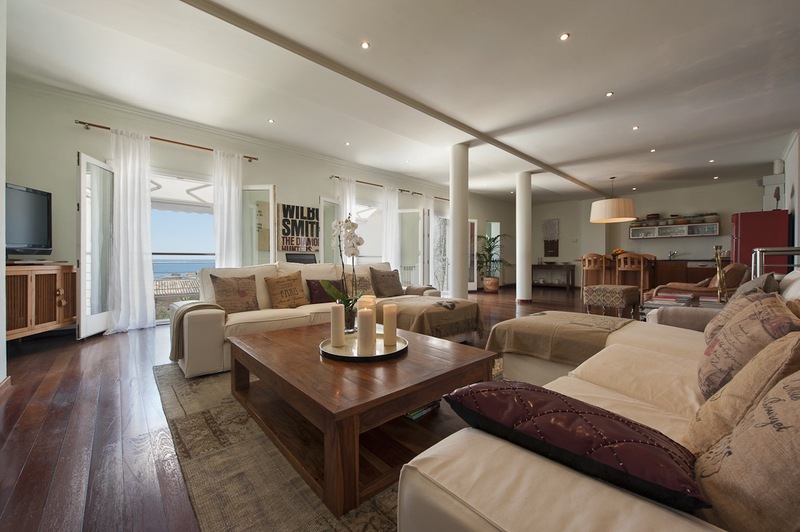 Top floor: Masterbedroom with bathroom en suite; Middle Floor: living and dining room, kitchen; Bottom floor: 3 bedrooms and 3 bathrooms. 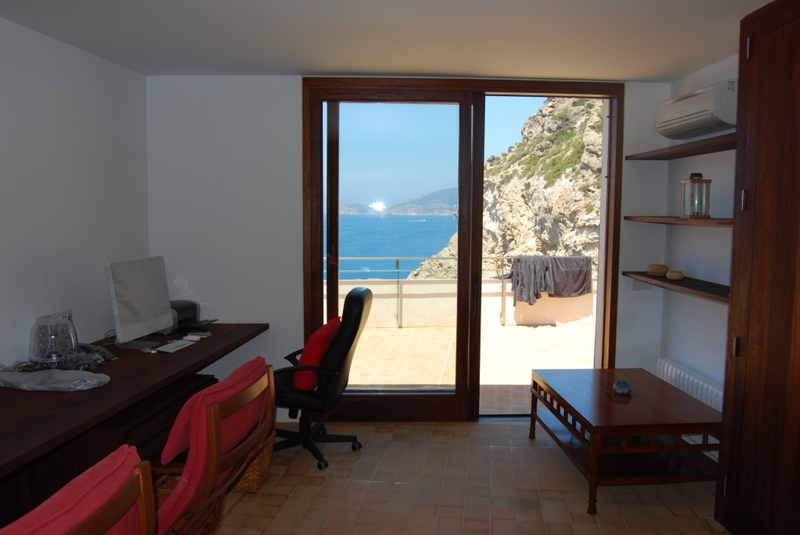 Internet (W-LAN). 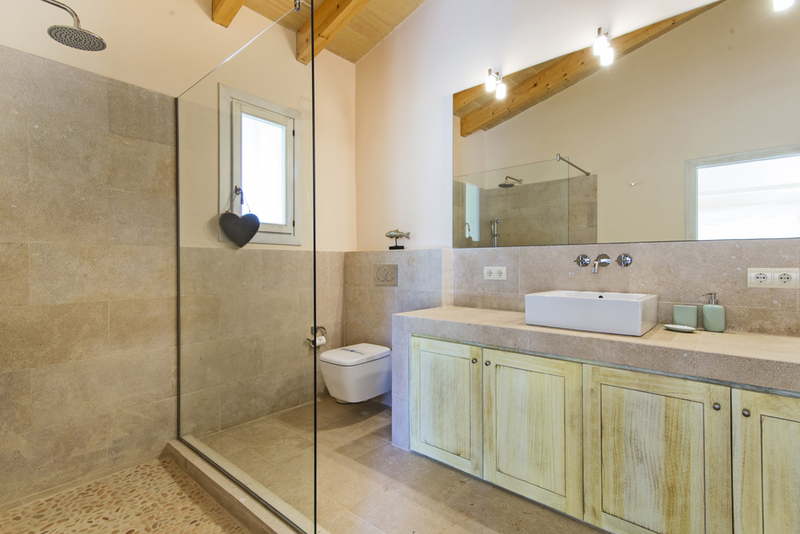 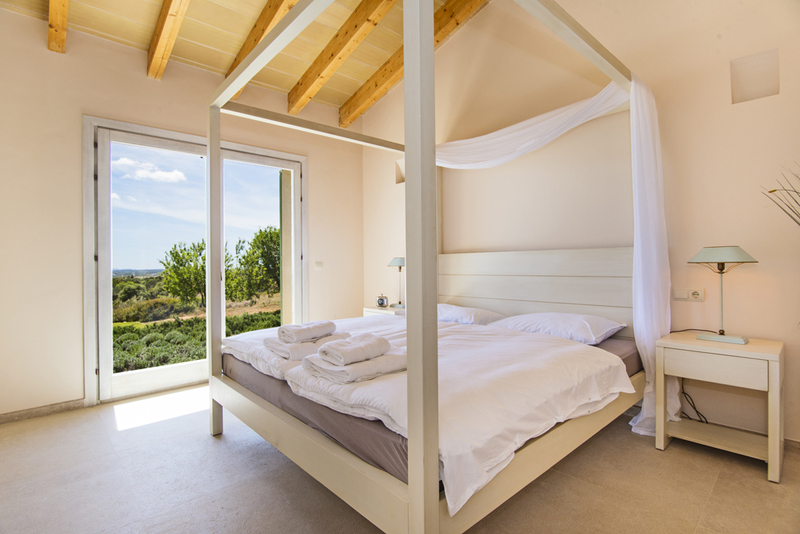 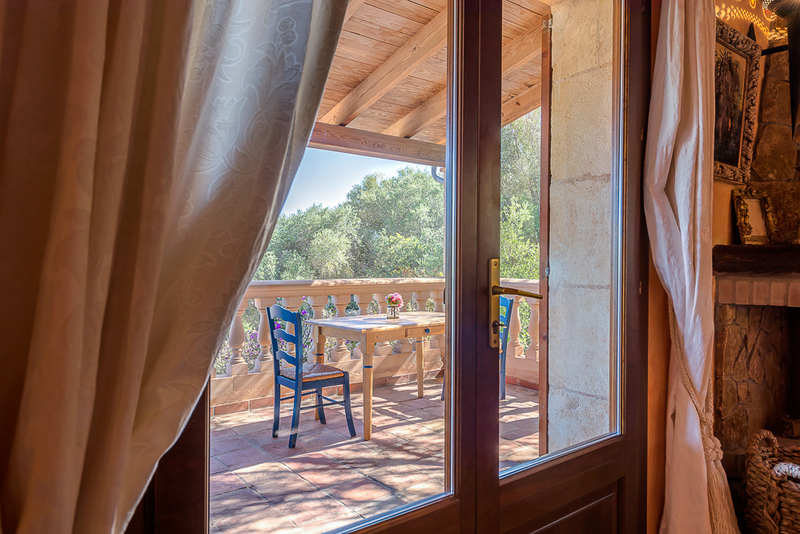 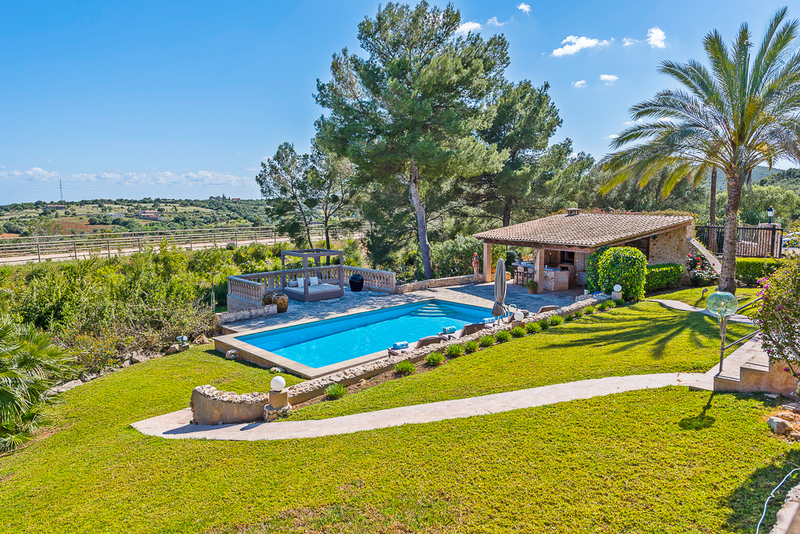 The impressive holiday home nestles romantically on a gentle hill and being surrounded by lush vegetation and mature olive trees, it enjoys absolute privacy and tranquility. 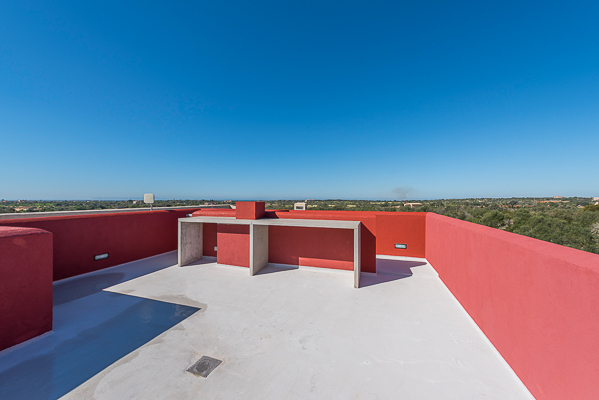 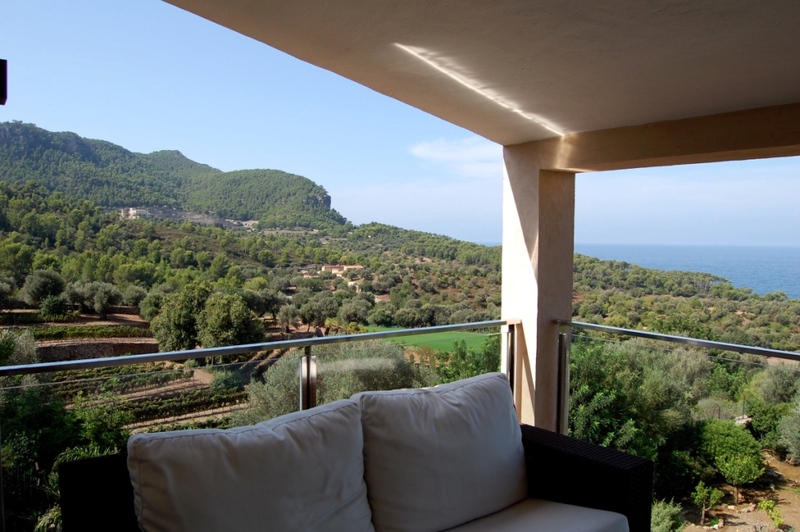 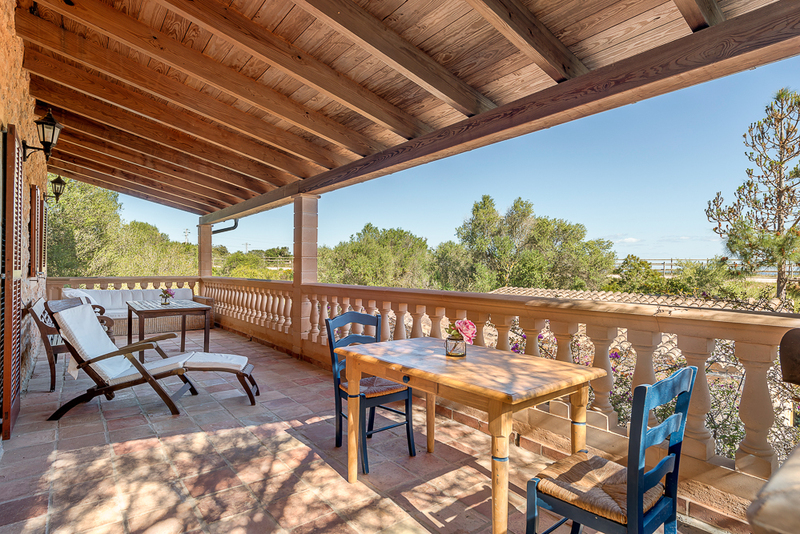 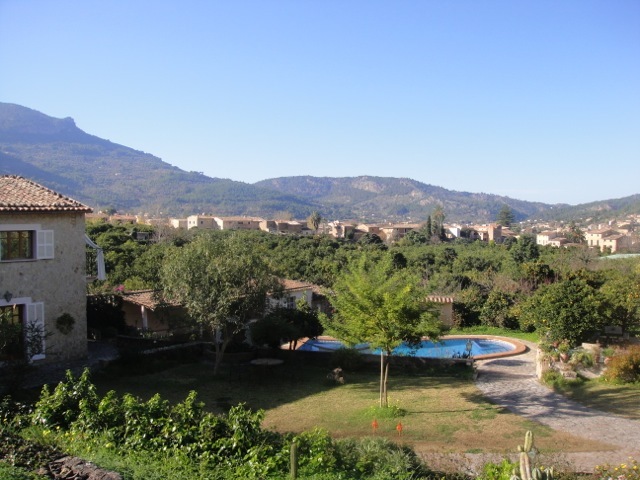 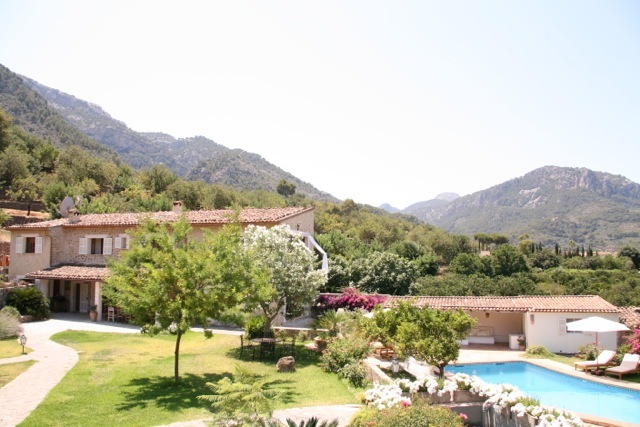 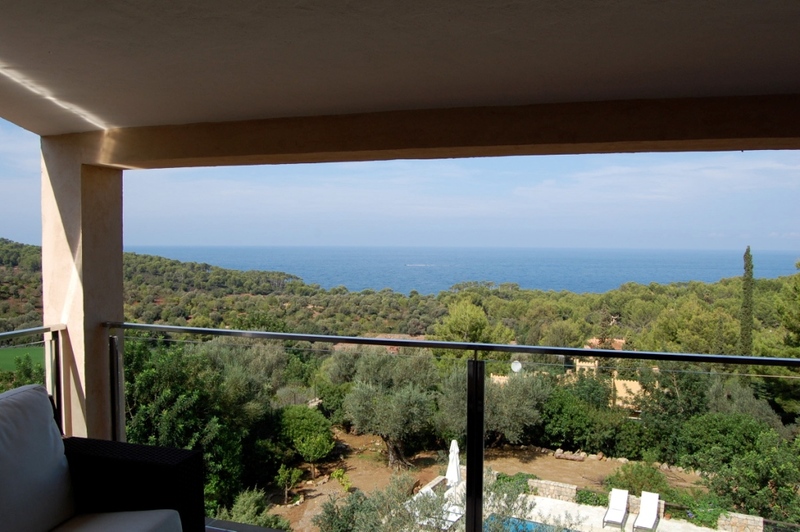 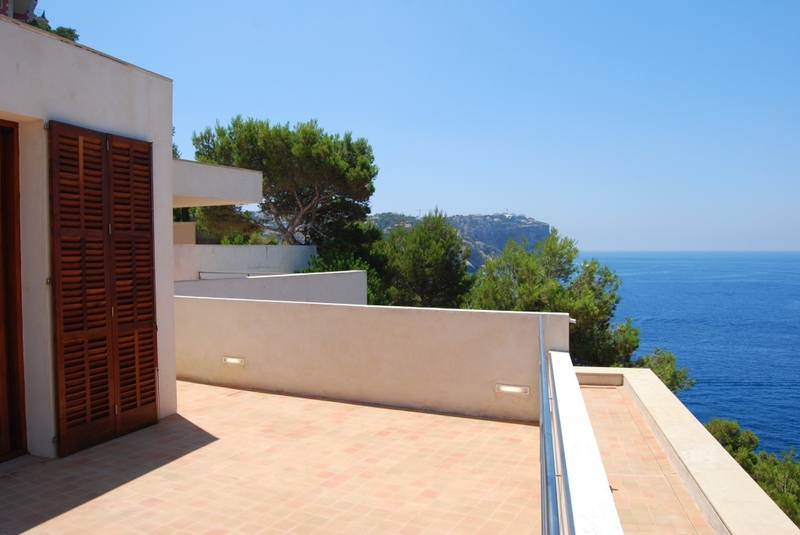 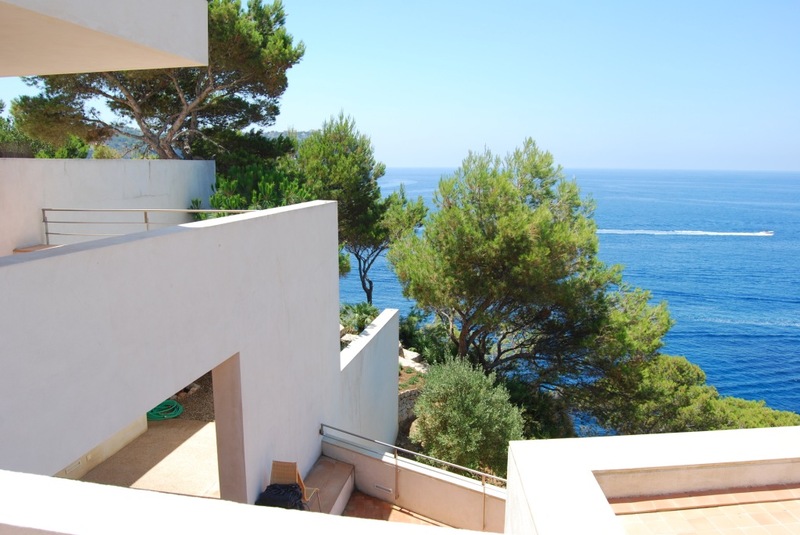 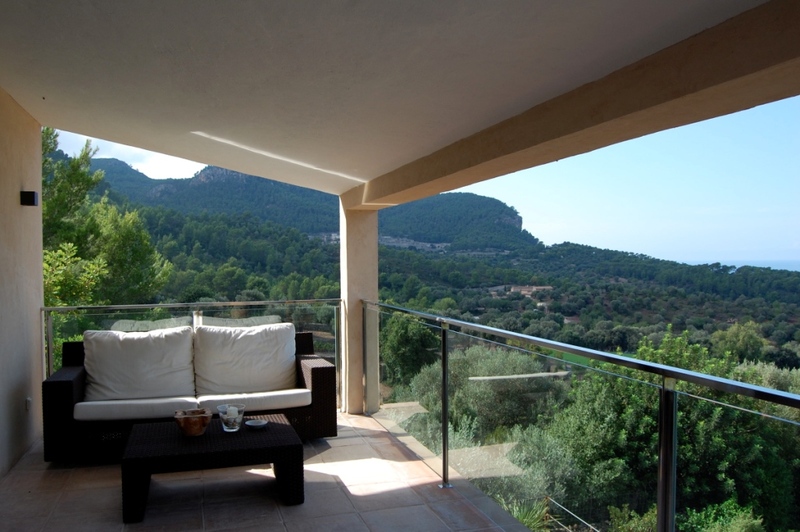 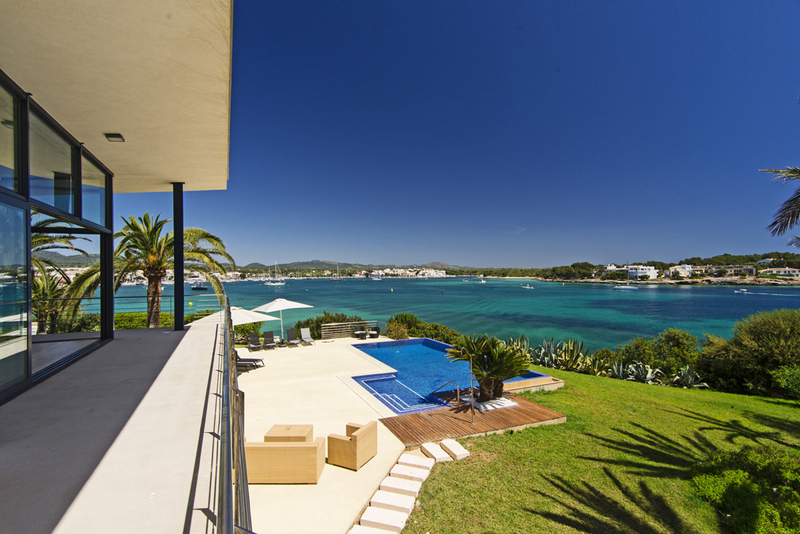 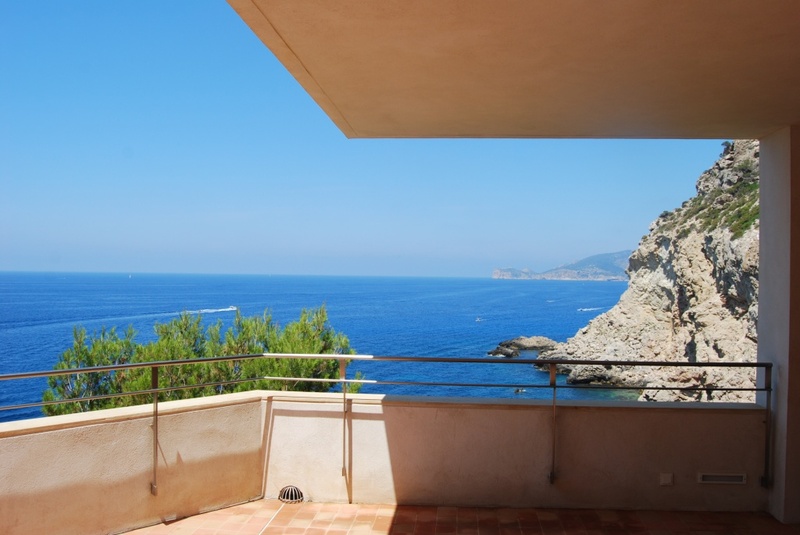 The view from this elevated location to the three bays of Pollença, Alcudia and Cala san Vincente is fantastic. 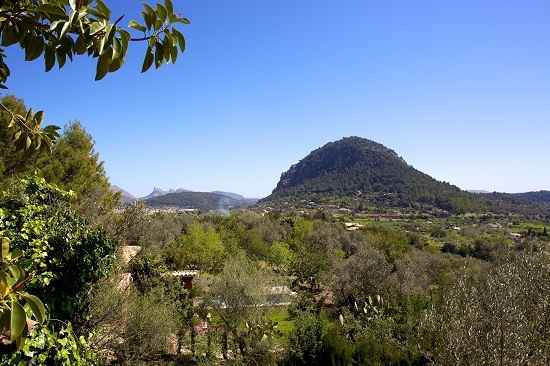 Right in front lays Puig Maria, the monastery mountain, boardered by the lush greens of the Pollença golf course. 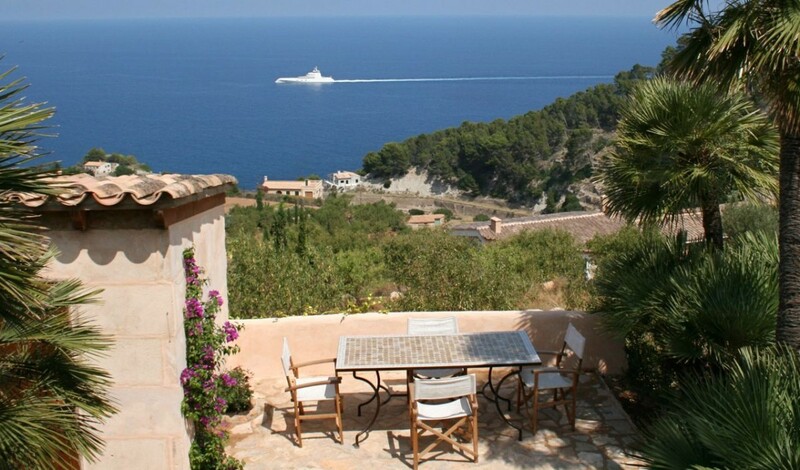 You best reach the beaches by car in about 10 minutes, but to Pollença you might enjoy the 15 walking minutes. 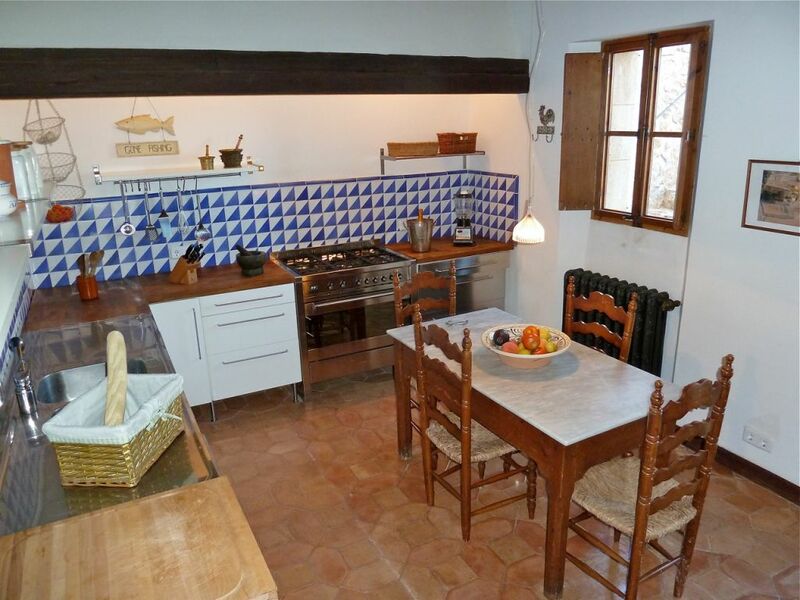 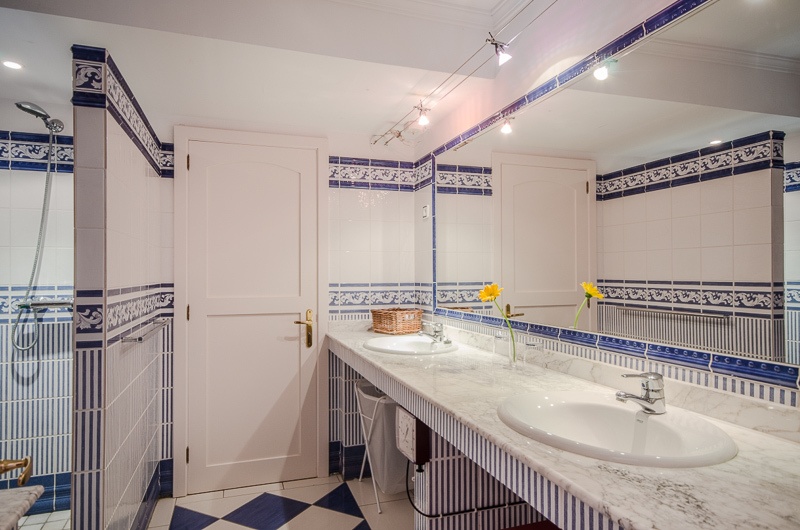 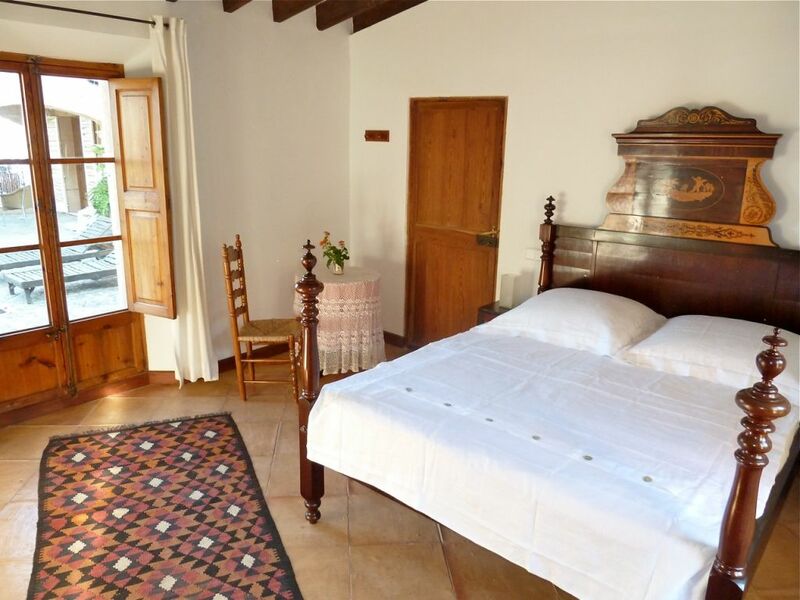 The original property is about 180 years old and was renovated between 1990 and 1996. 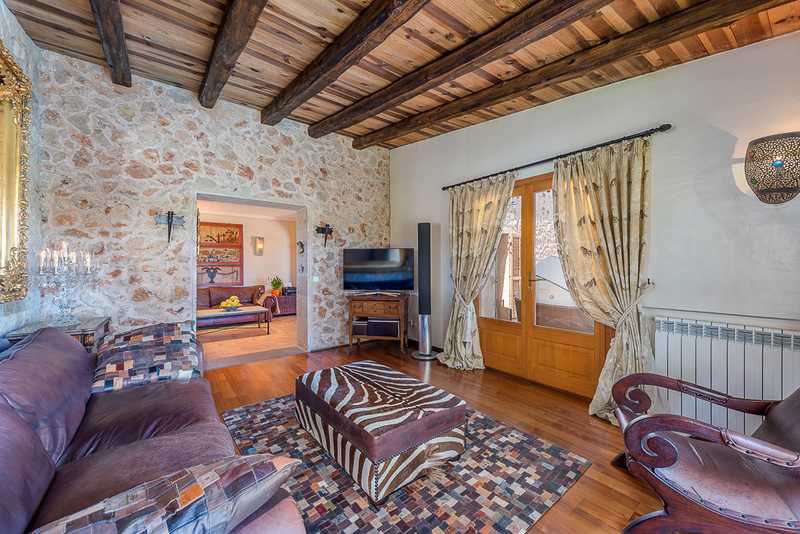 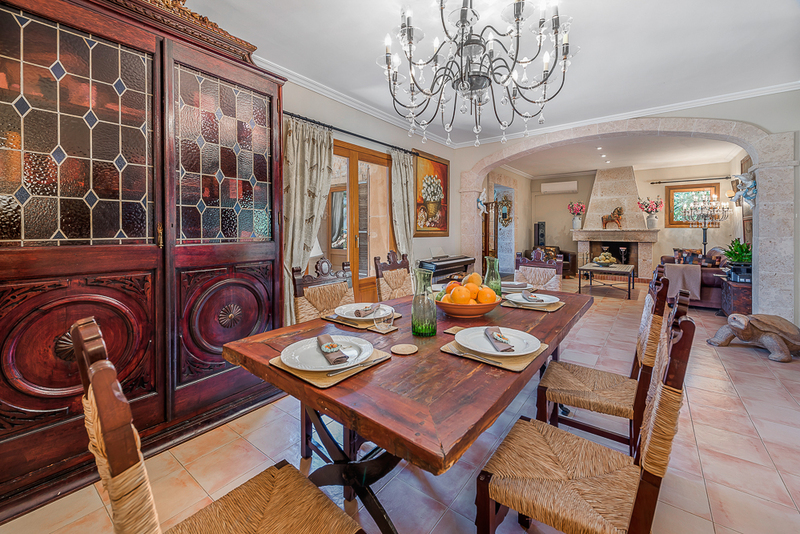 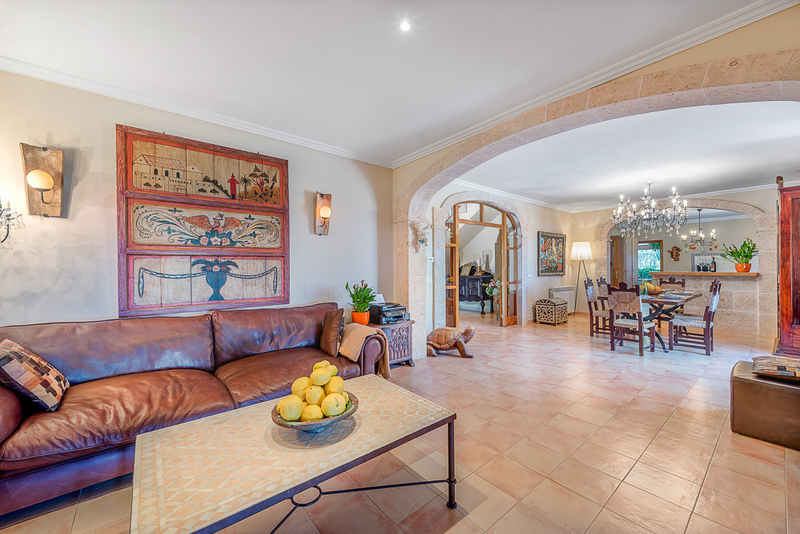 It offers genuine Mediterranean flair combined with high-quality furnishing and tasteful decorations and it is thus a successful combination of elegant, modern and traditional country home style. 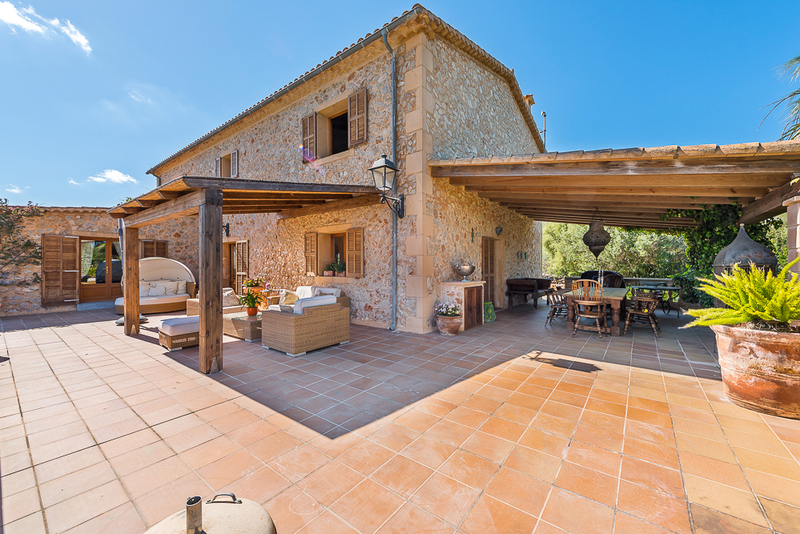 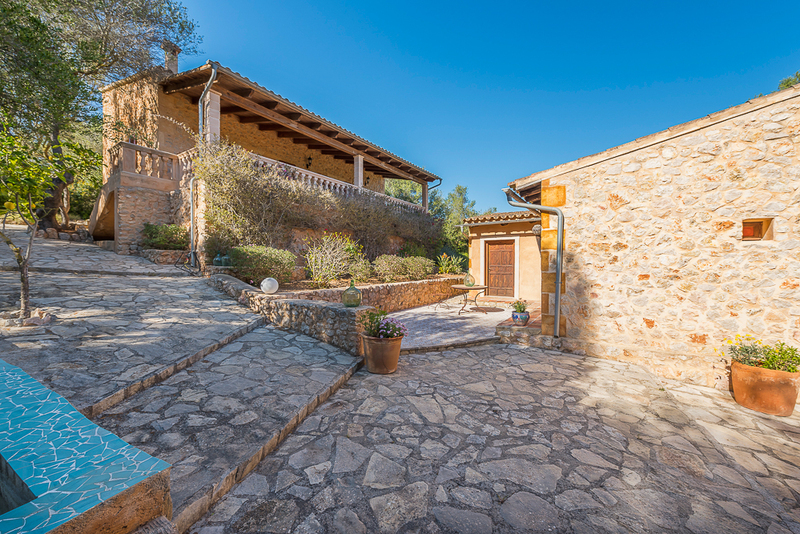 The 2-storey Finca has been completely renovated and extended to become a Mediterranean dream with sweeping sea and mountain views. 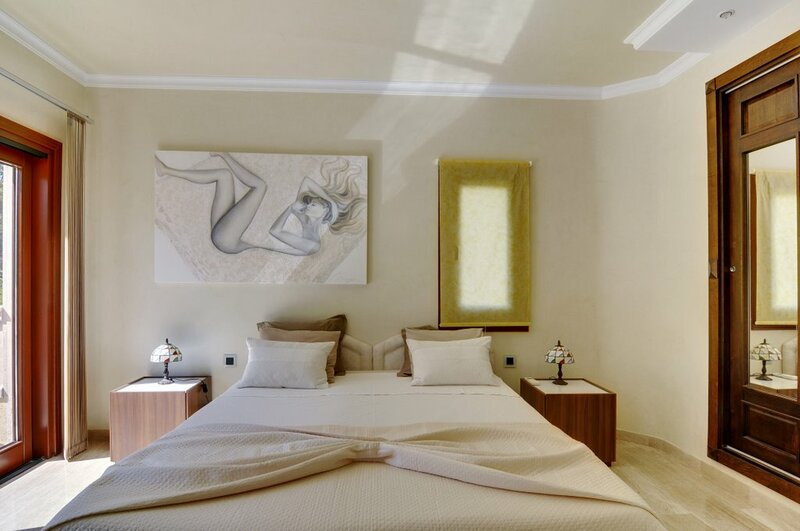 The inspiring design and high-quality furniture and fixtures create an ambience of modern comfort and stylish relaxation. 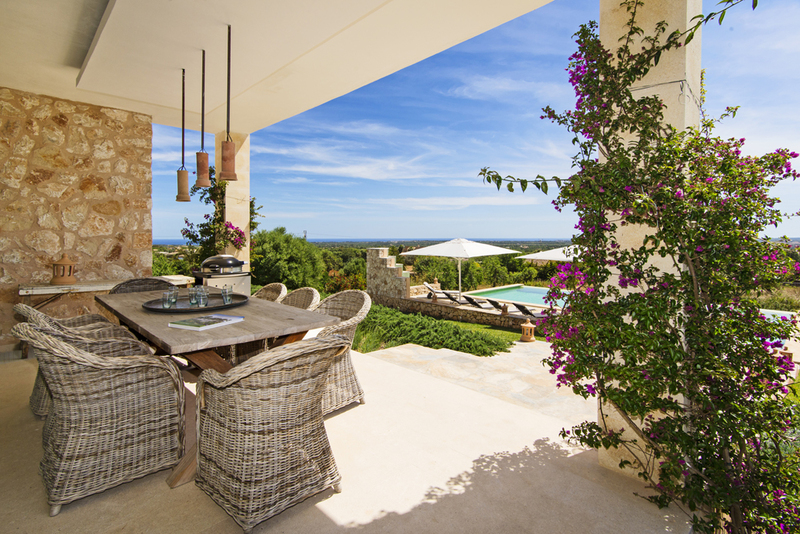 The large, open-plan living and dining room with adjoining kitchen flows onto the upper sun-covered terrace with spectacular views. 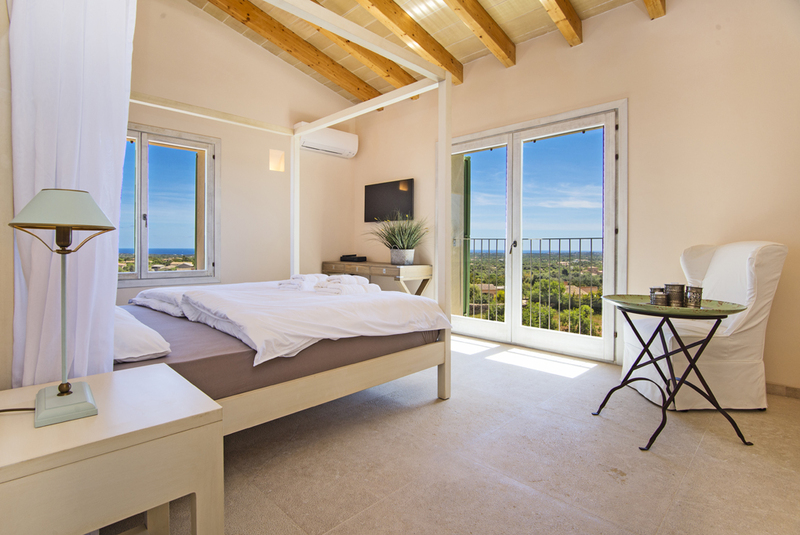 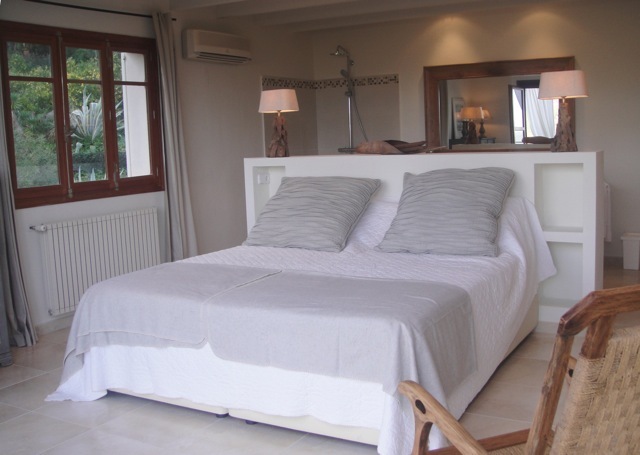 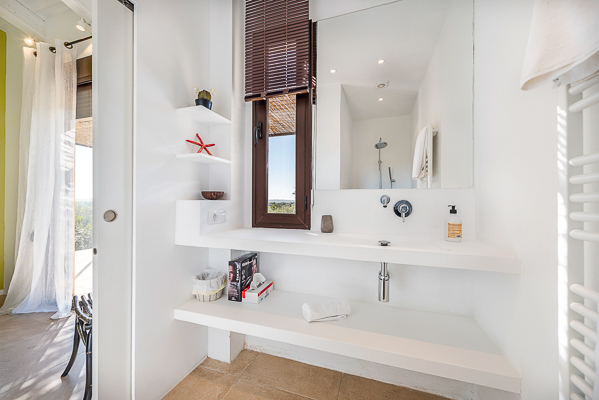 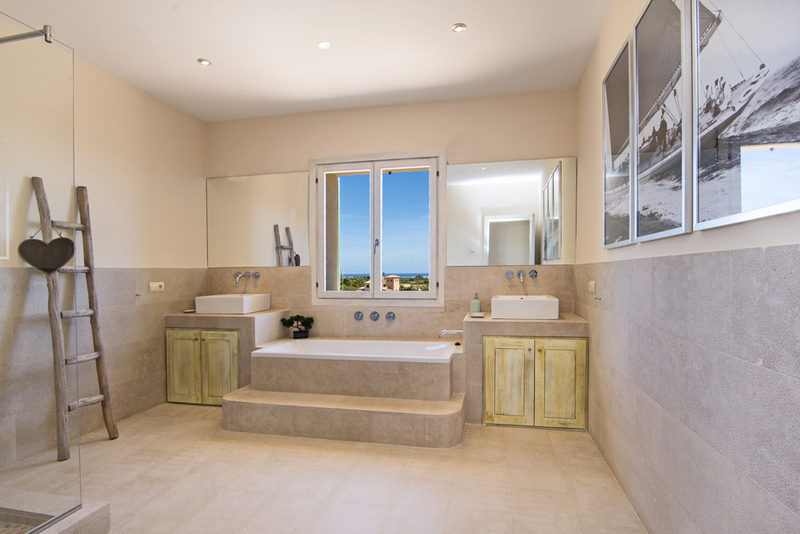 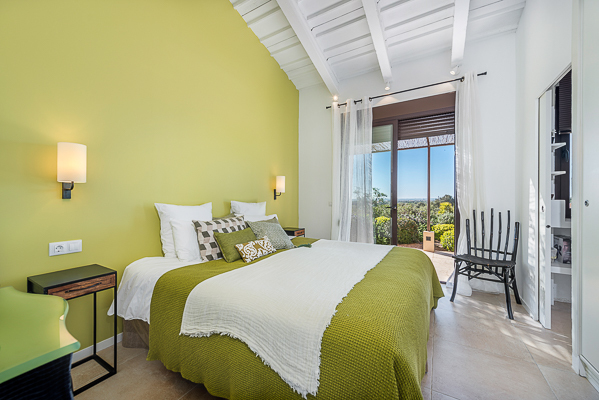 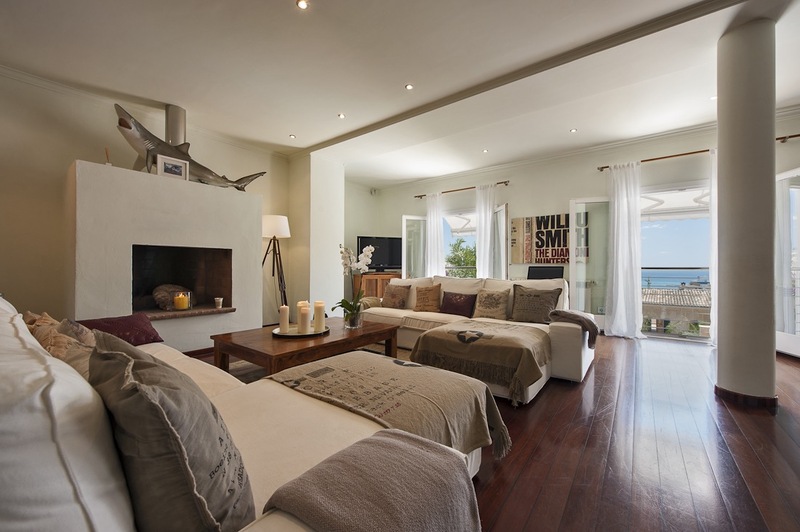 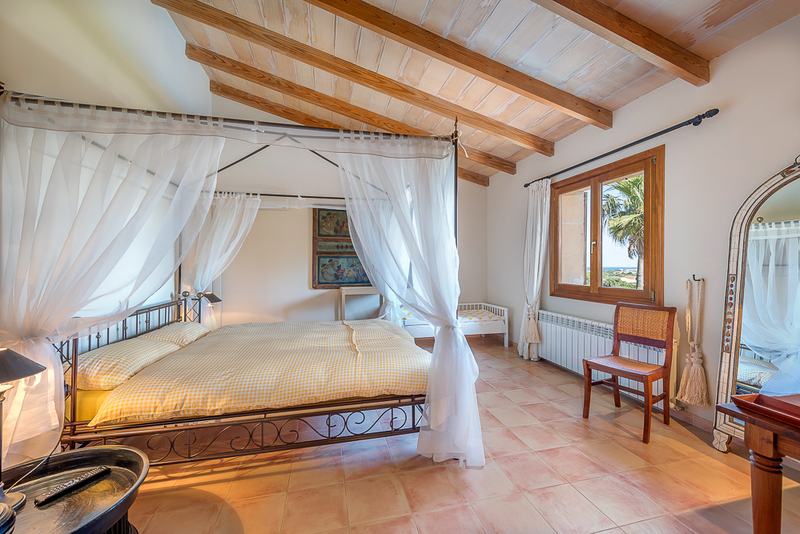 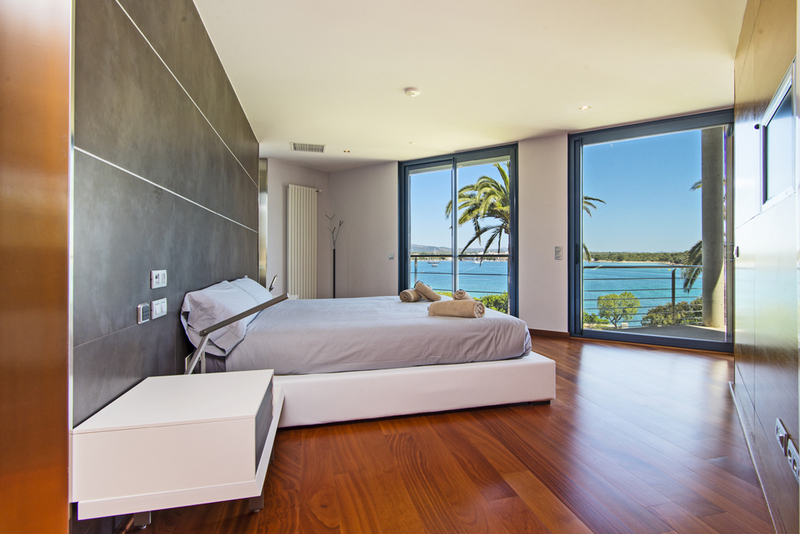 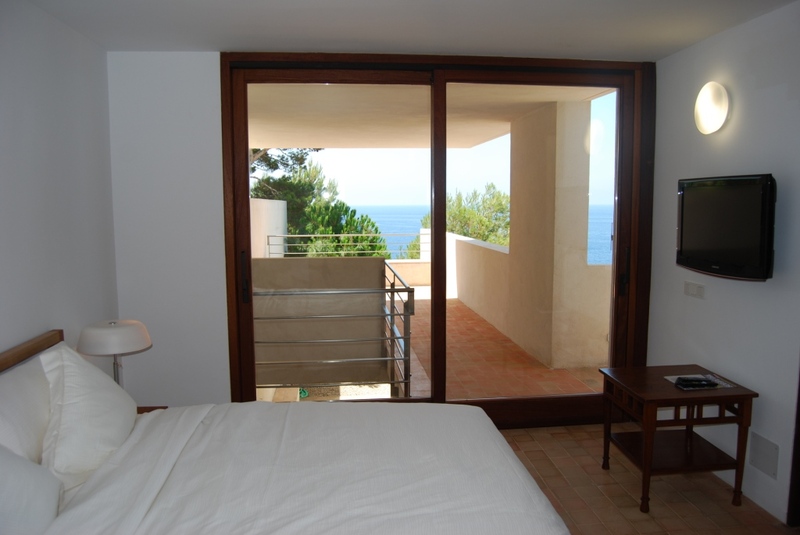 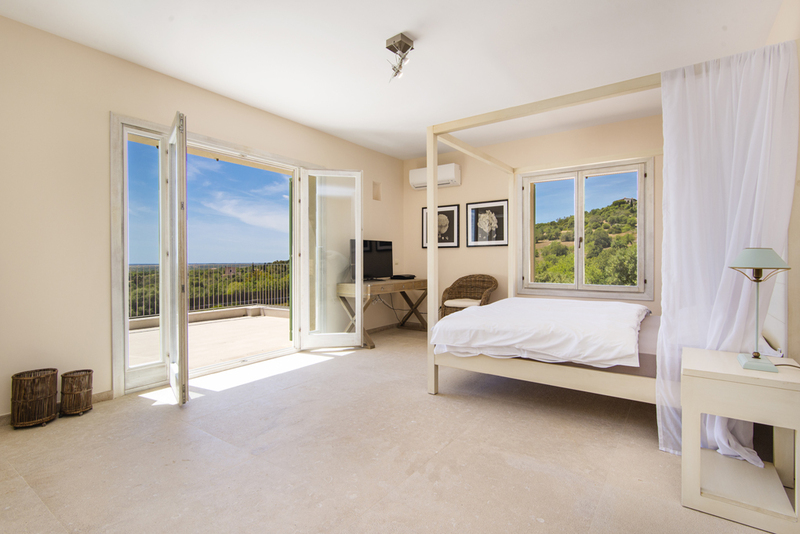 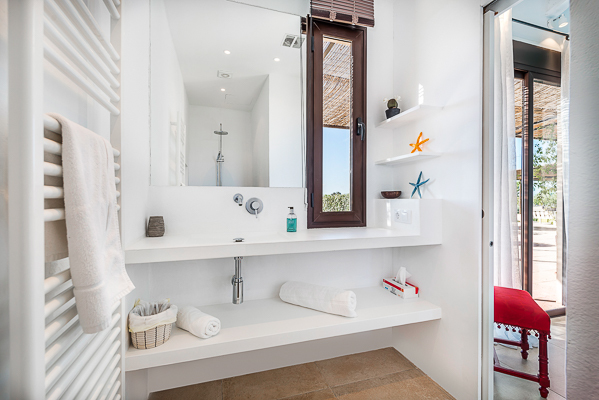 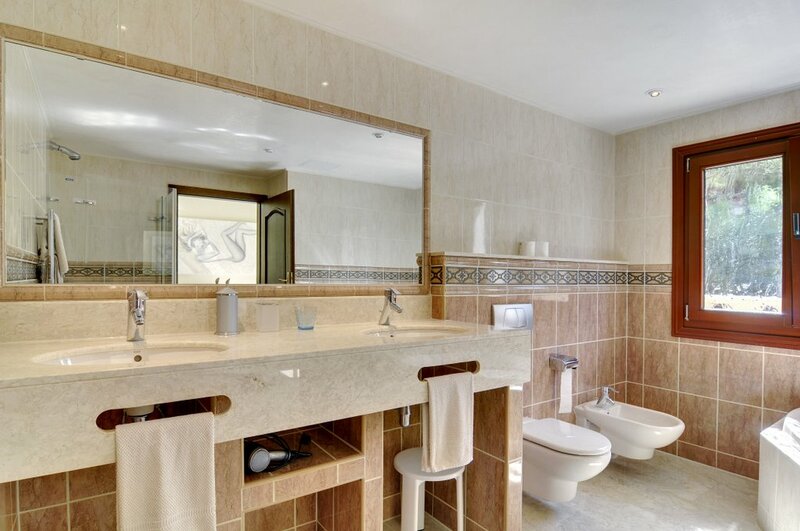 The en-suite bedroom on this entrance level and the remaining 3 en-suite bedrooms located downstairs, all have access to terraces with lounge furniture and marvelous sea views. 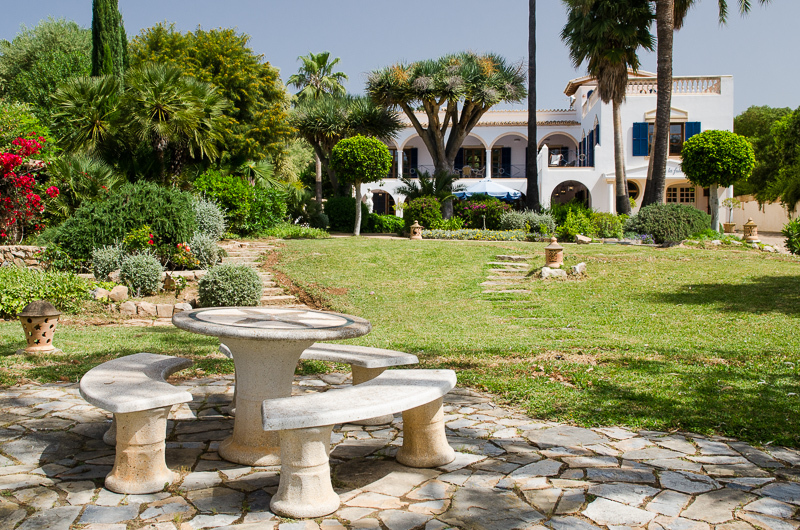 More sunny and sun-shaded seating and chill options can be found in the charming pool garden surrounded by Mediterranean plants and indigenous vegetation - another perfect place in the evening to enjoy memorable sun sets. 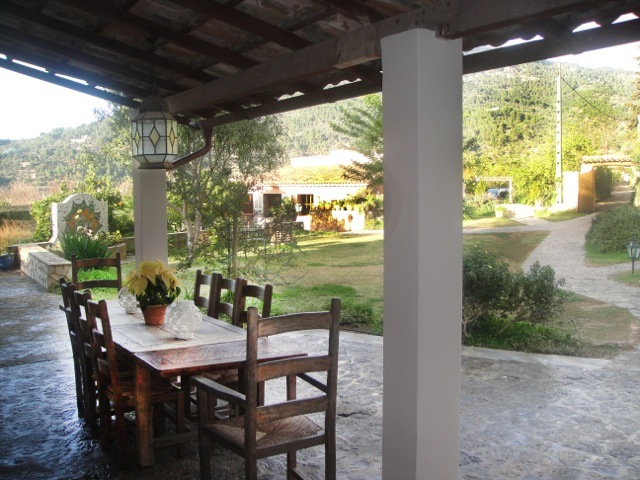 The newly built Finca Can Bebel offers a great view of Santanyi’s Churche. 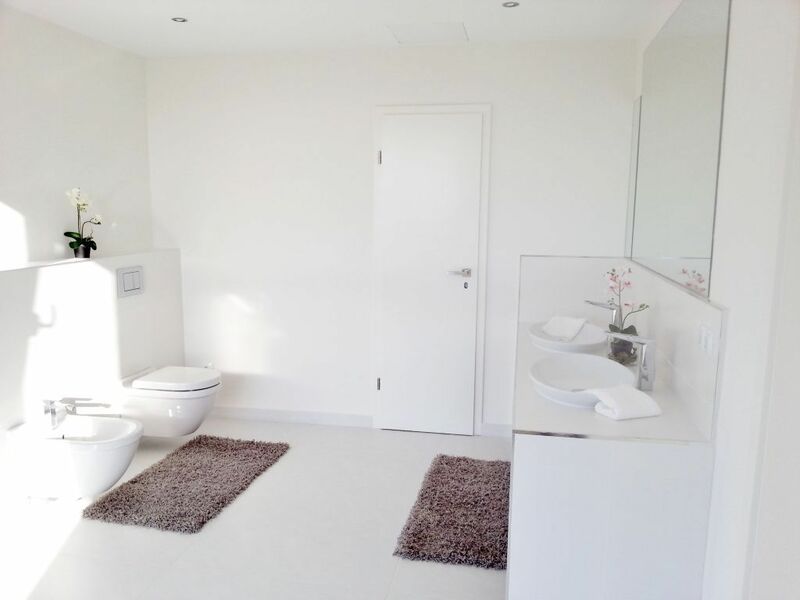 The house has been built in a U-form and has 4 double bedrooms with bathroom en suite and a small single bedroom with a shower room which is situated behind the kitchen. 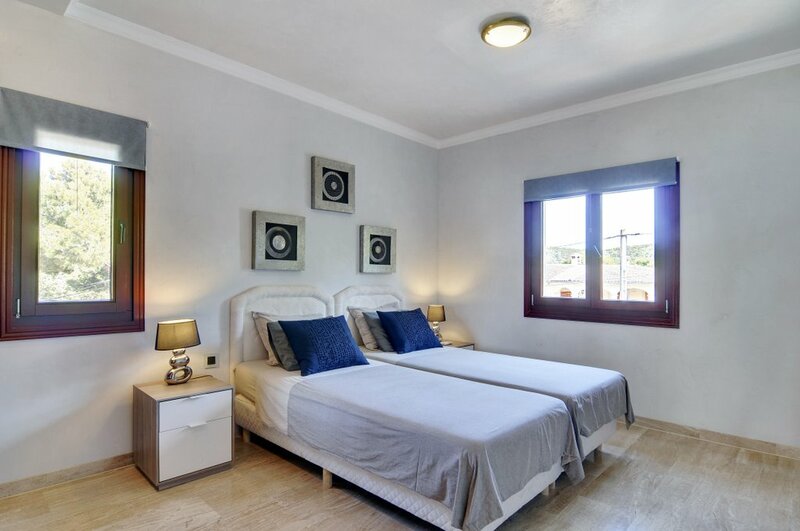 The 4 double bedrooms have air conditioning and are all situated in the same section of the property. 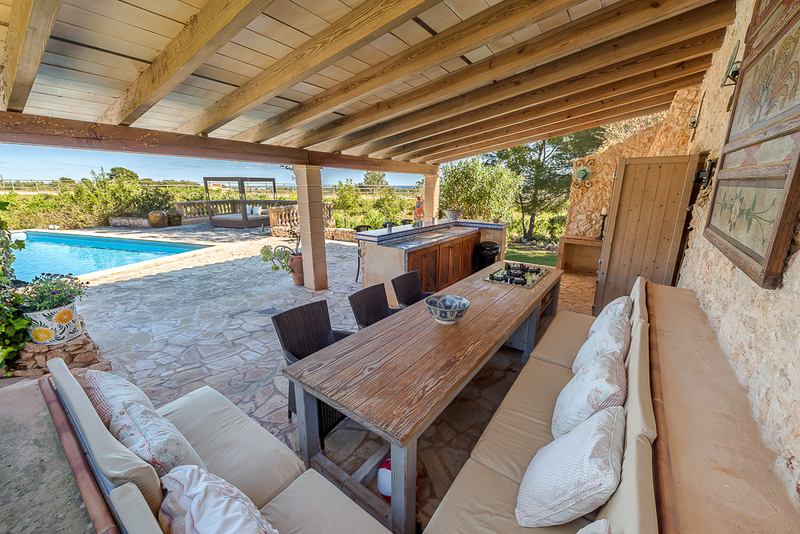 On the opposite site are the kitchen and the living area situated. 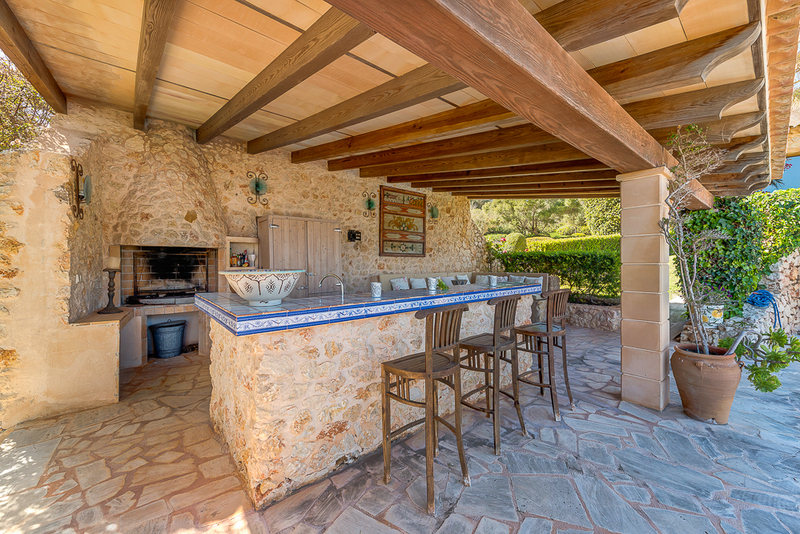 Thereby a lovely patio came into existence. 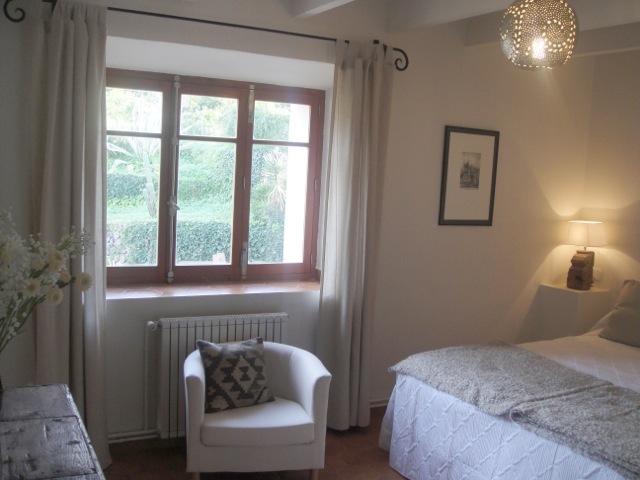 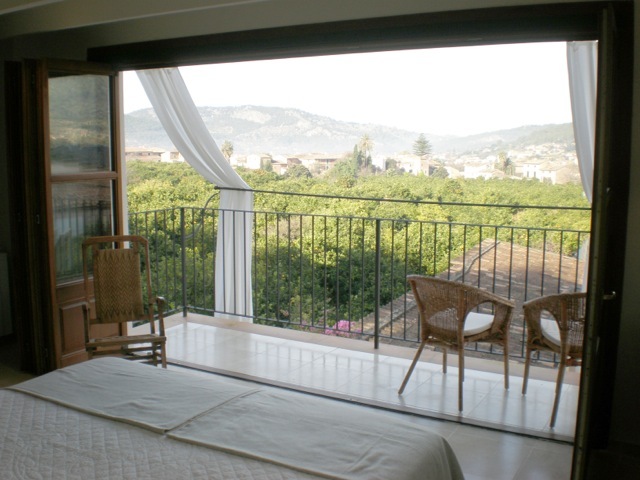 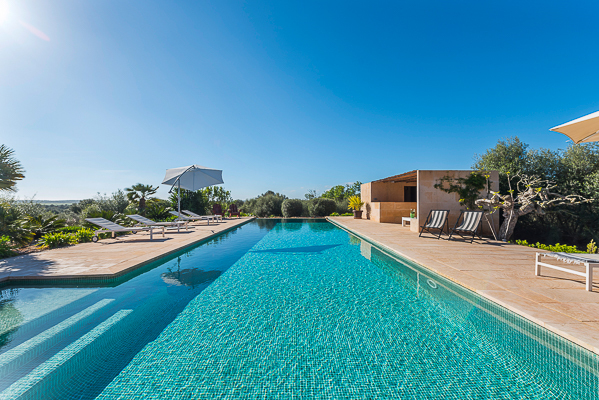 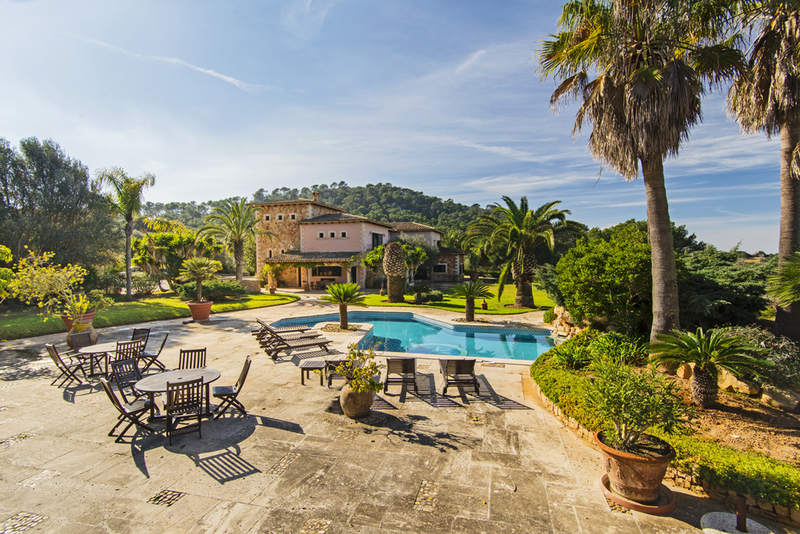 Enjoy the view over the garden and pool to the village Santanyi. 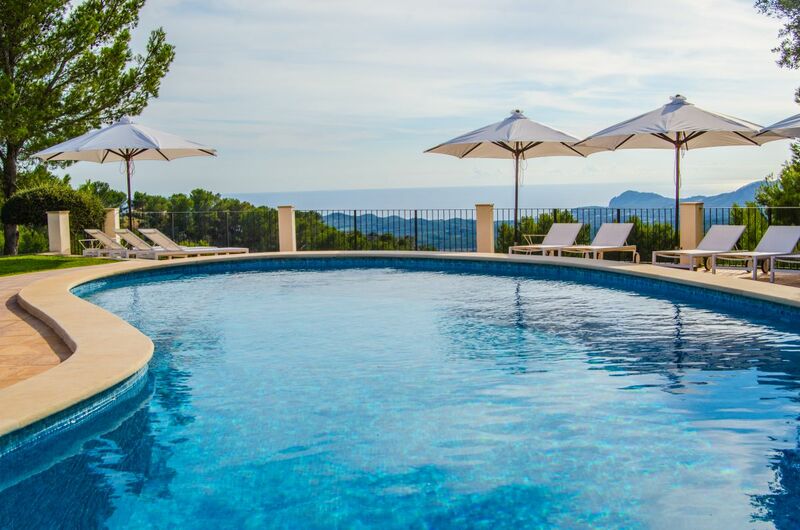 At the pool there is a day bed for some relaxing moments. 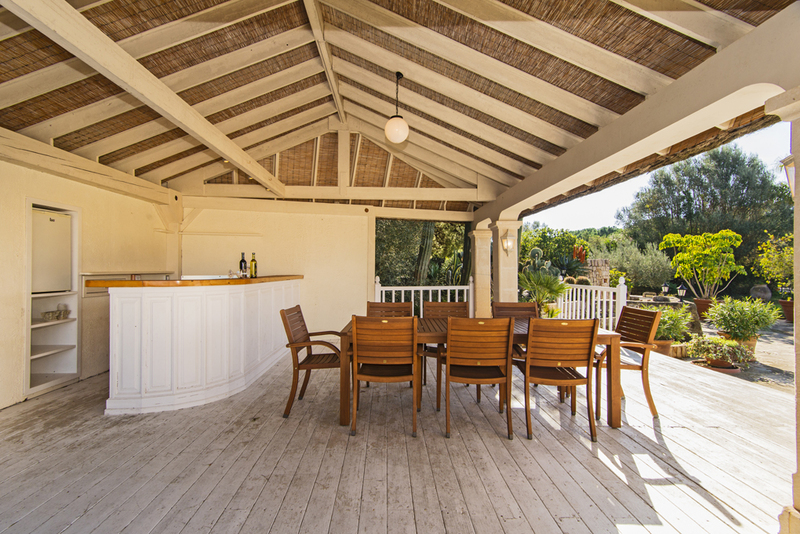 There is also a covered terrace with seats and a grill. 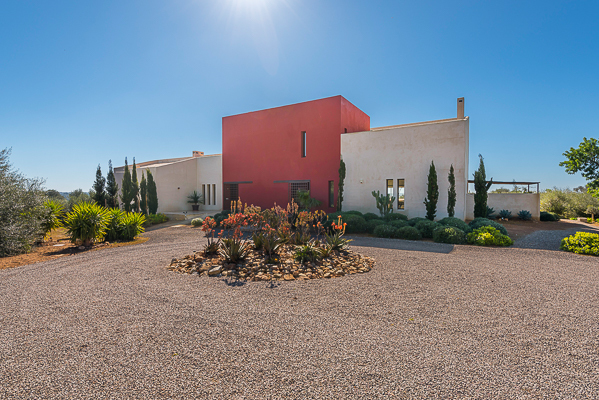 This elegant newly build Finca is situated on a small hill above the picturesque village Alqueria Blanca and offers a magnificent view over the coast till the island of Cabrera. 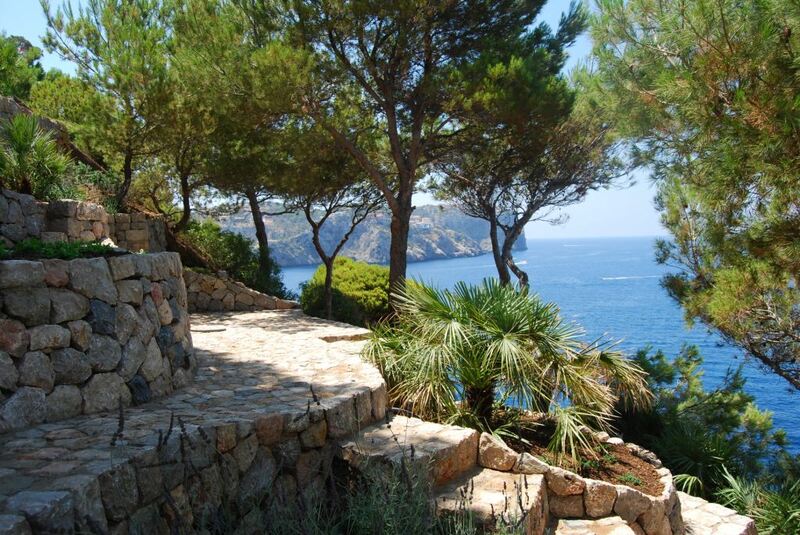 Also, the natural park of Cala Mondrago with it´s beautiful sand beaches can be reached within a short drive by car. 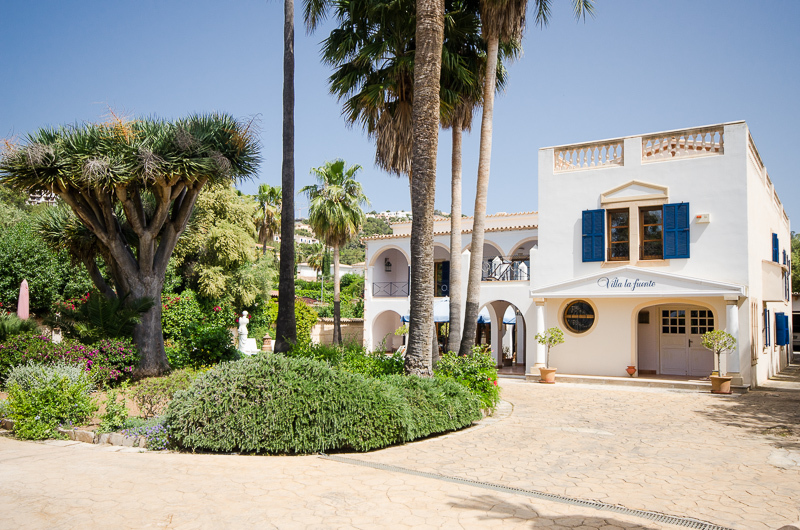 For the physical well-being, as well Alqueria Blanca as the small Fischer village Porto Petro are offering several nice restaurants. 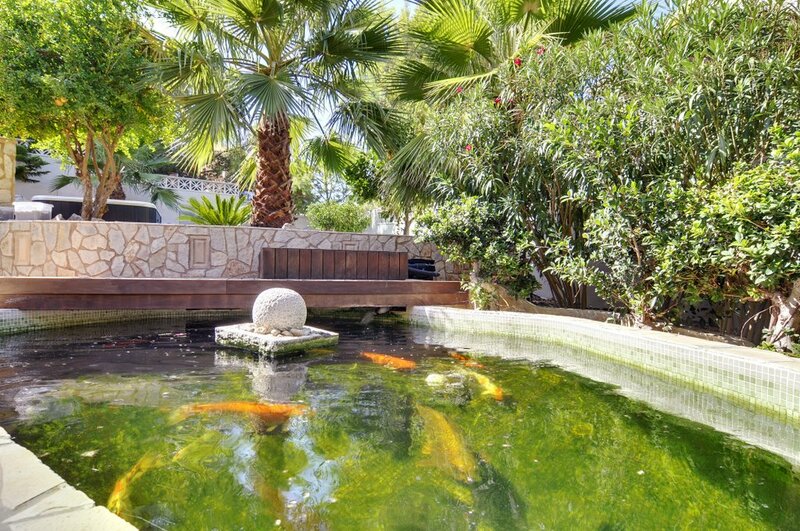 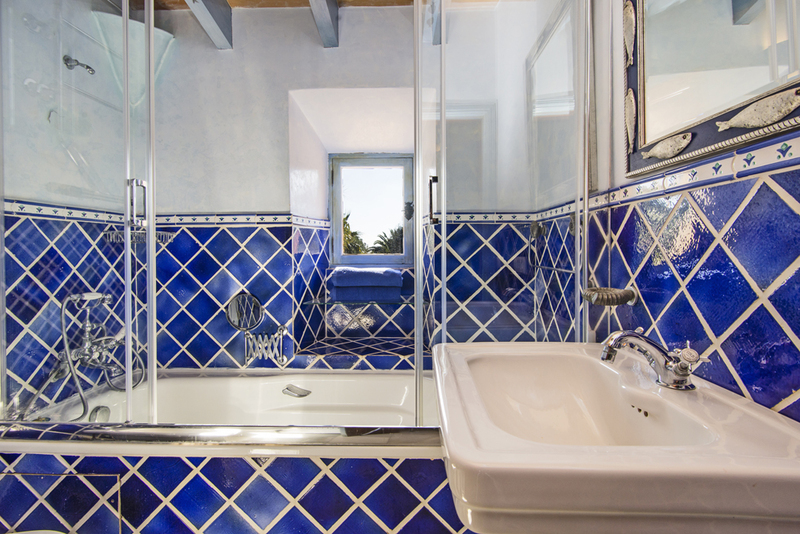 Located 5 minutes outside of Llucmajor, this villa is situated in an ideal area for many activities. 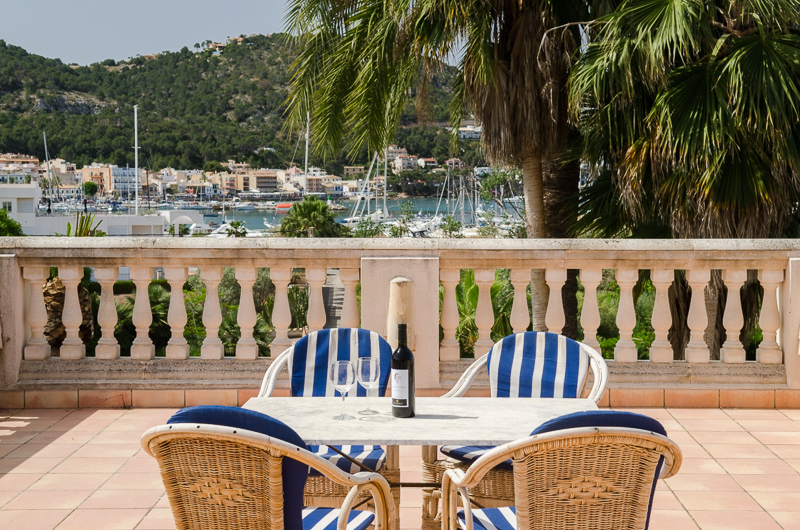 Whether hiking to the monastery, bike rides, beach visits or a shopping day in Palma (25 minutes by car), here are no wishes unfulfilled. 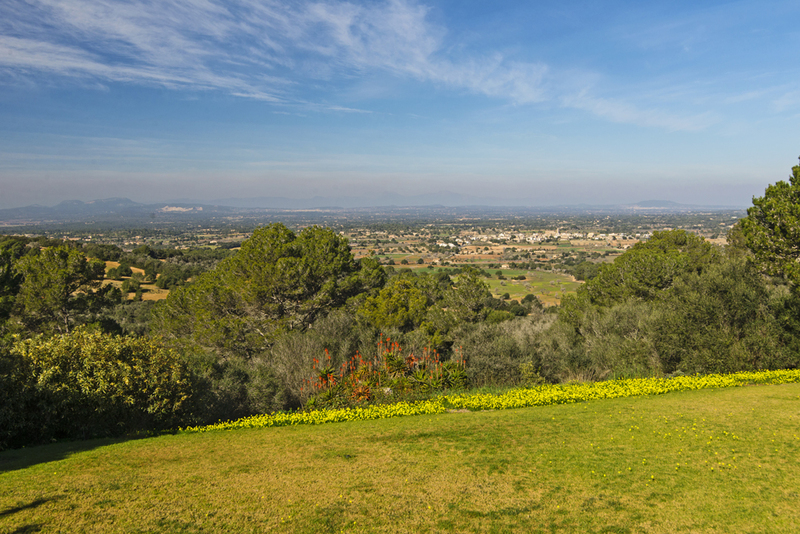 Golf enthusiasts can enjoy their passion at the nearby Son Antem, Son Gual and Majoris golf courses. 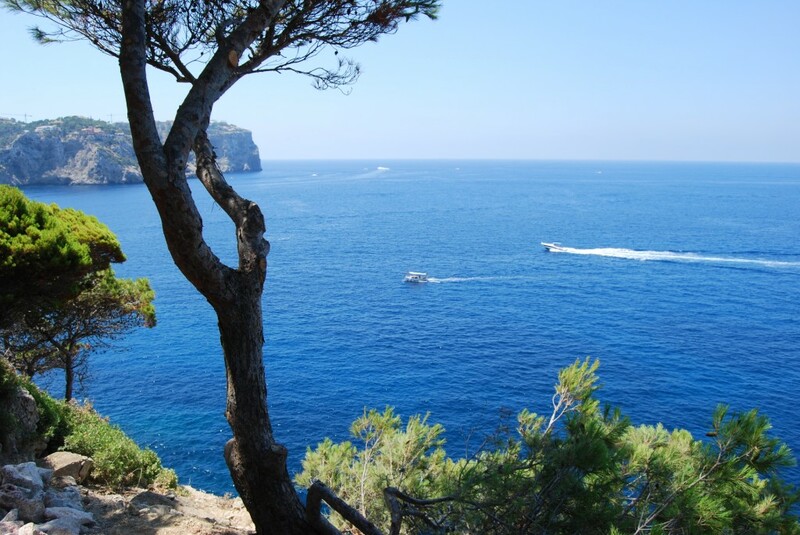 The airport can be reached in just 15 minutes by car. 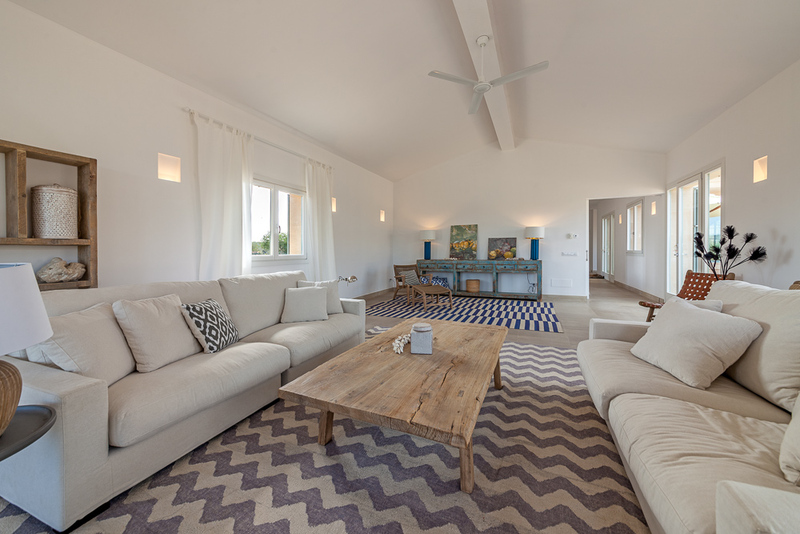 Awe-inspiring sea views from the lavishly appointed, sun-lit interior and the delightfully landscaped pool garden are characteristics of this spacious representative holiday home. 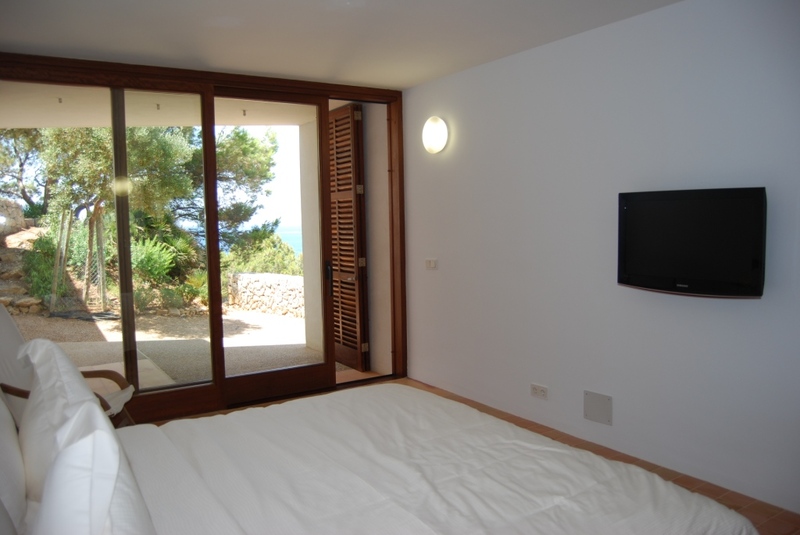 Telephone, ADSL and WLAN are provided, as well as a home theatre, DVD and beamer. 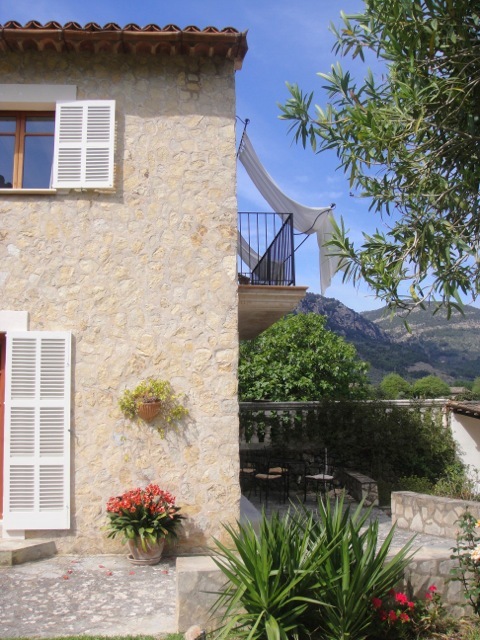 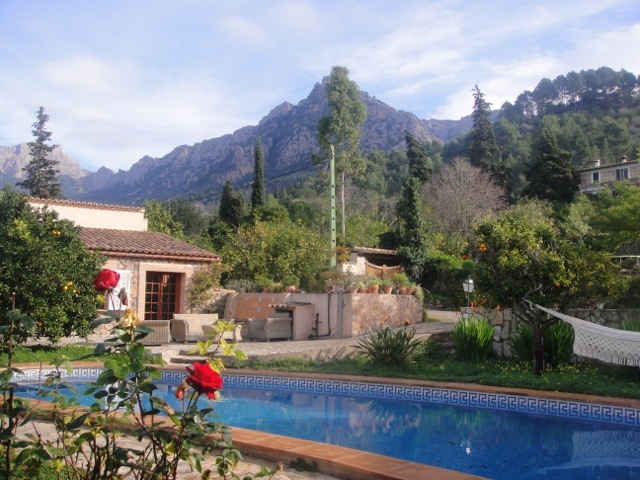 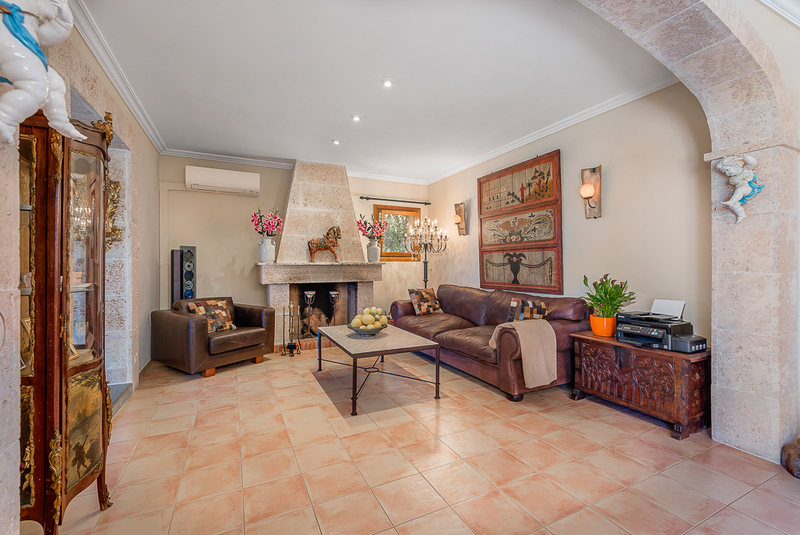 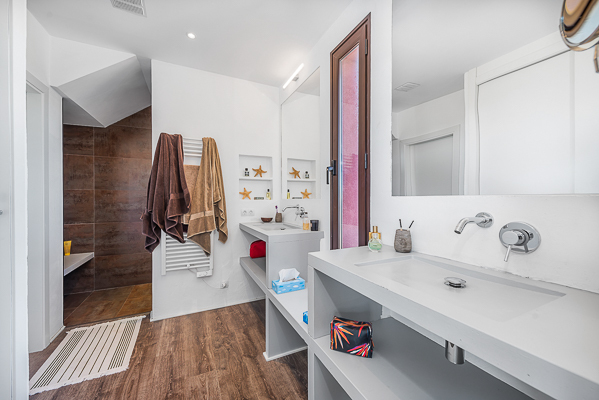 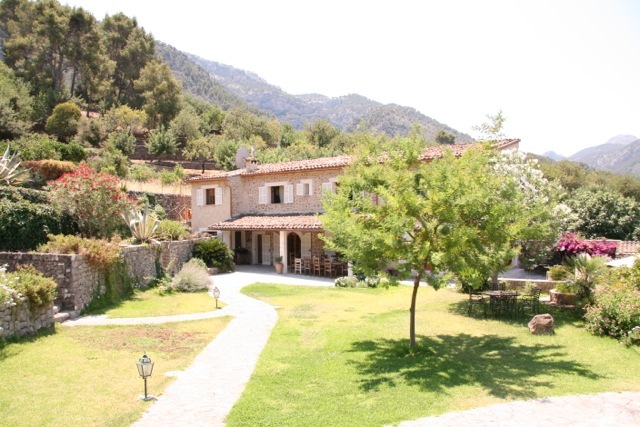 This treasure for leisure is perfect for guests seeking tranquillity and relaxing holidays off the beaten tracks, as well as the pleasures of walks and hikes in the indigenous, scenic coastal area of Tramuntana Mountains. 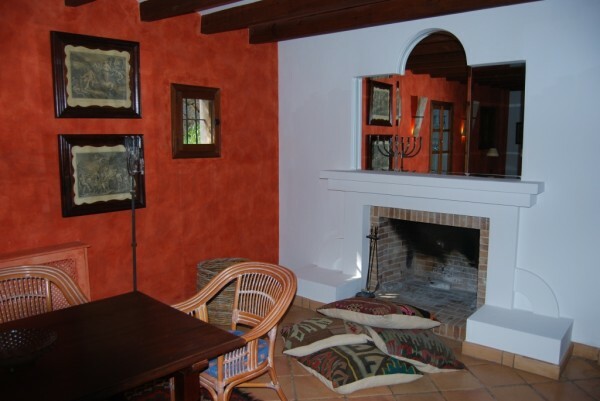 Finca Alegria with its romantic ambience and chill out areas within pur nature, orange and lime trees will make your stay magical. 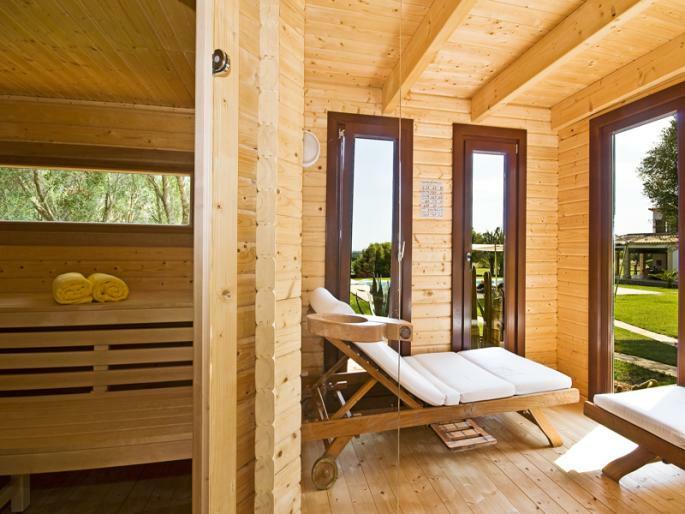 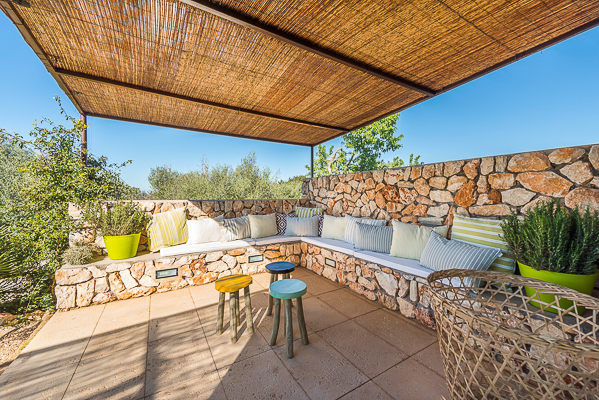 Enjoy small terrace hiding places the spacious pool, spend time in the hammock or relax in the sauna. 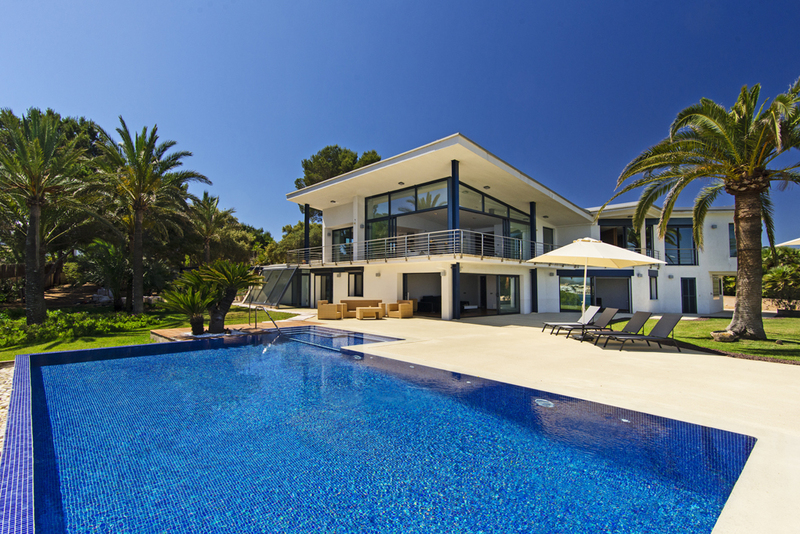 The pool area has a outdoor dinging place and a big roofed lounge in front of the living room offers a lot of privacy and ambience. 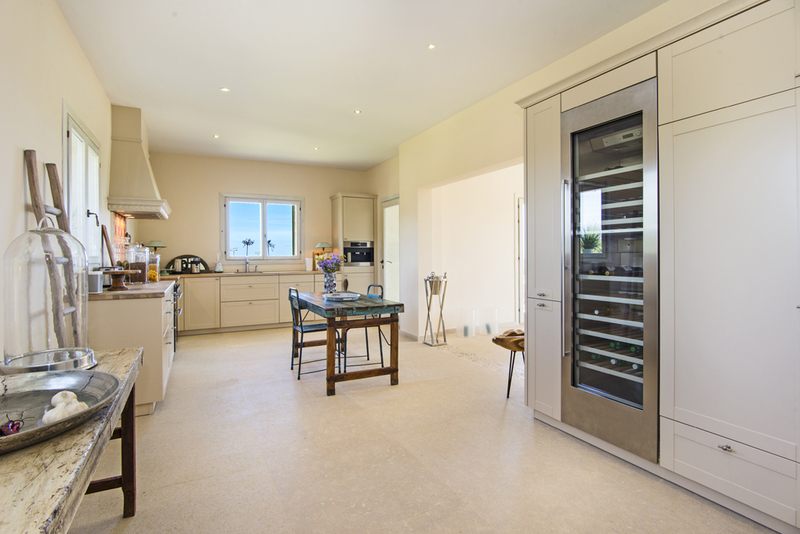 The floor heating has a cooling system during summer. 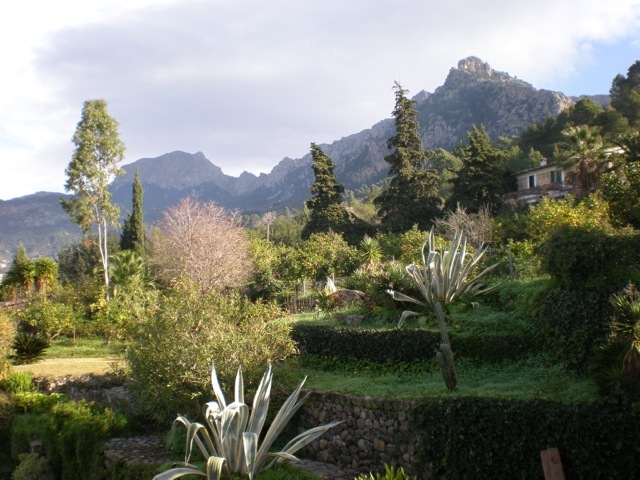 The plot is huge and has its own little paths. 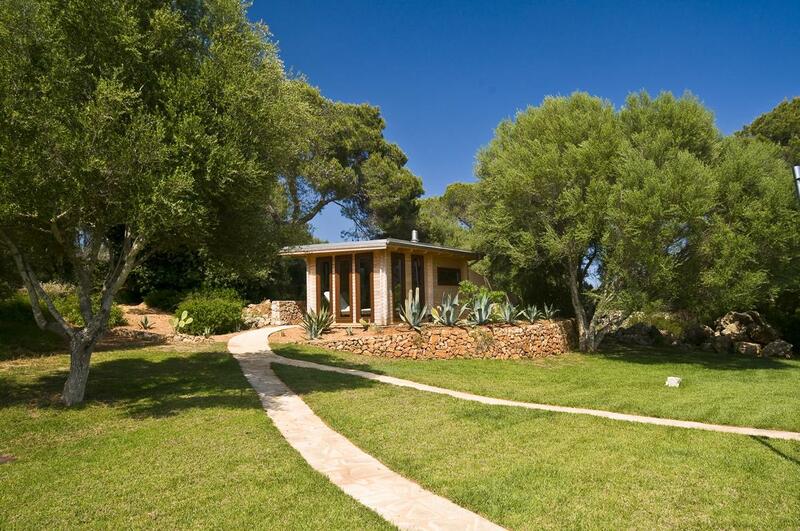 Total privacy within pure nature and yet, the next lifely town is just a few minutes by car away. 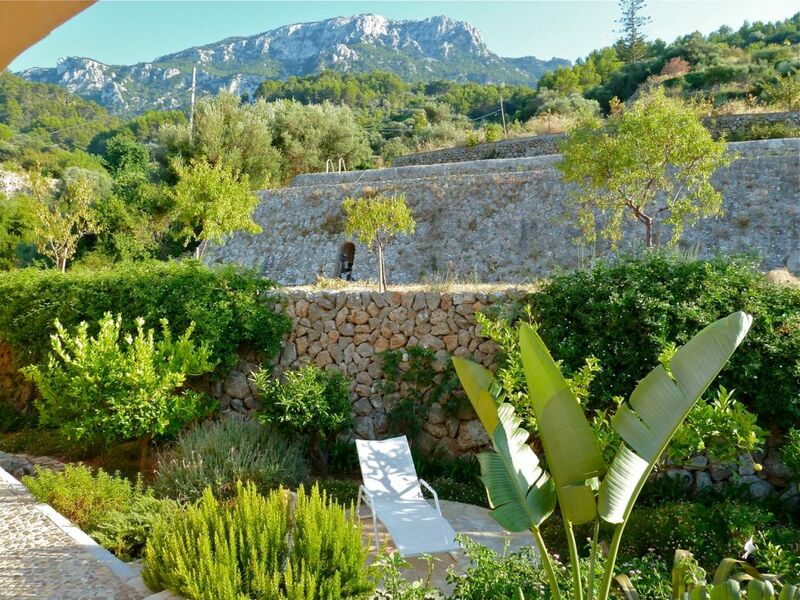 Spectacular views of the sea and the breathtaking landscapes of the Tramuntana mountains enchant the visitors of beautiful Finca Alconassar. 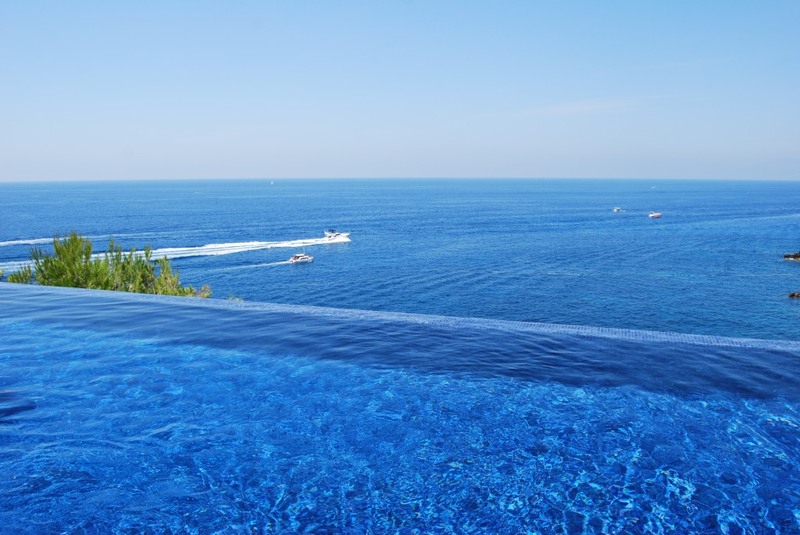 The expansive terrace space and an infinity pool overlooking the deep blue sea create an oasis of unsurpassed beauty, privacy and relaxation.The magnificent sunsets are awe-inspiring. 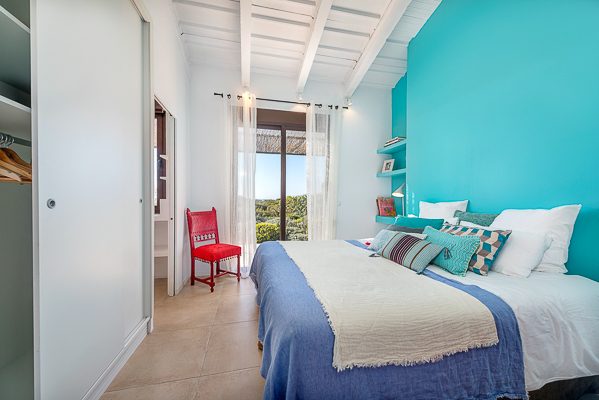 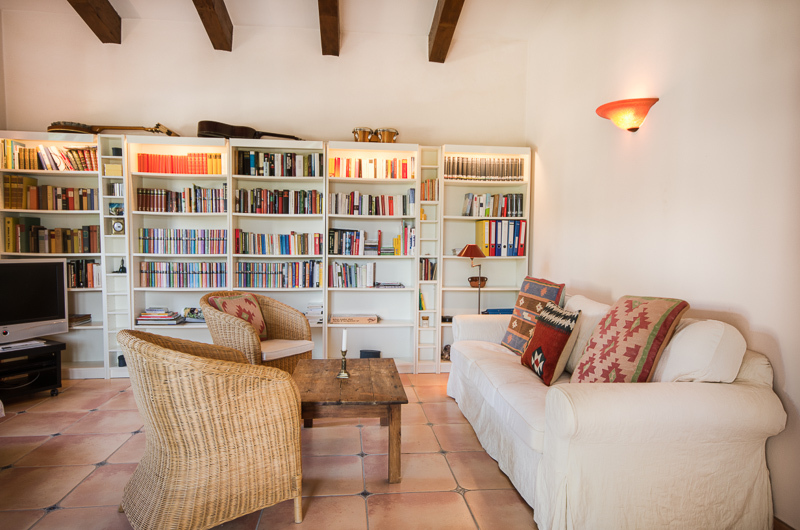 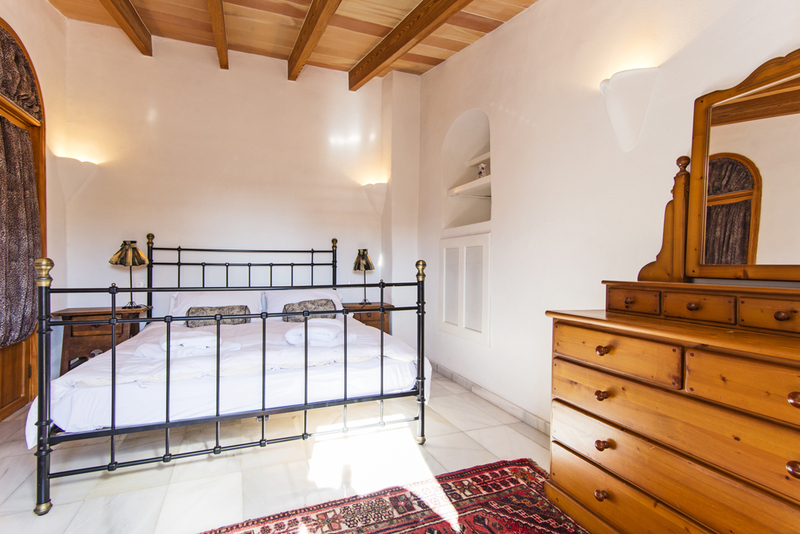 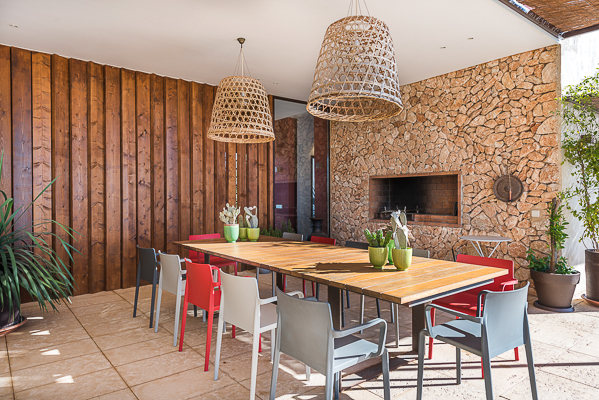 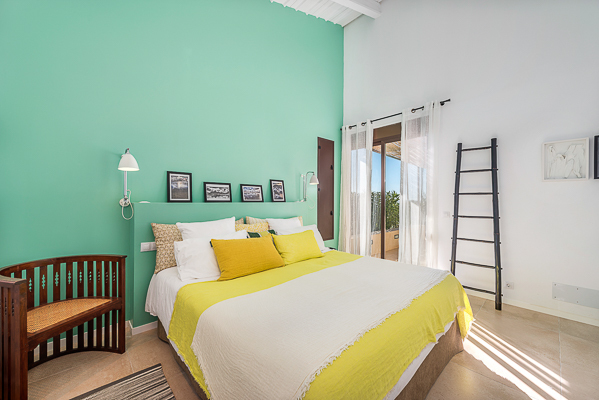 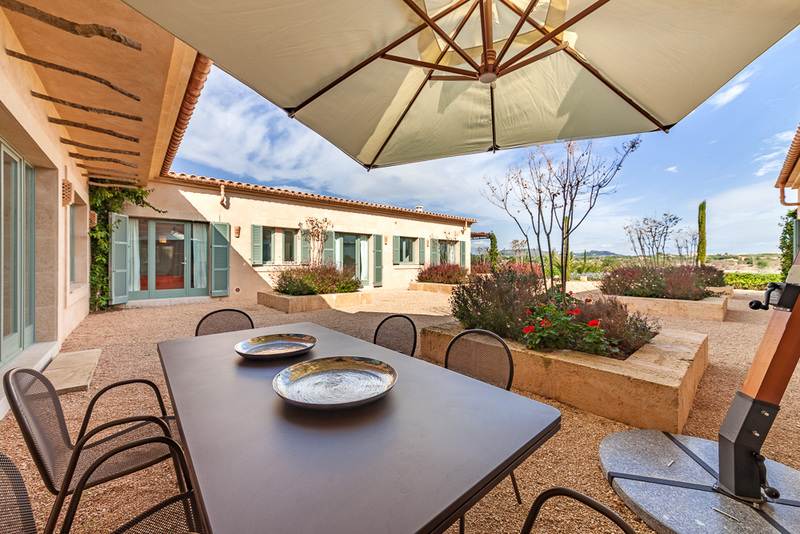 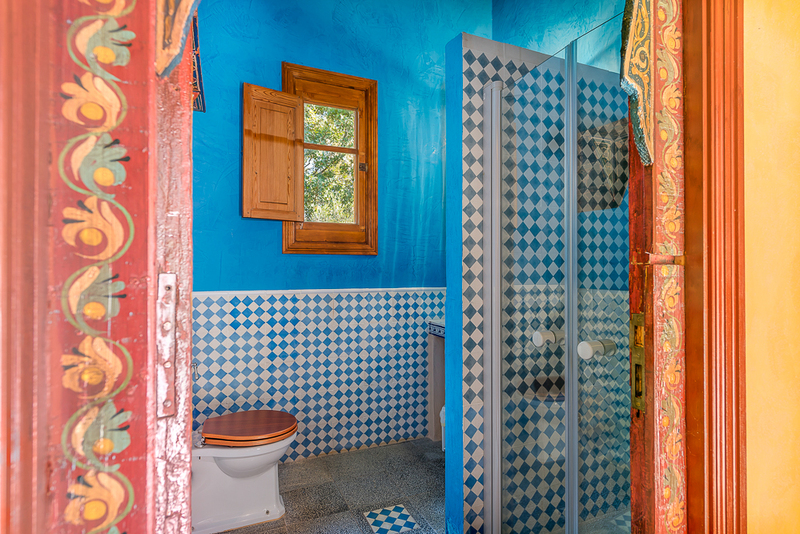 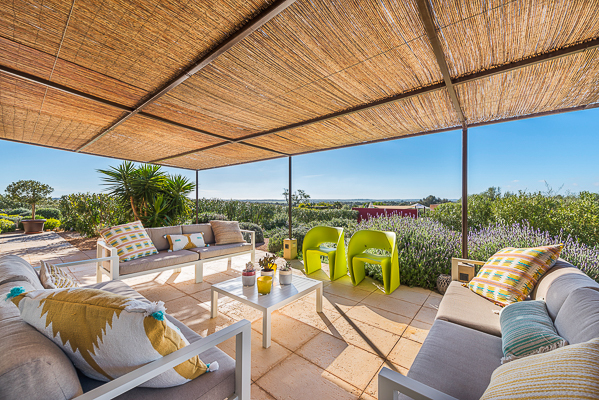 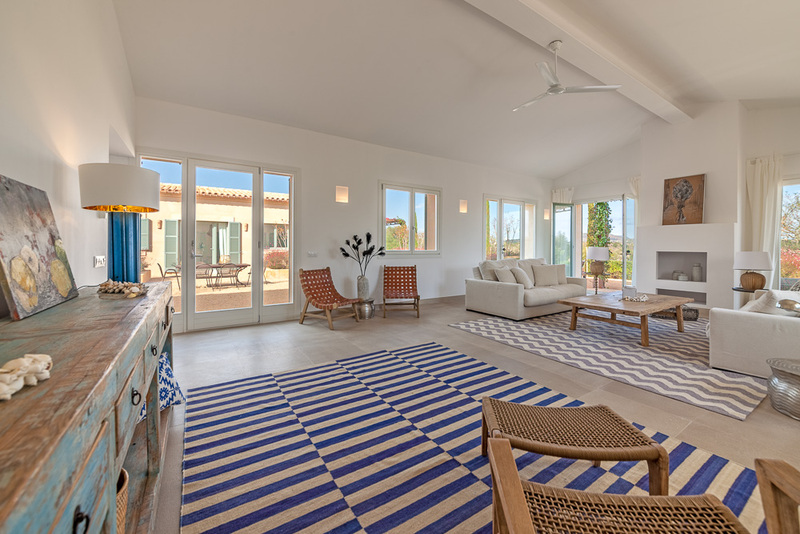 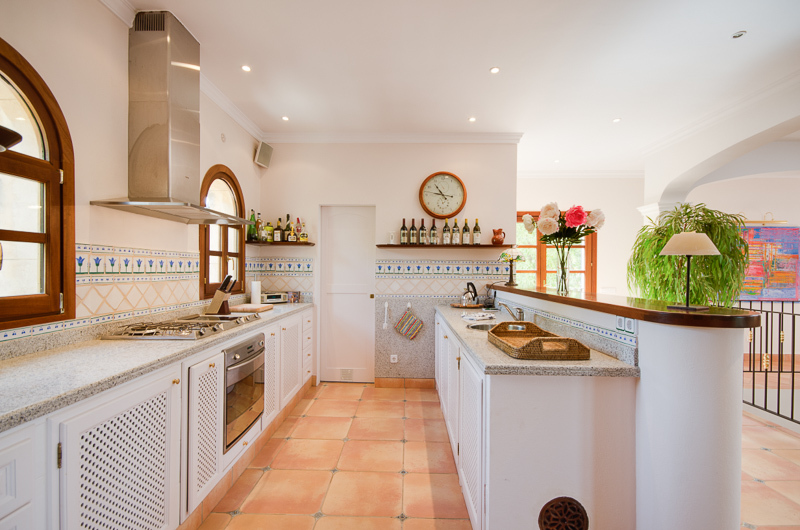 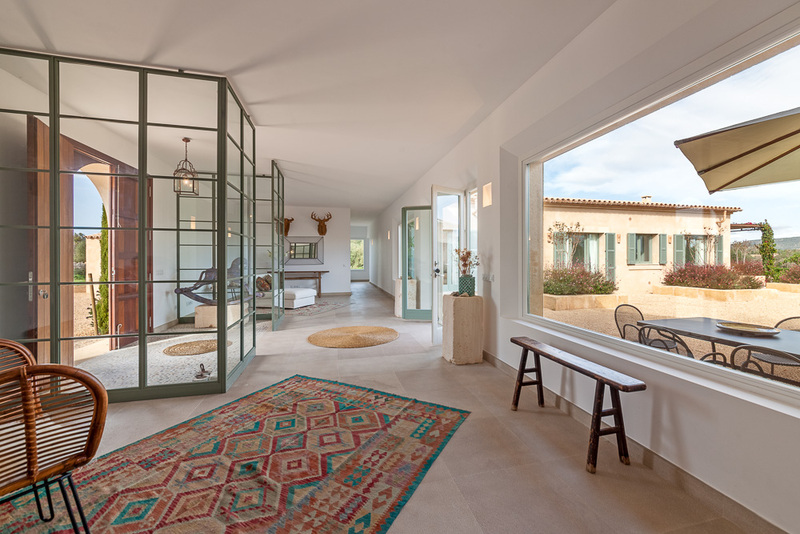 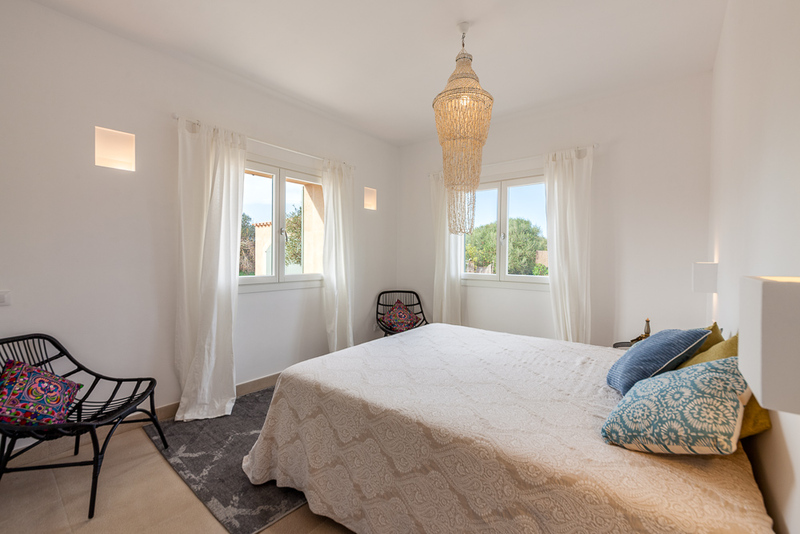 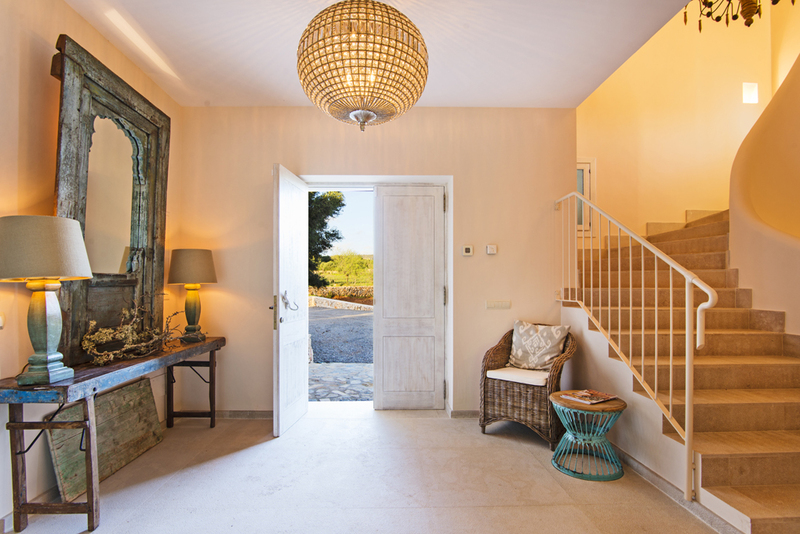 Inside the totally renovated finca boasts delightful open plan entertainment areas, high-quality, modern furniture and finishes and a most delightful Mediterranean ambience. 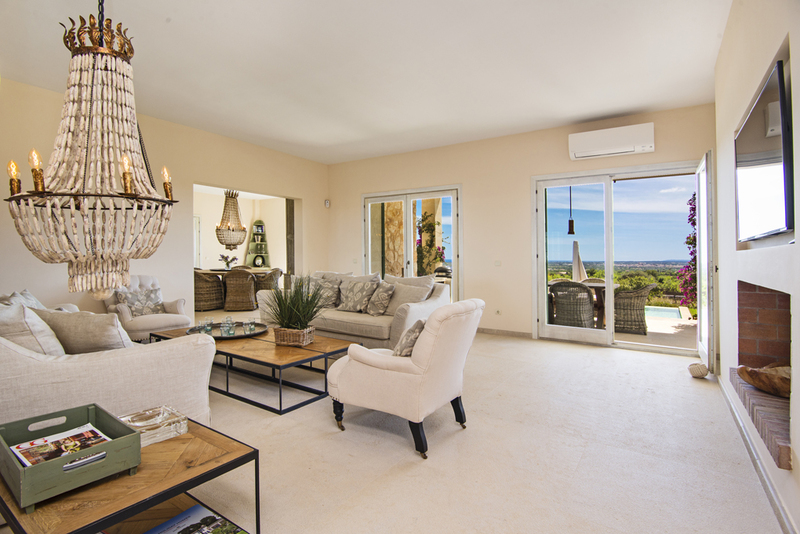 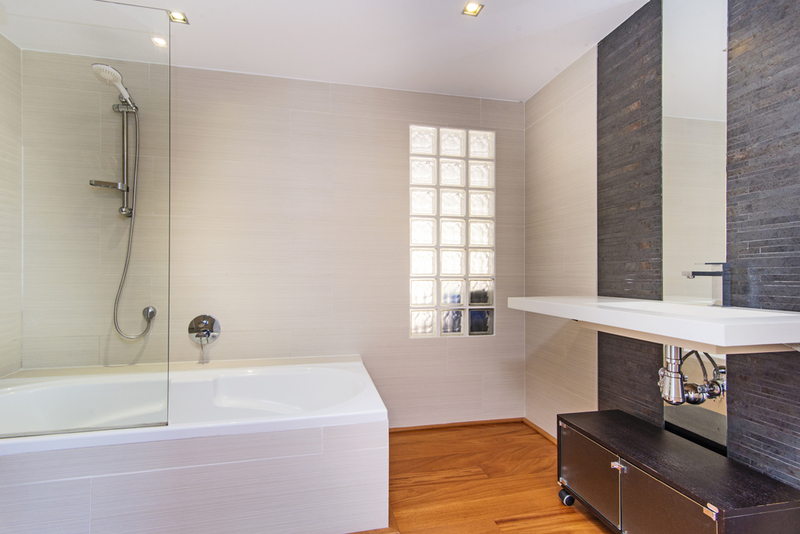 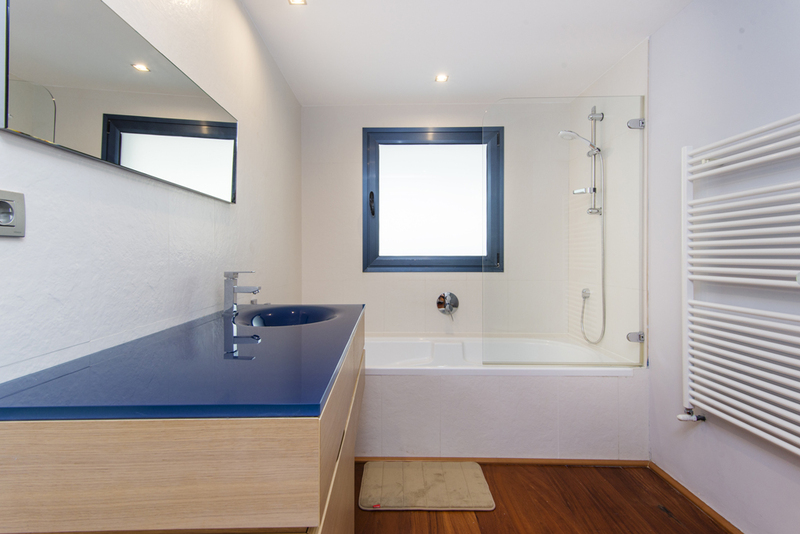 A modern cooling / heating system produces the desired room temperature at any time of the year. 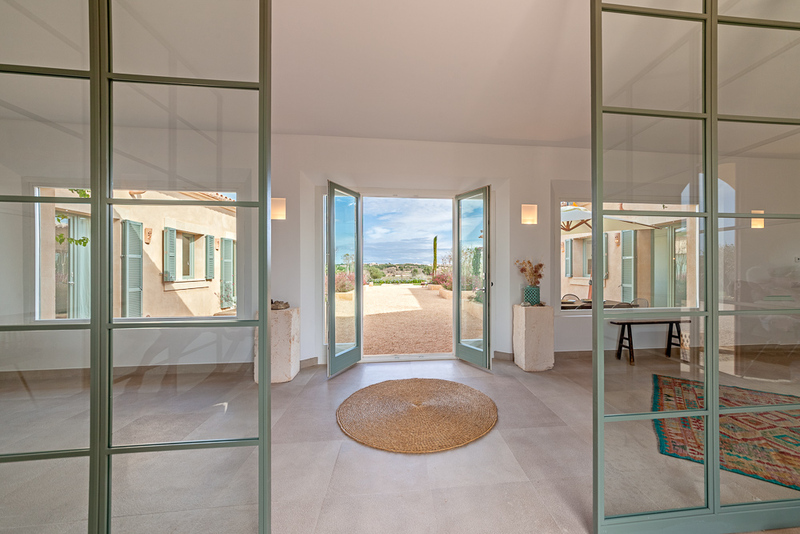 The representative stone Finca boasts a very appealing architecture, magnificently designed to capture the views from the moment you enter the front door, which in combination with high-quality finishing and tasteful furnishing creates a luxurious and Mediterranean ambience for discerning guests. 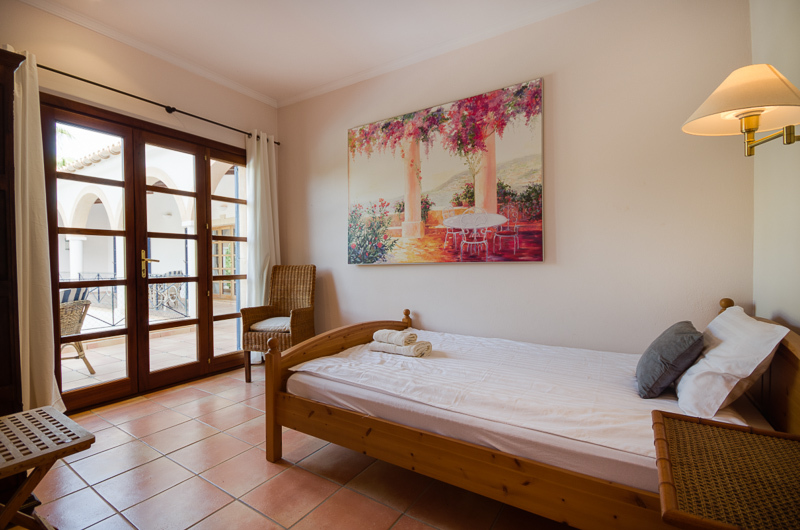 The proximity to the ocean and the convenient location close to several towns and seaside resorts allow for many options to spend pleasurable hours exploring the regional attractions and activities. 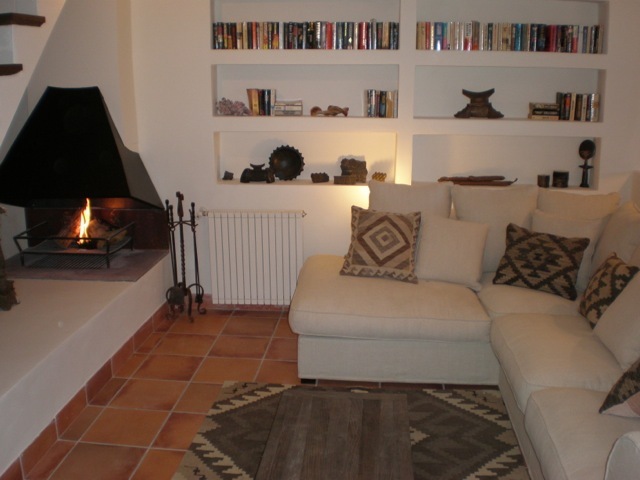 Underfloor heating/all rooms/winter season. 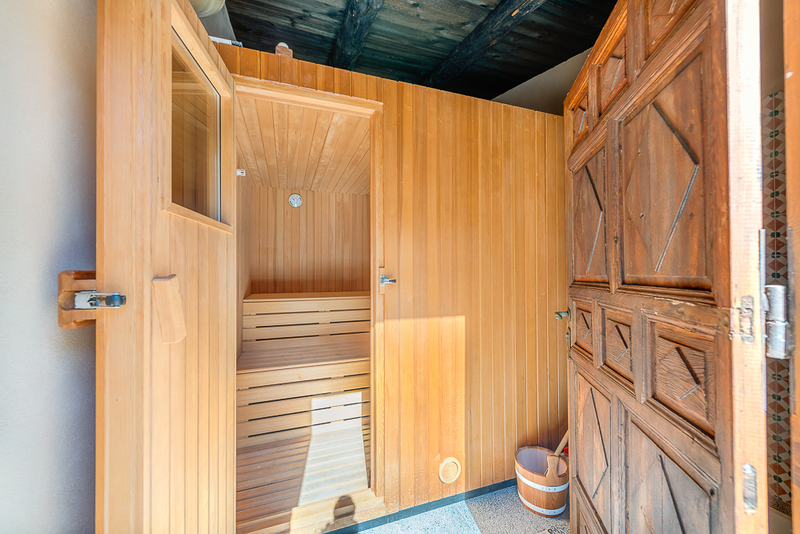 Bikes and sauna on request. 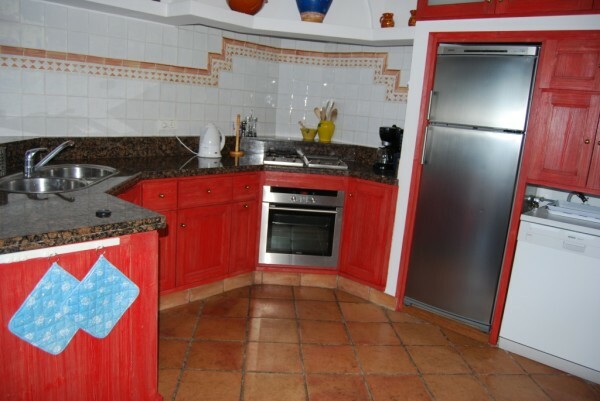 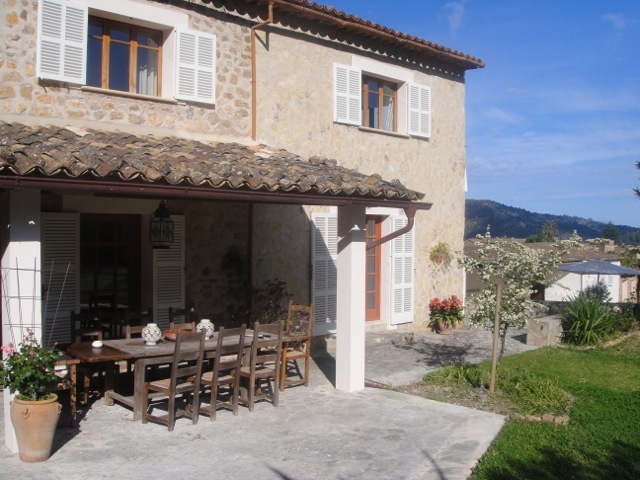 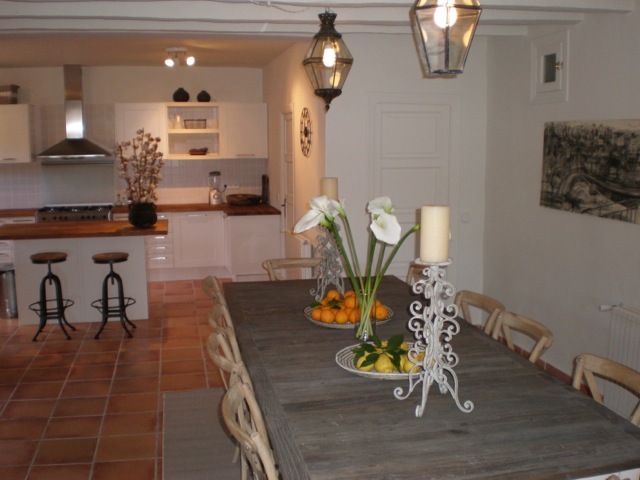 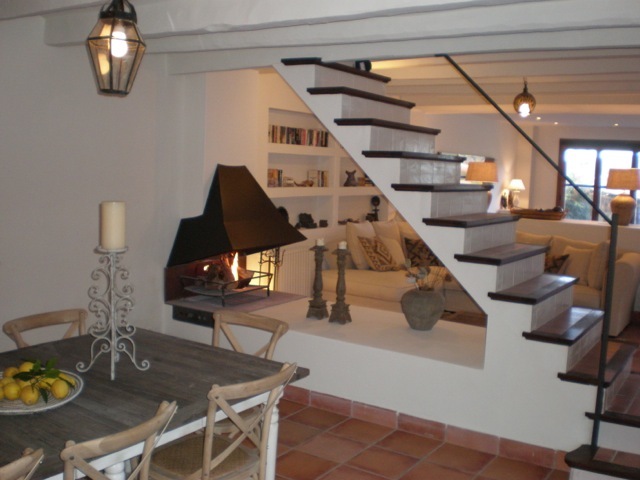 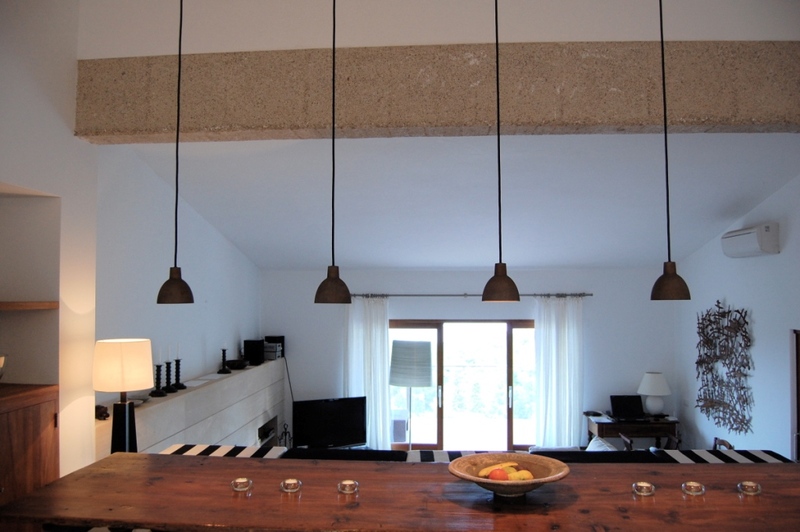 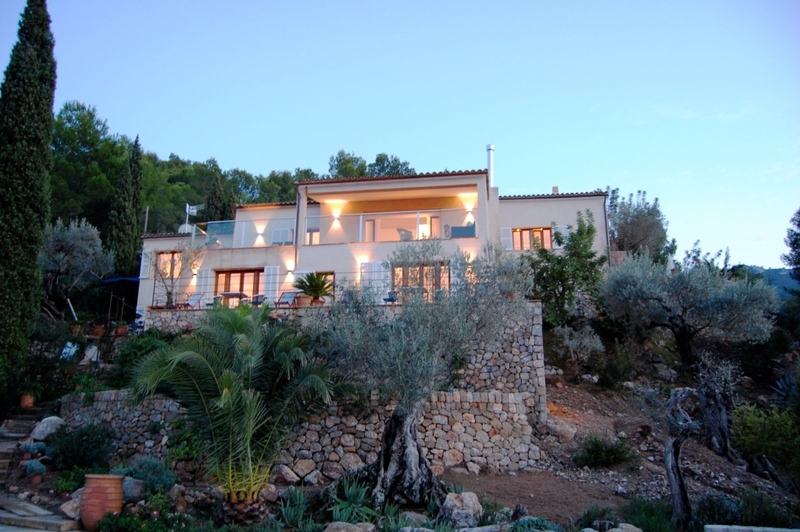 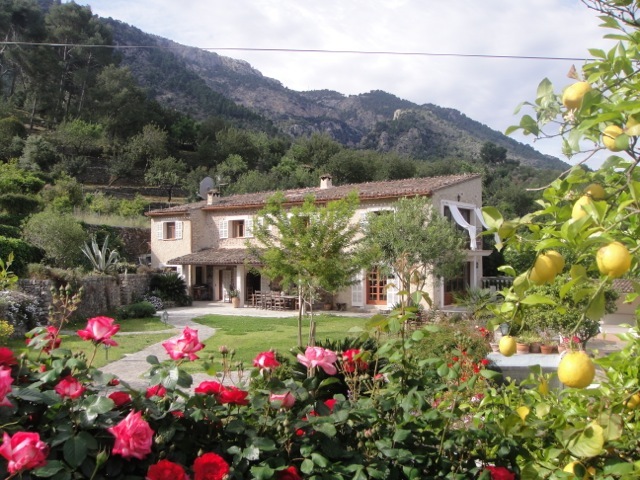 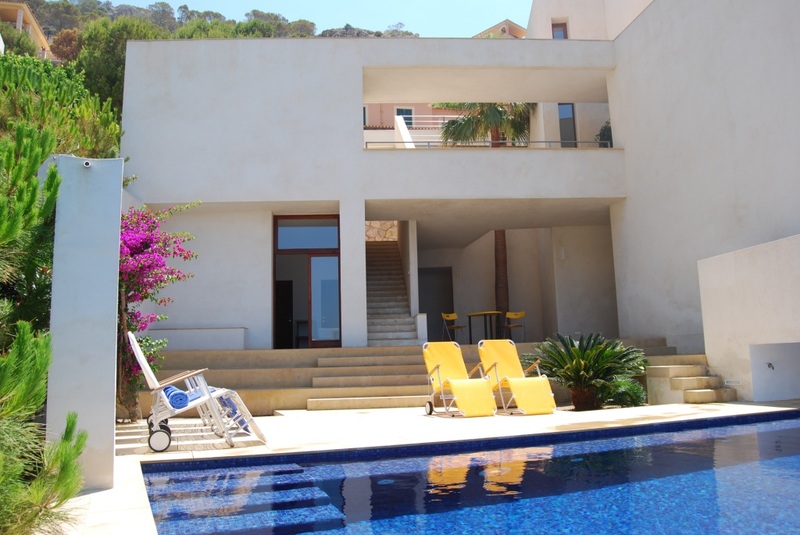 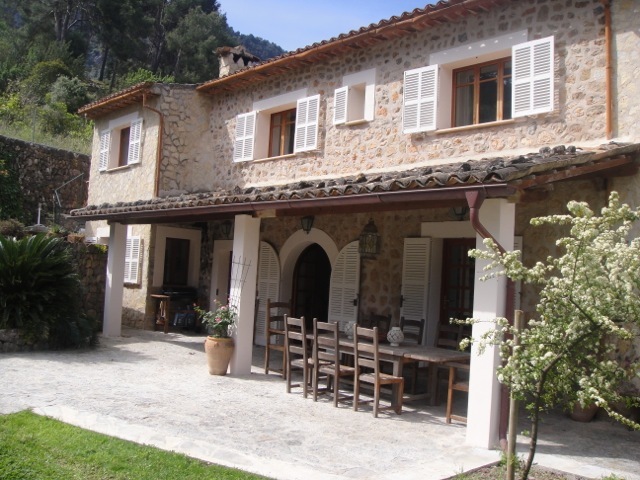 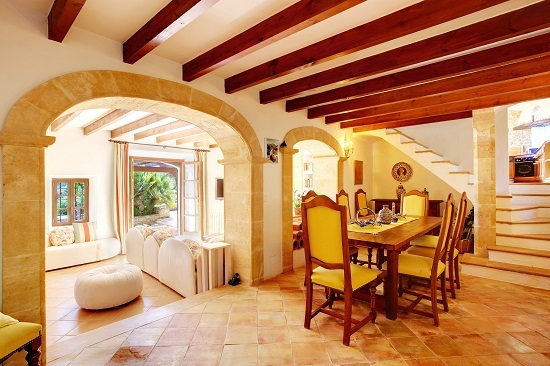 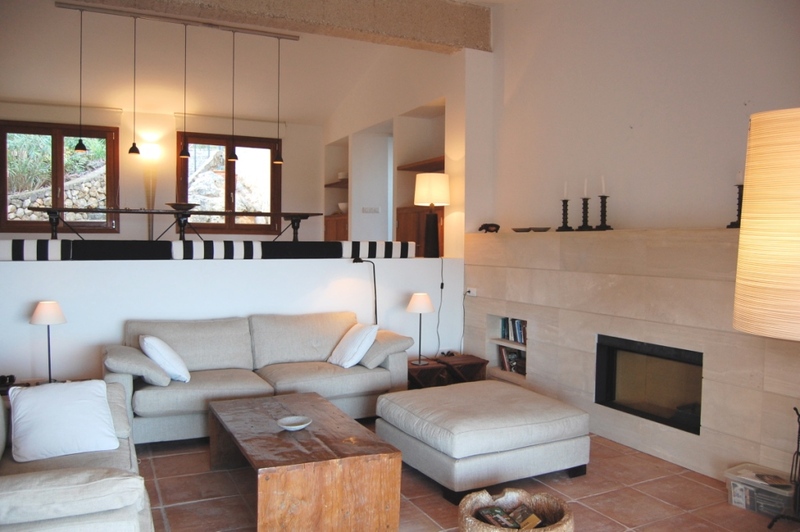 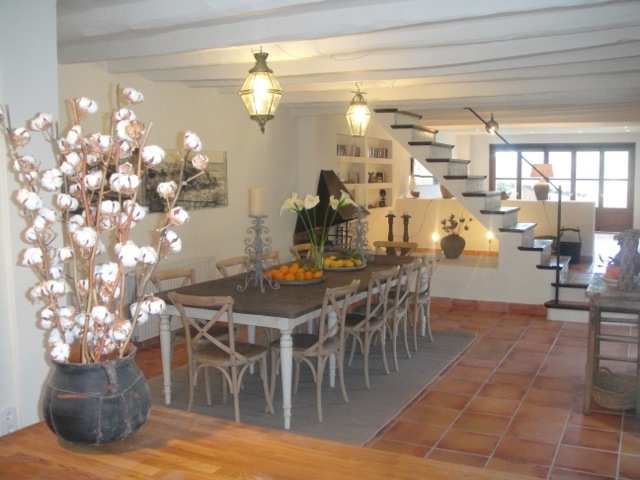 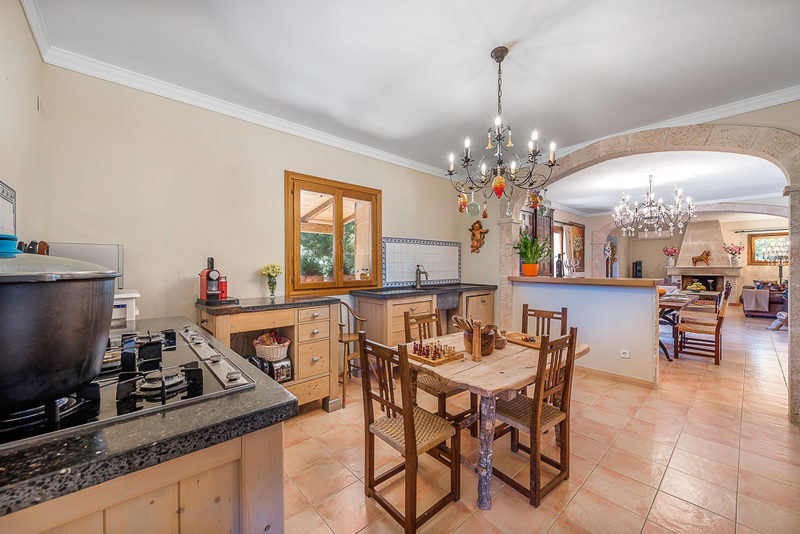 Villa Son Vida Blanca is a fantastic holiday home in a great location. 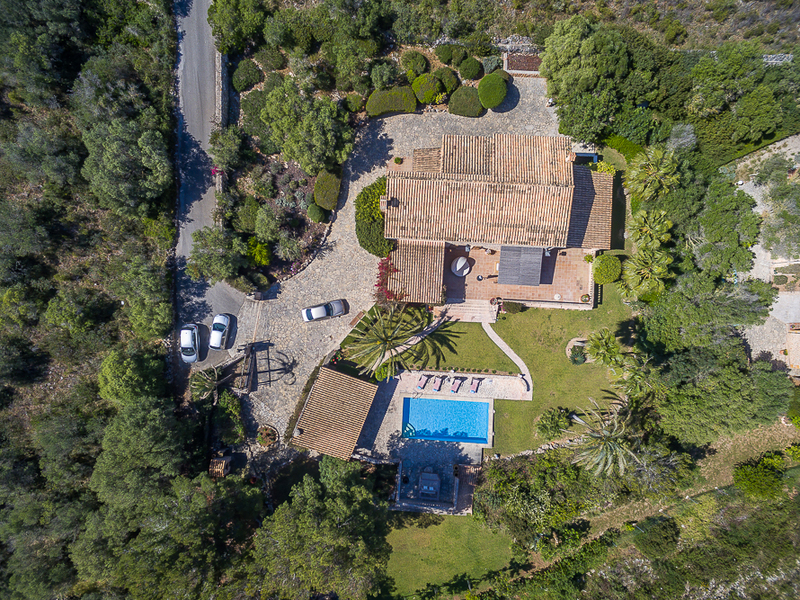 There are 3 golf courses in the immediate vicinity – and two 5 star hotels nearby offer fine restaurants or cocktail bars, a large SPA and a fitness center and tennis courts. 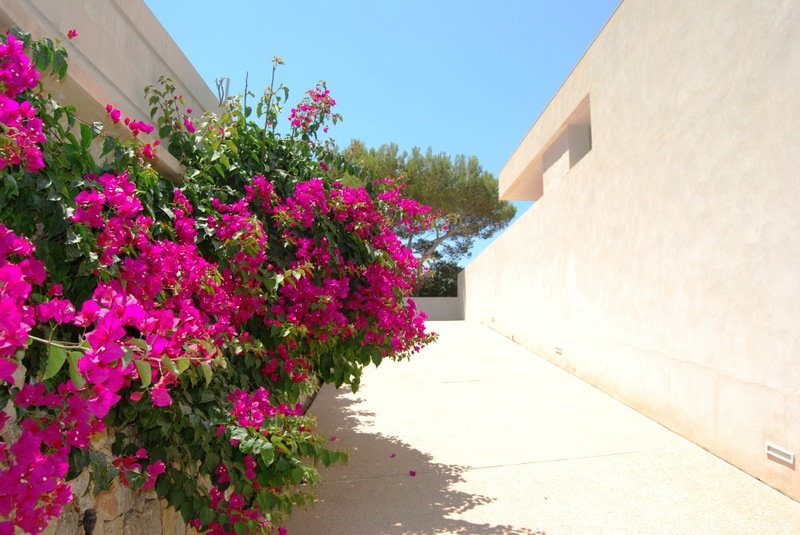 The access to the posh residential community Son Vida is monitored by a 24 hour security. 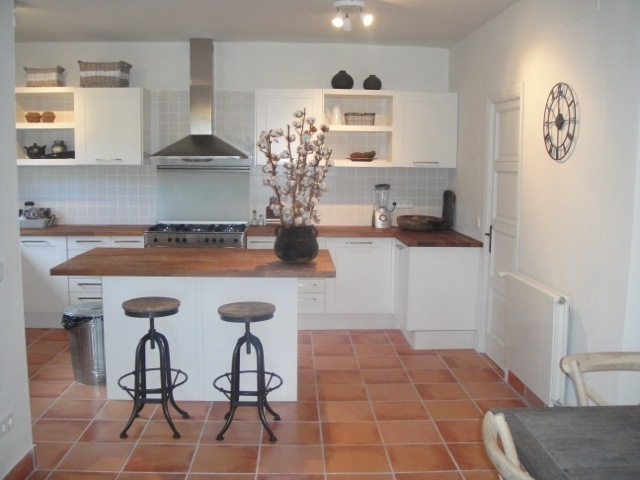 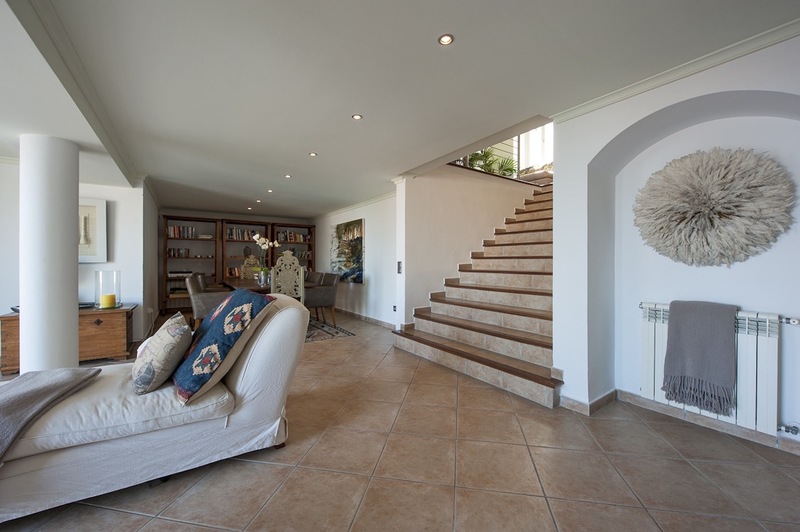 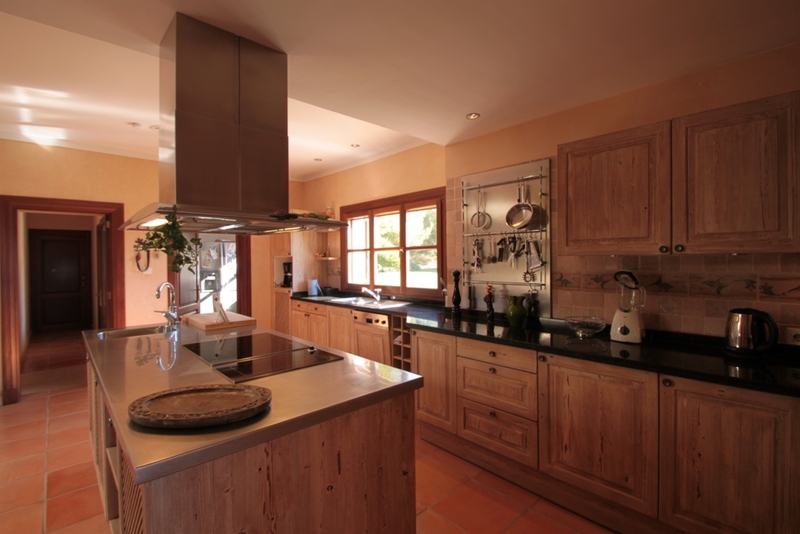 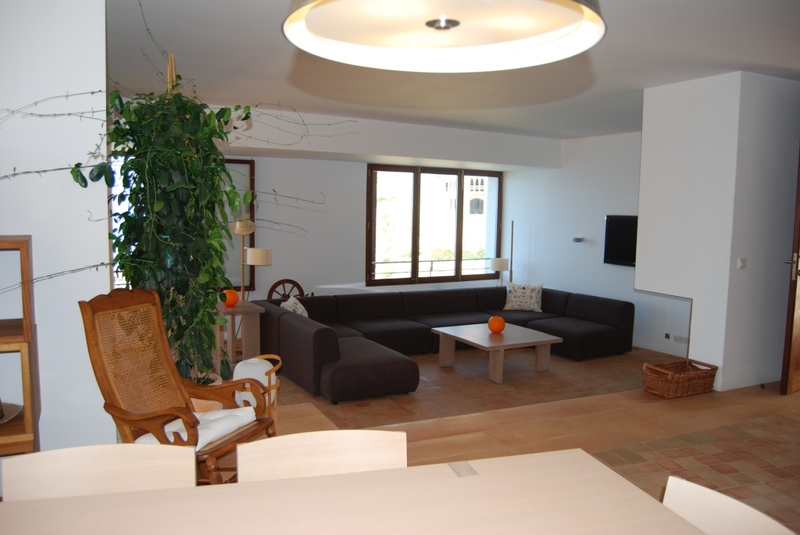 The representative luxury home rests peacefully on 15.000 m² garden grounds near Calonge. 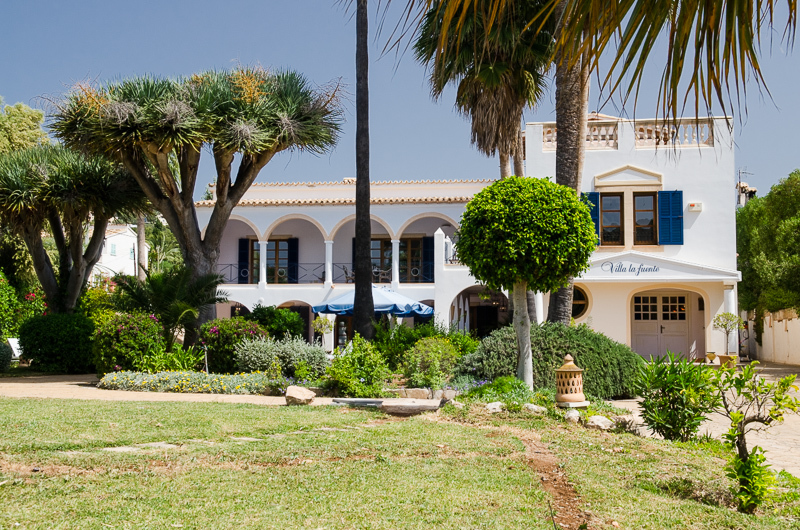 The quaint village with good shopping facilities and a choice of charming restaurants is just a couple of car minutes away. 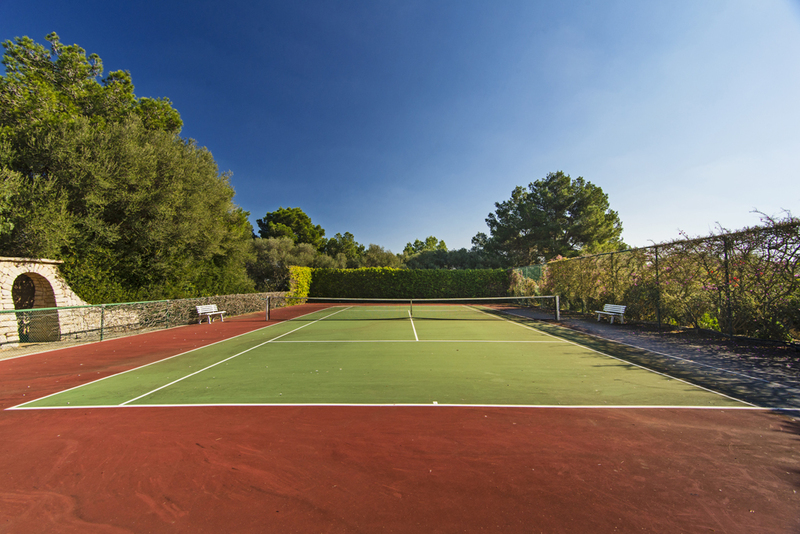 A tennis court and a golf club are also nearby. 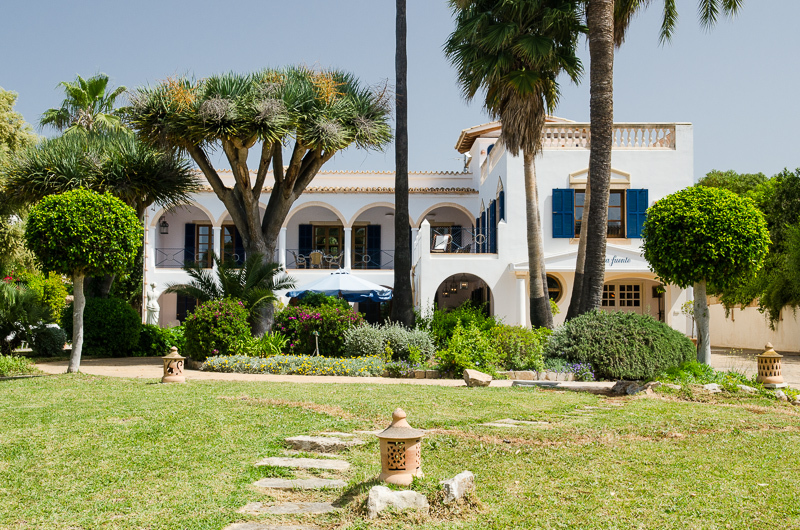 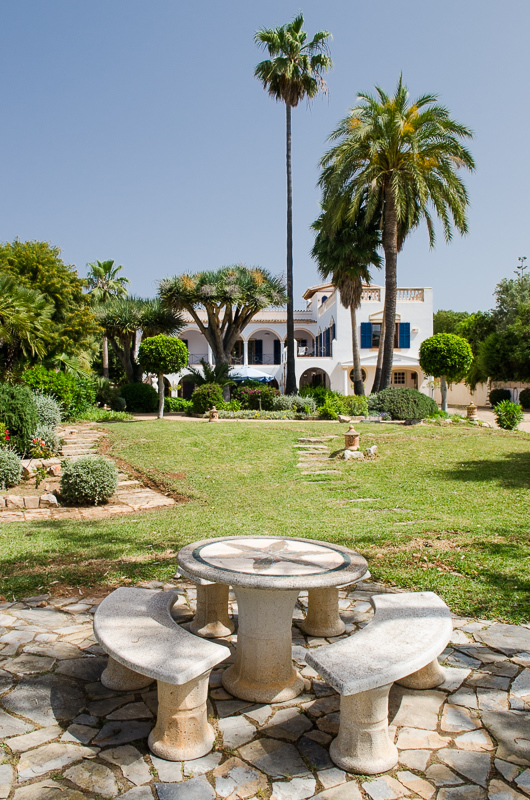 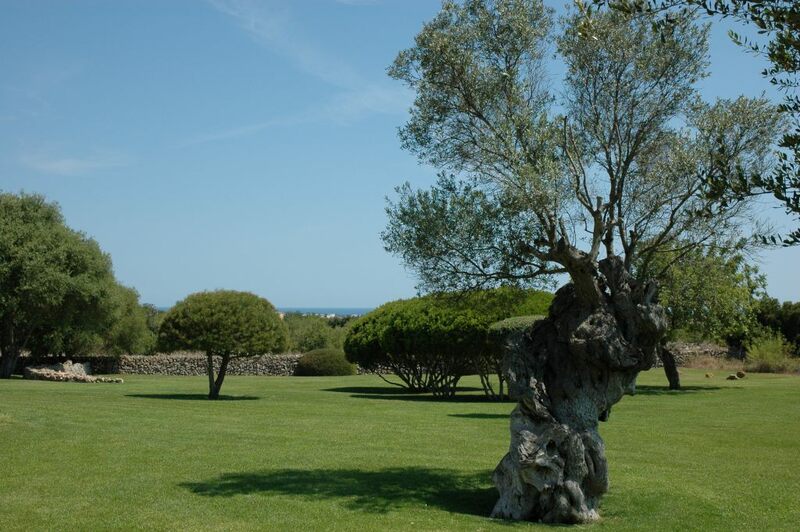 After passing the electrical entrance gates, a private driveway leads through the park-like garden with large lawns and Mediterranean plants up to the beautiful holiday home with picturesque tower. 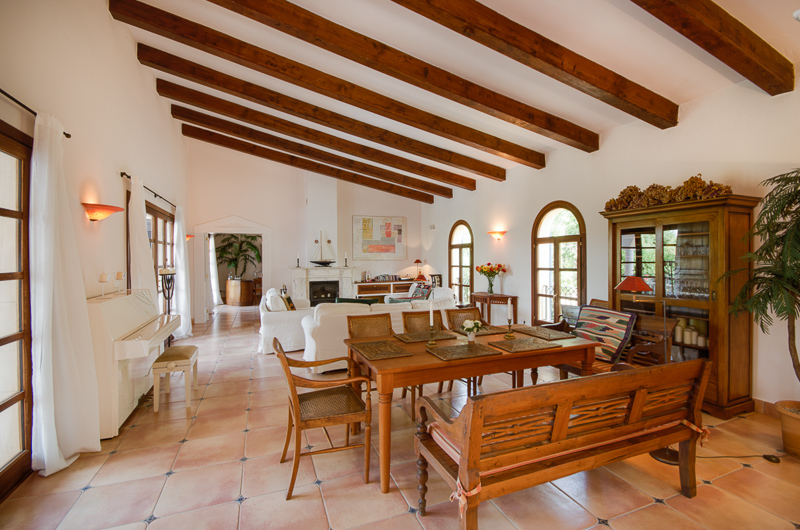 A representative reception hall with vaulted ceiling opens into a spacious, open-plan living and dining room with fireplace, library and direct access to the terrace and the pool garden. 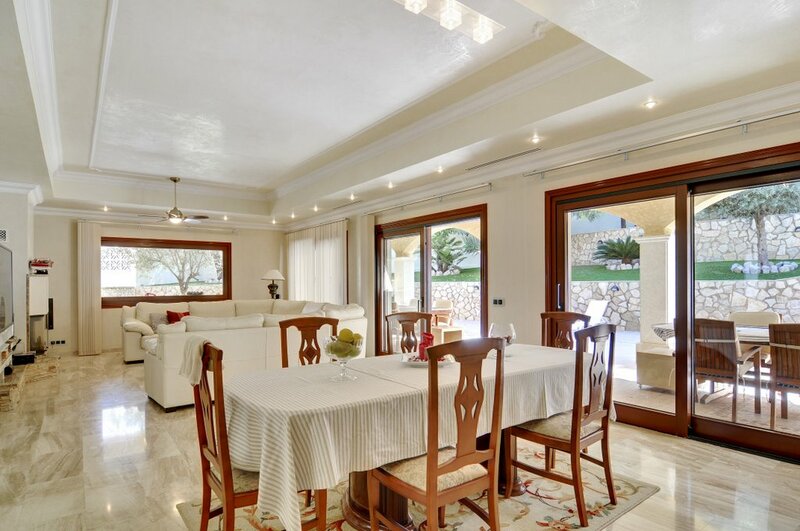 The patio is another attractive entertainment area, as the glass roof can be opened and closed electrically. 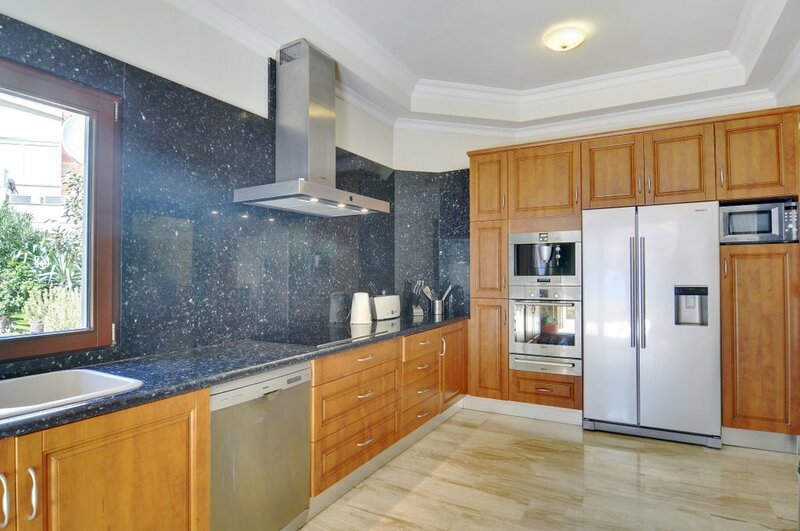 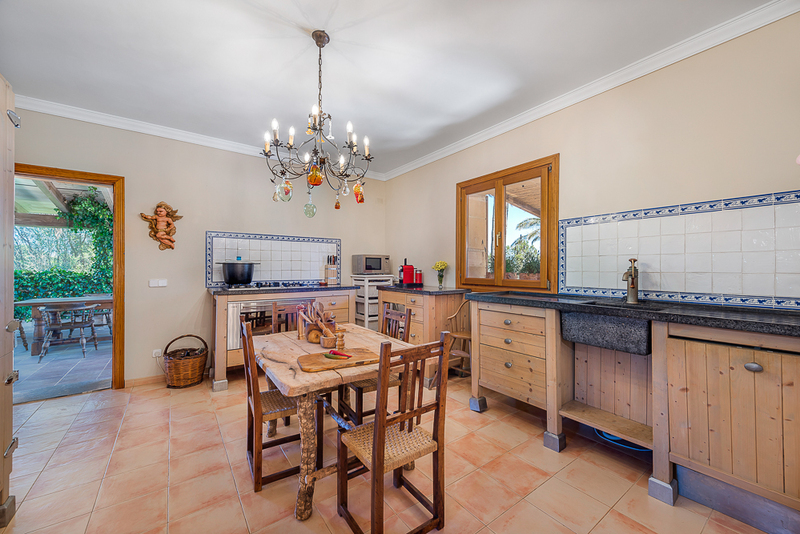 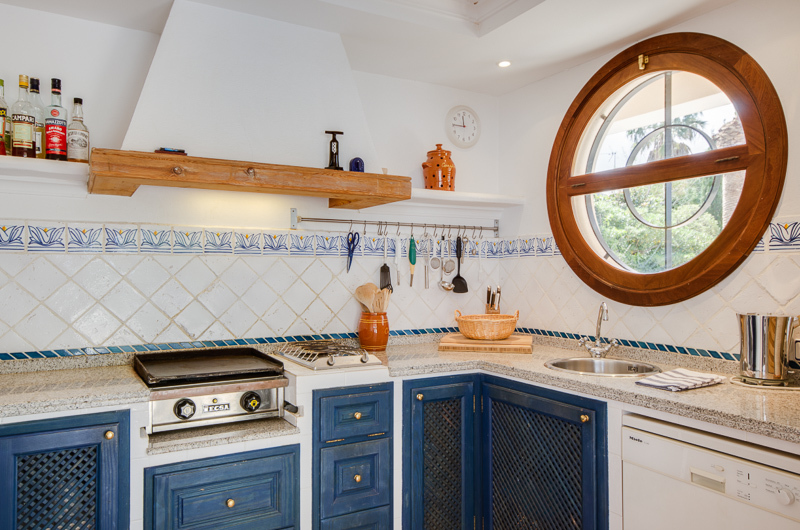 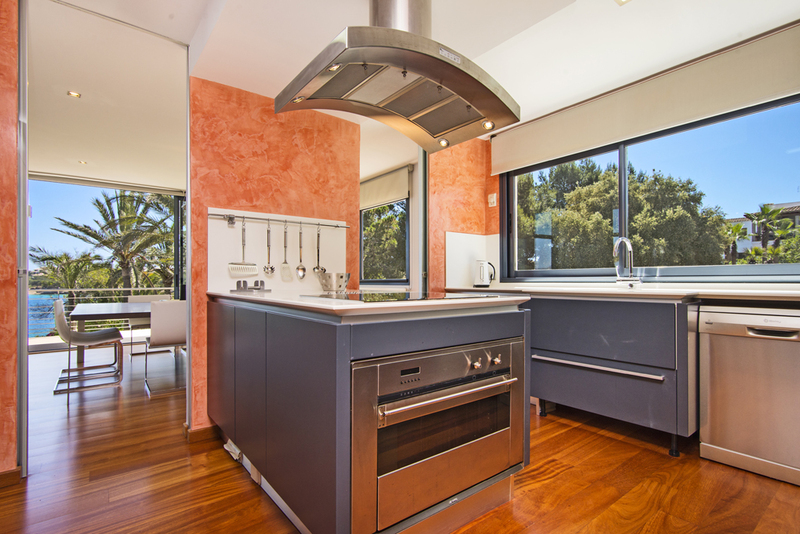 The kitchen is equipped with high quality Miele appliances, as well as the laundry room with washing machine and dryer. 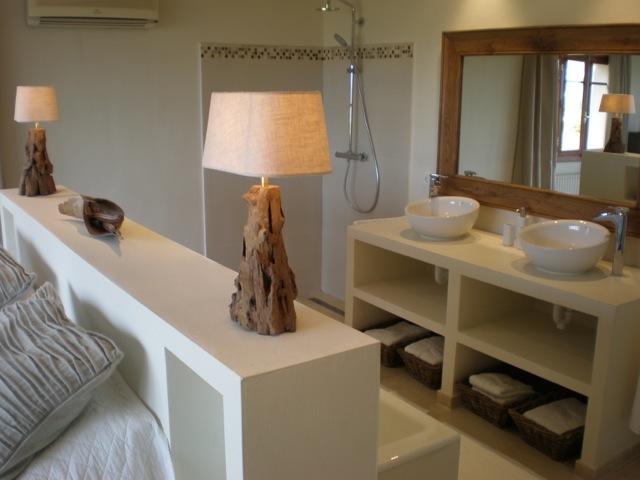 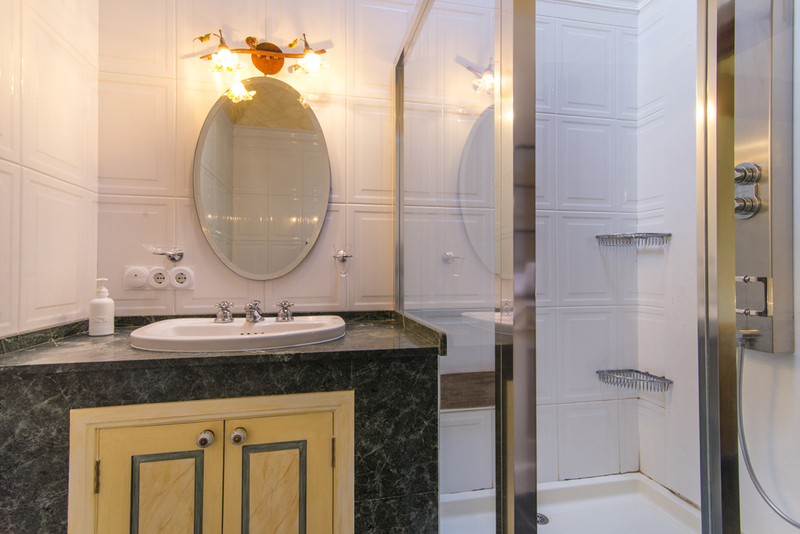 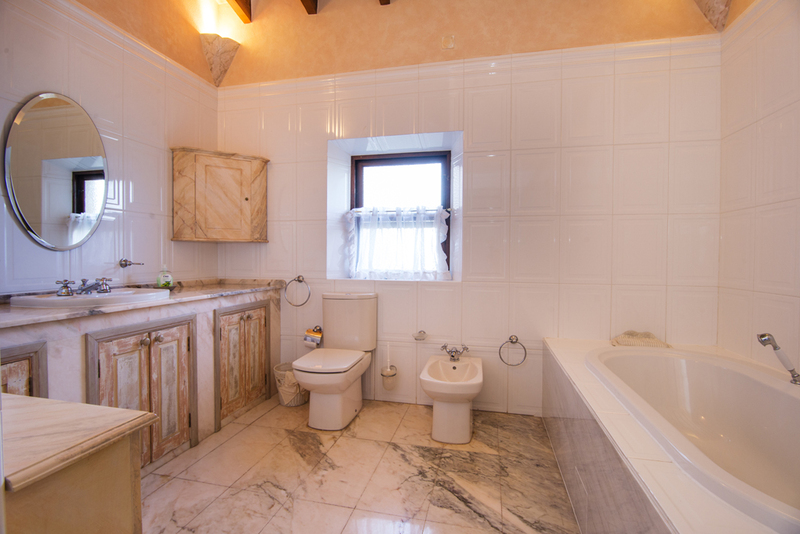 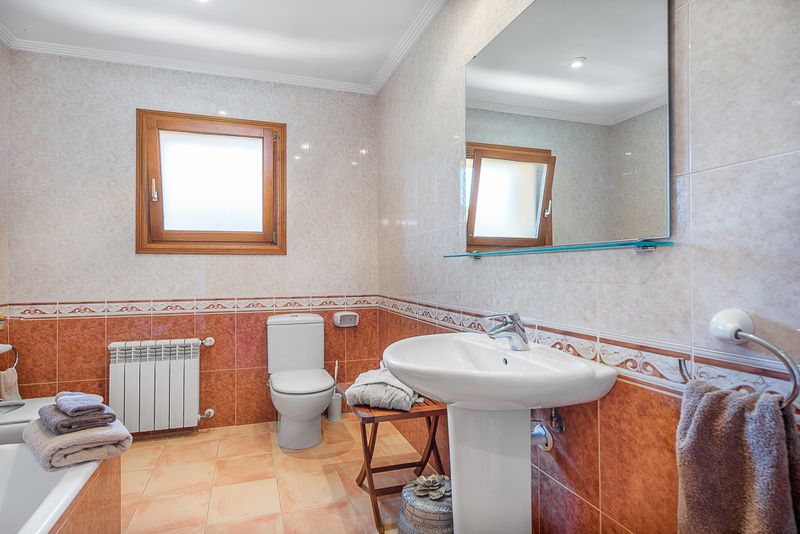 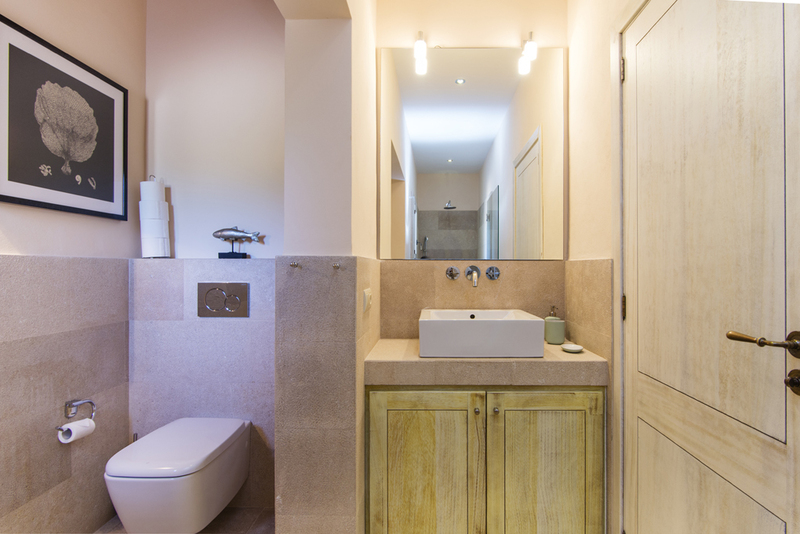 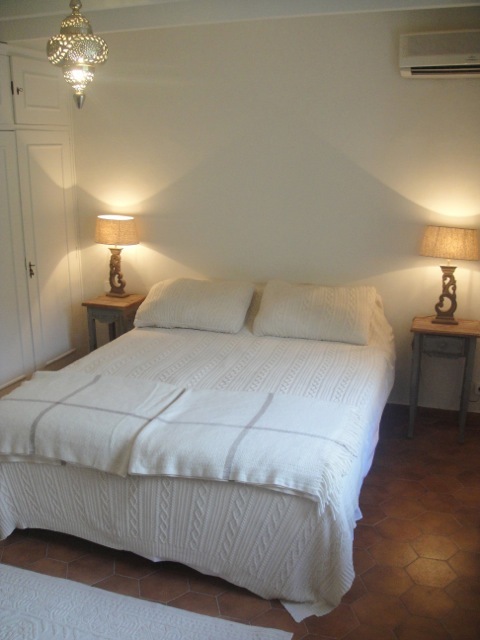 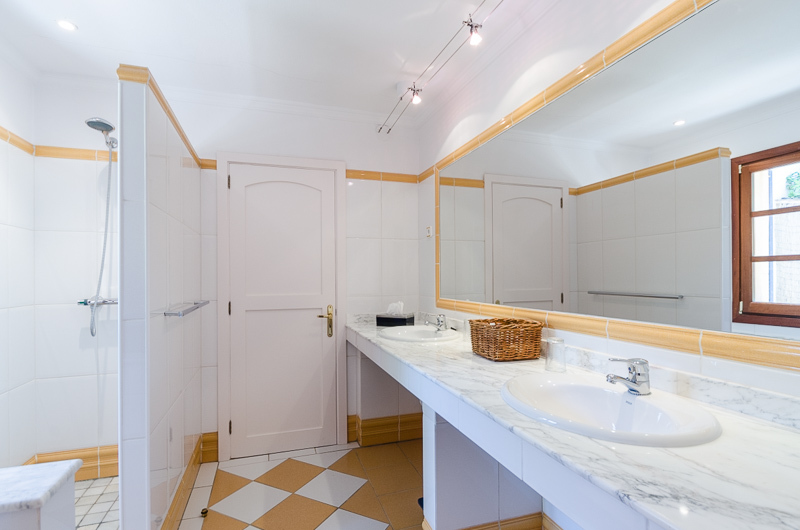 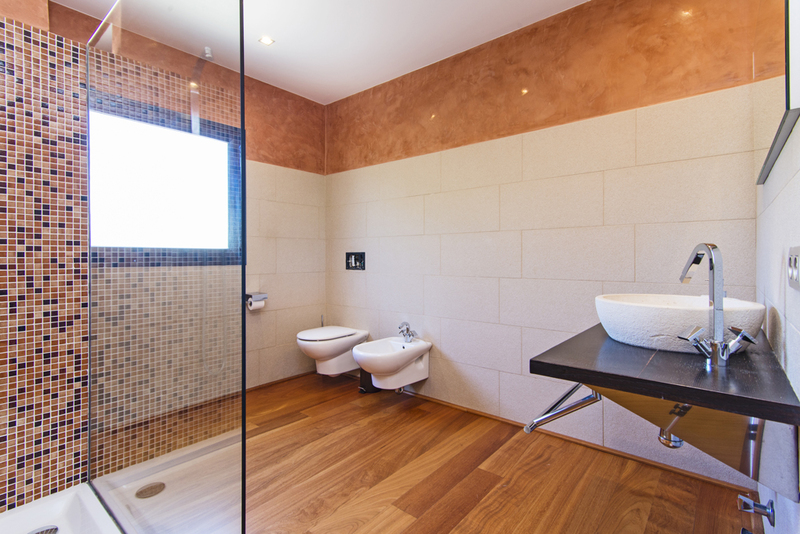 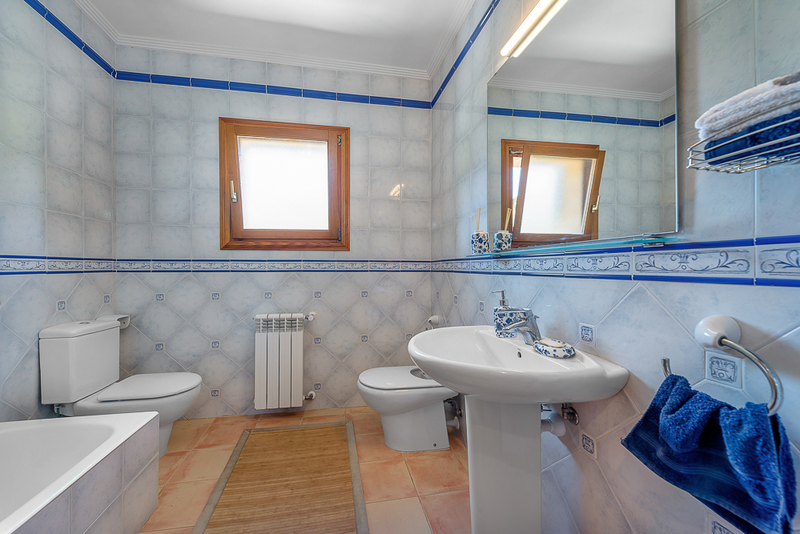 Two en suite bedrooms and a separate guest toilet are also located on the ground floor. 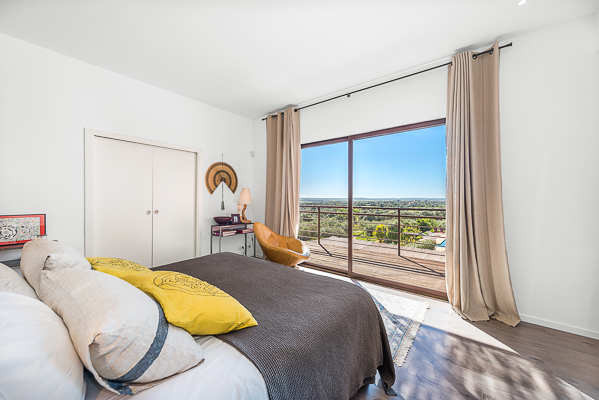 The master bedroom with en suite bathroom and a private terrace with fantastic views plus a fitness area is located in the tower. 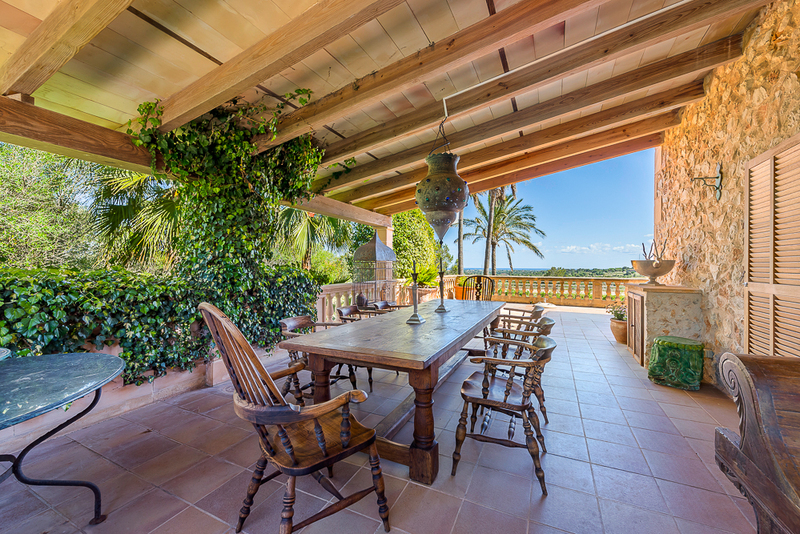 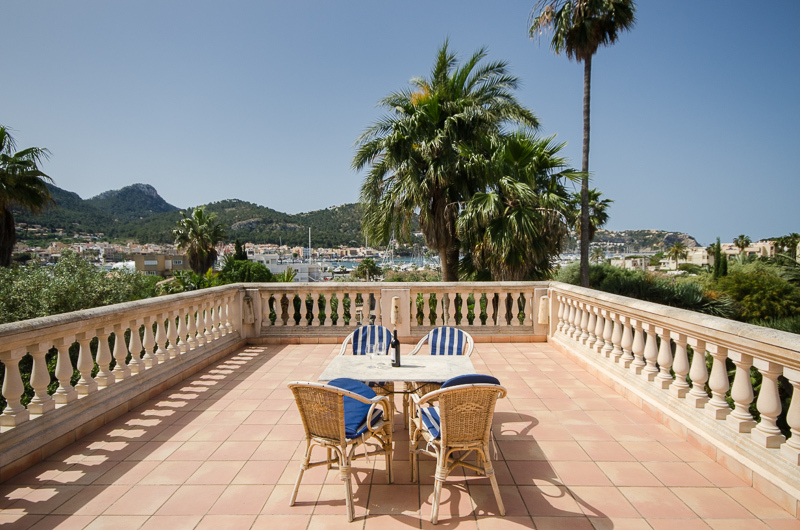 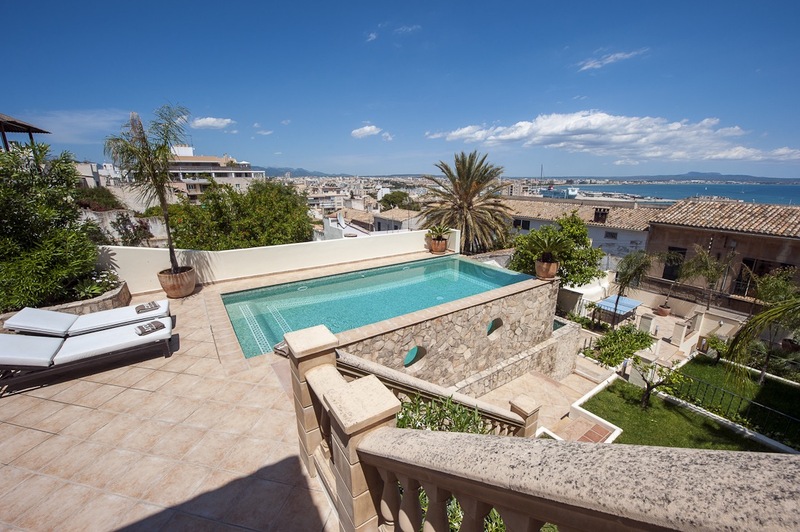 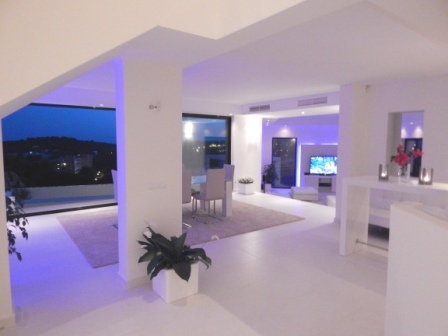 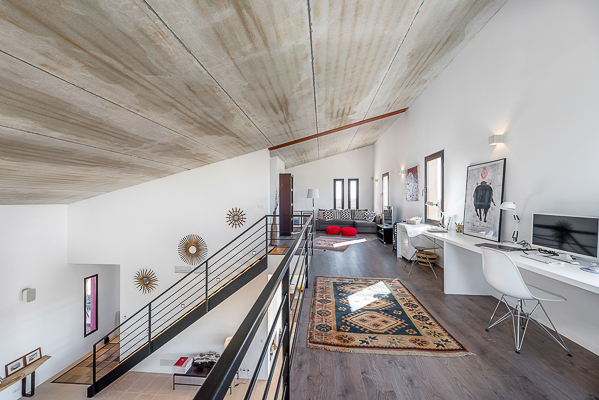 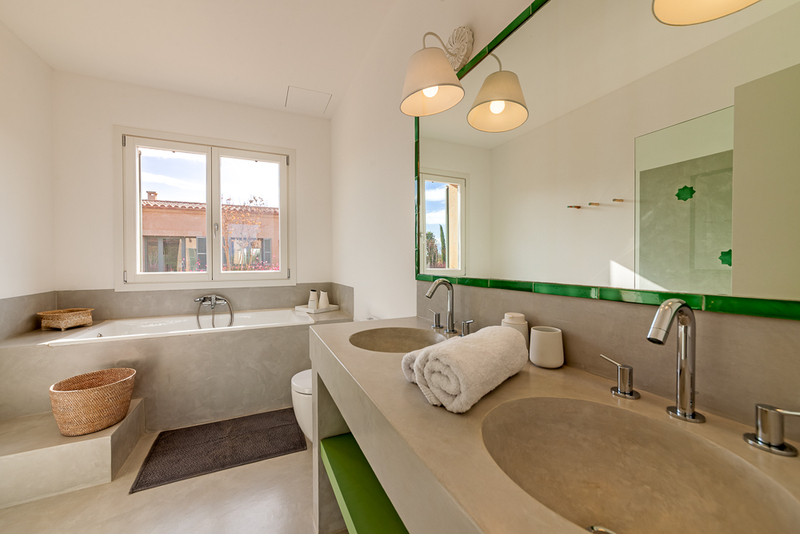 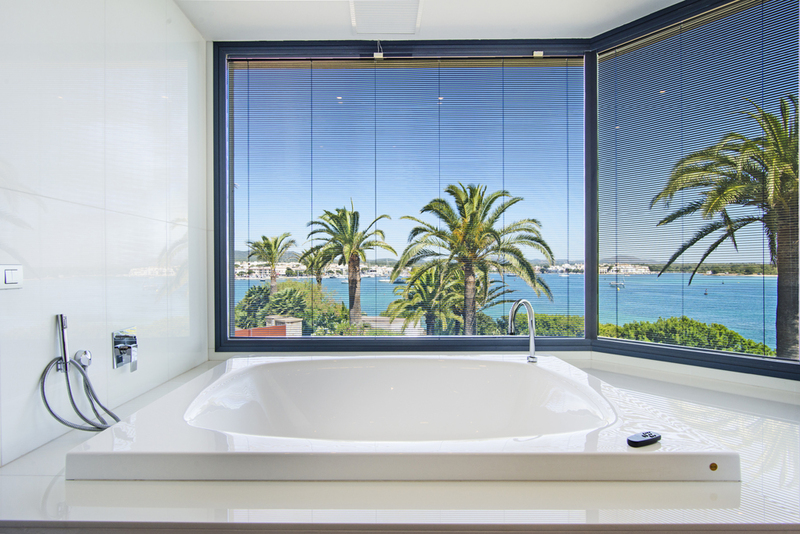 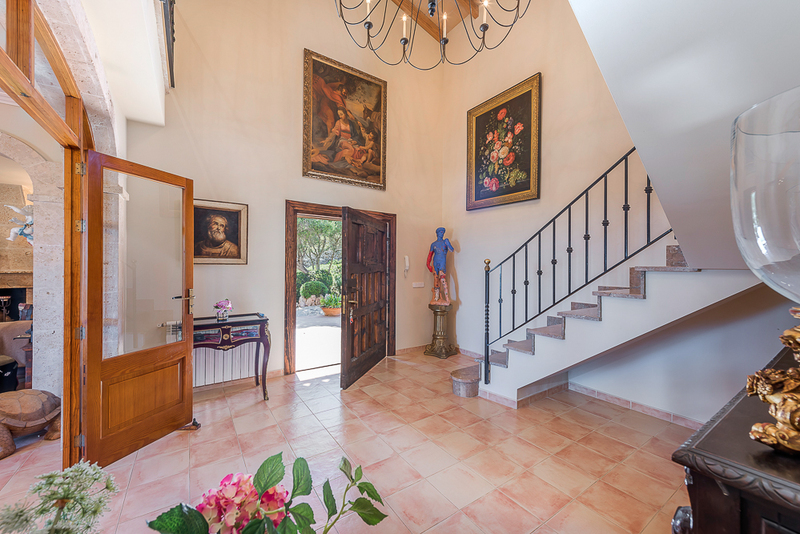 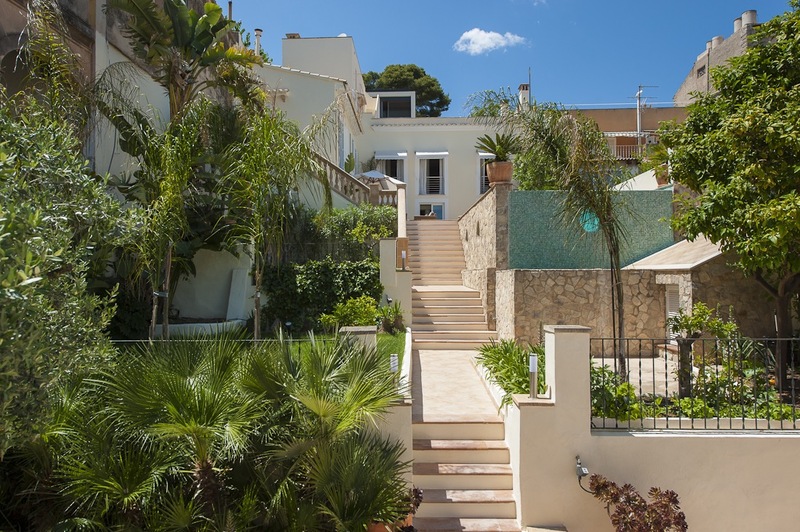 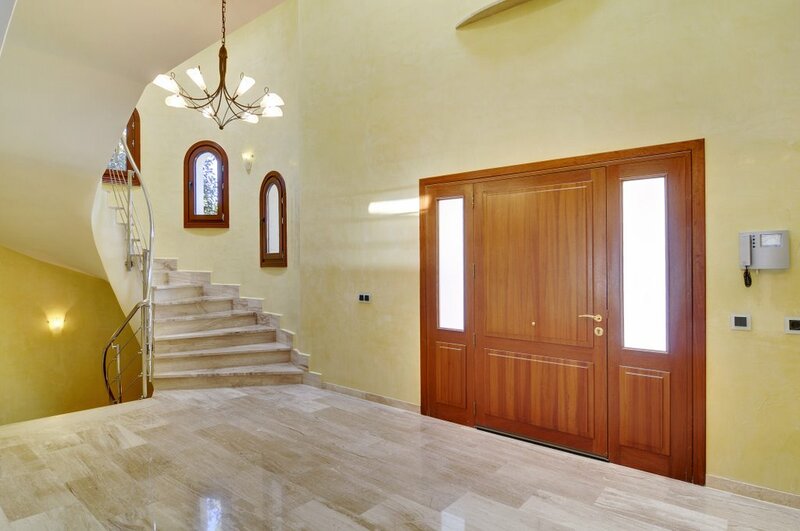 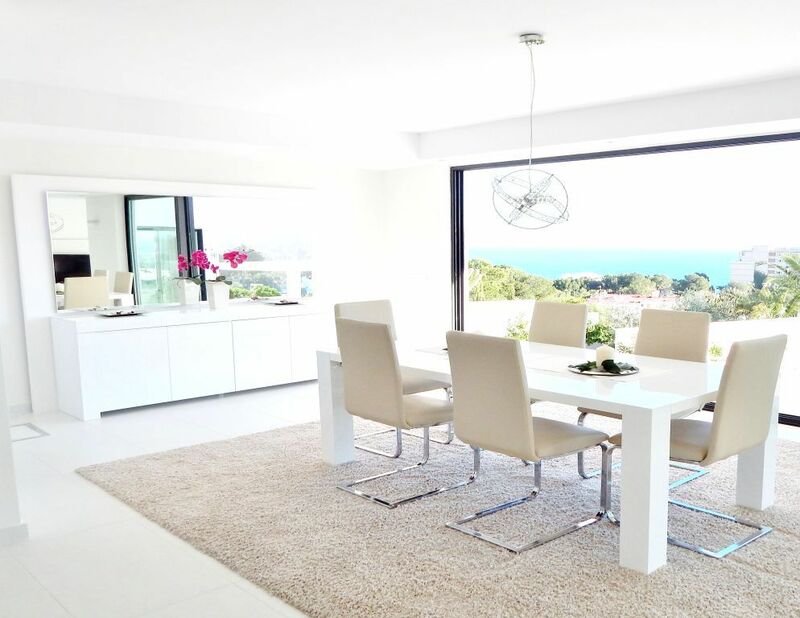 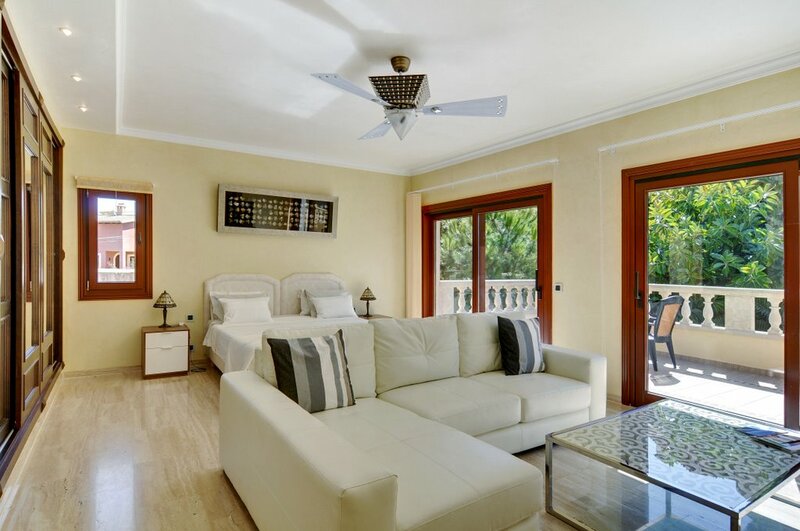 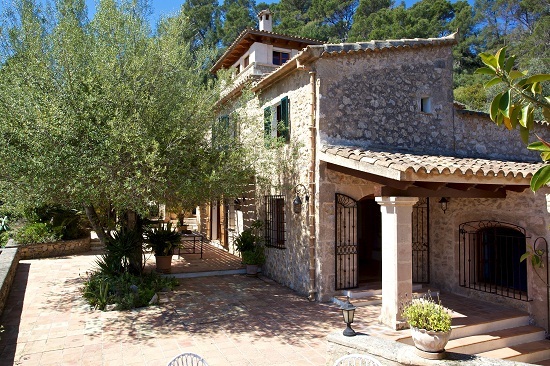 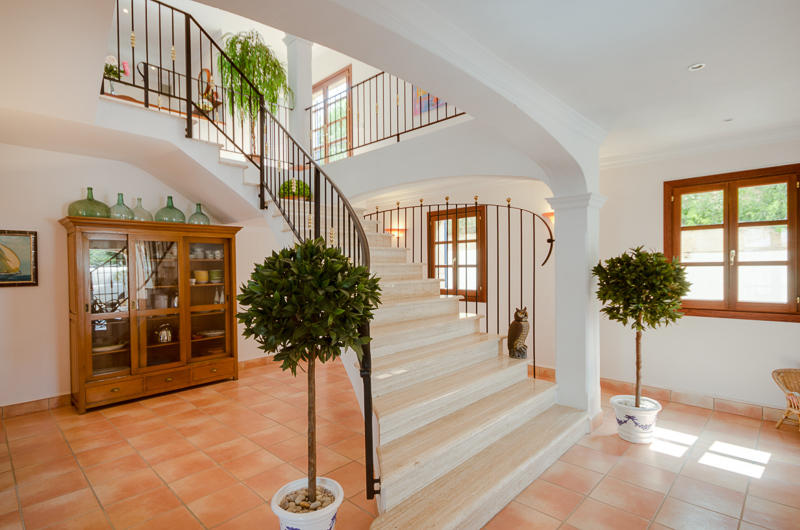 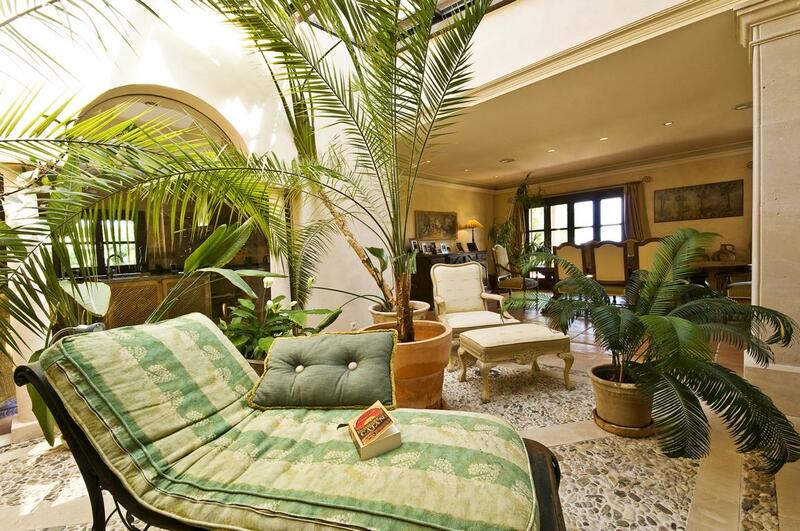 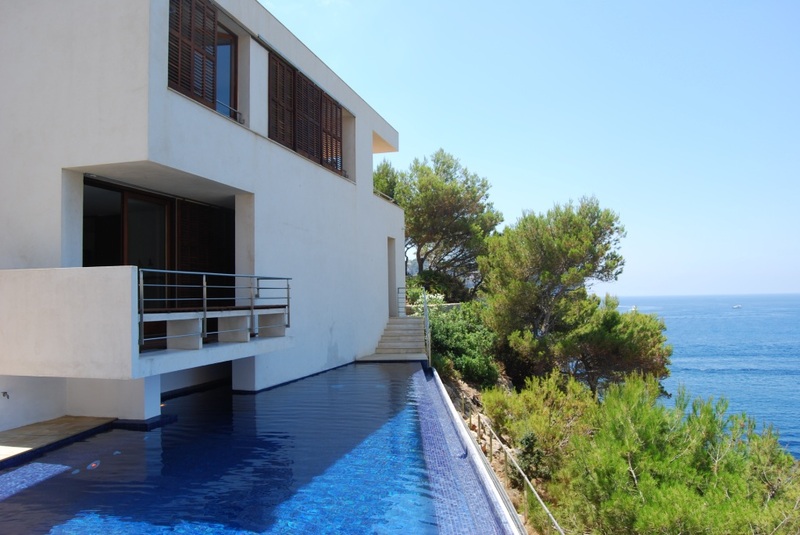 This beautiful villa, located on a hill in a peaceful residential district, offers luxurious lifestyle and ambience, as well as stunning views across the roofs of Palma, the scenic bay and the famous cathedral. 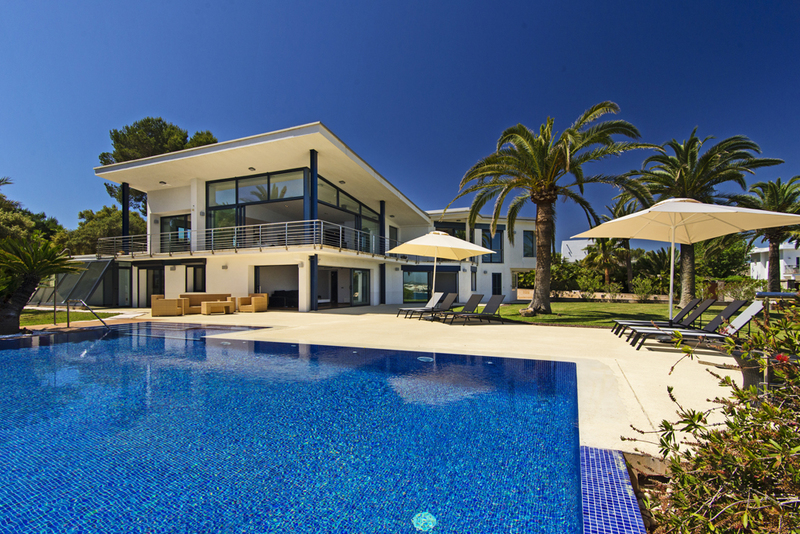 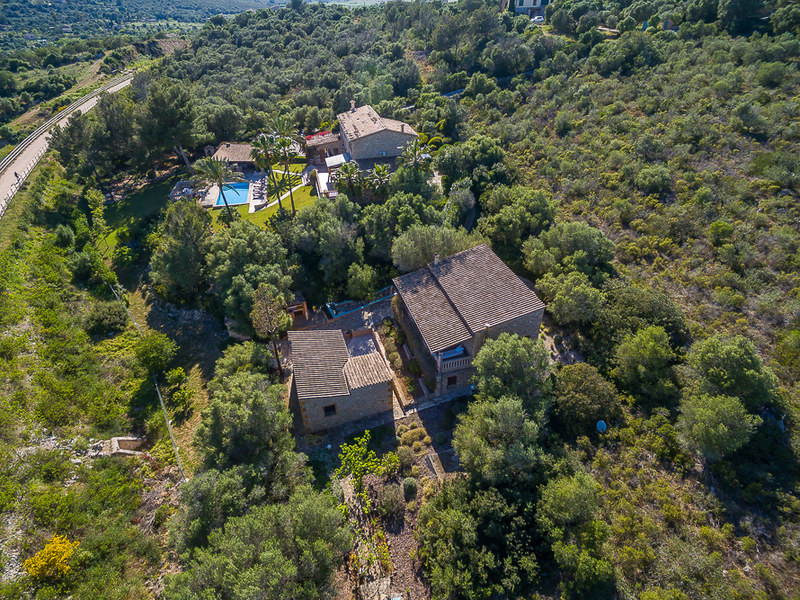 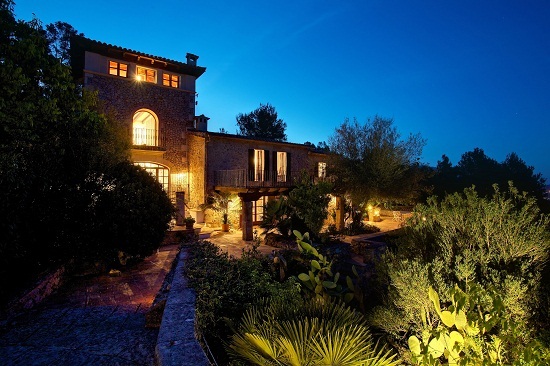 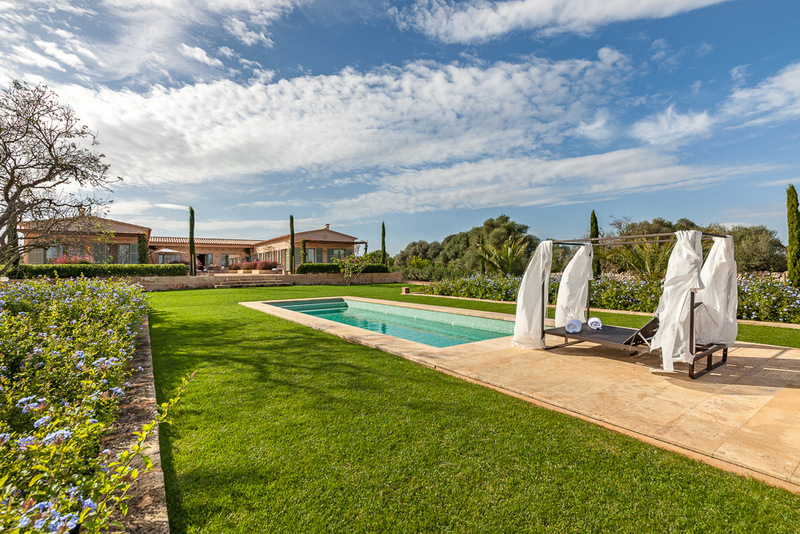 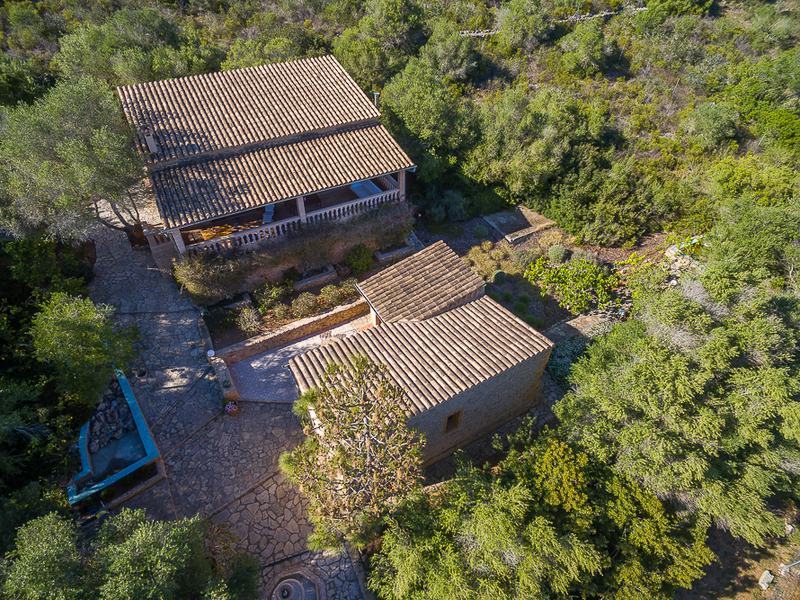 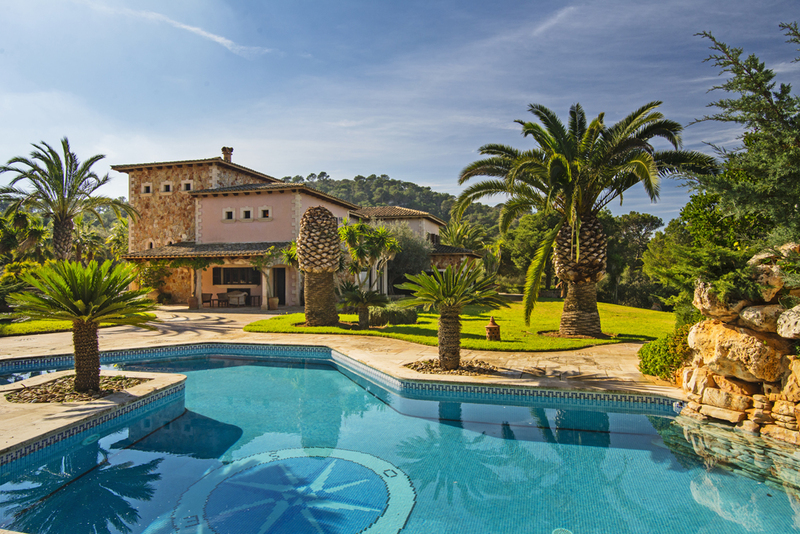 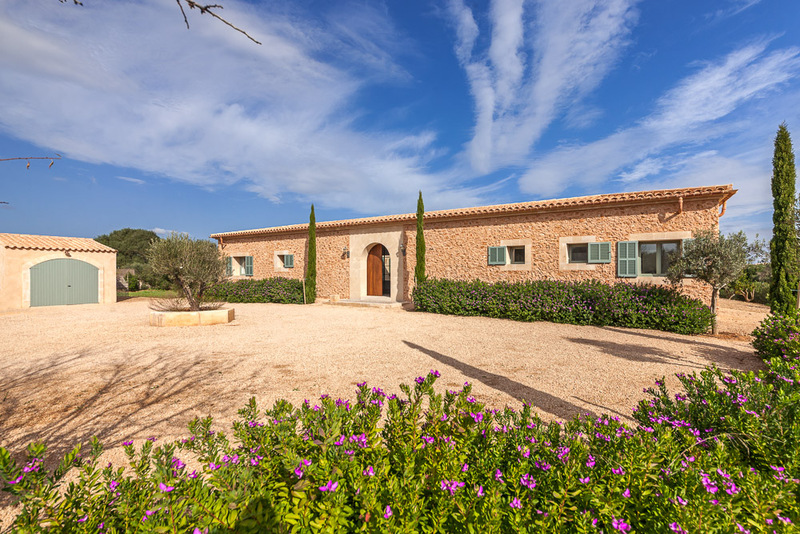 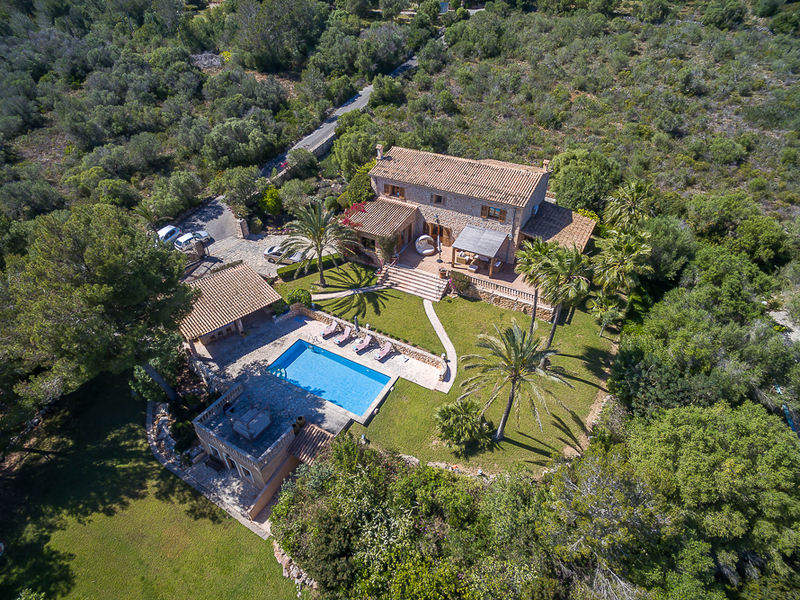 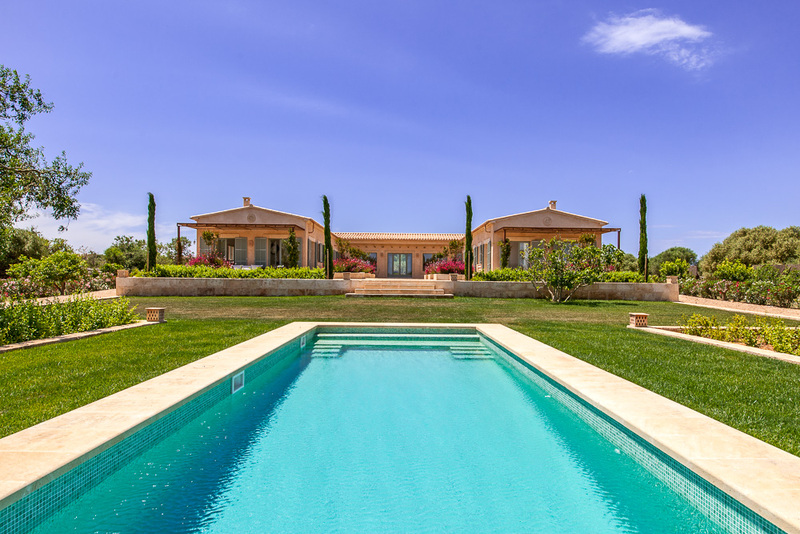 This tranquil Majorcan country estate, which was refurbished in 2014 to receive all sophisticated luxuries of the 21st century, is perched on a 21.000 m² plot with mature trees. 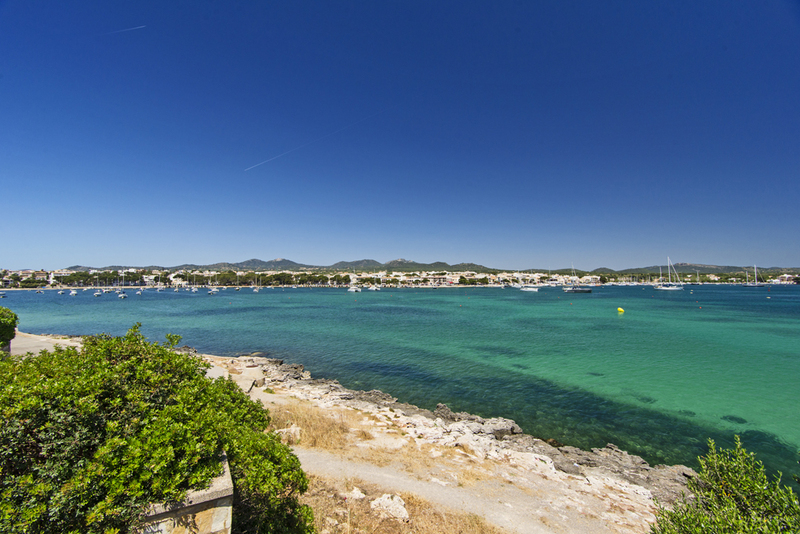 Porto Petro, the small fishing port nearby and the nearest sandy beaches (e.g. 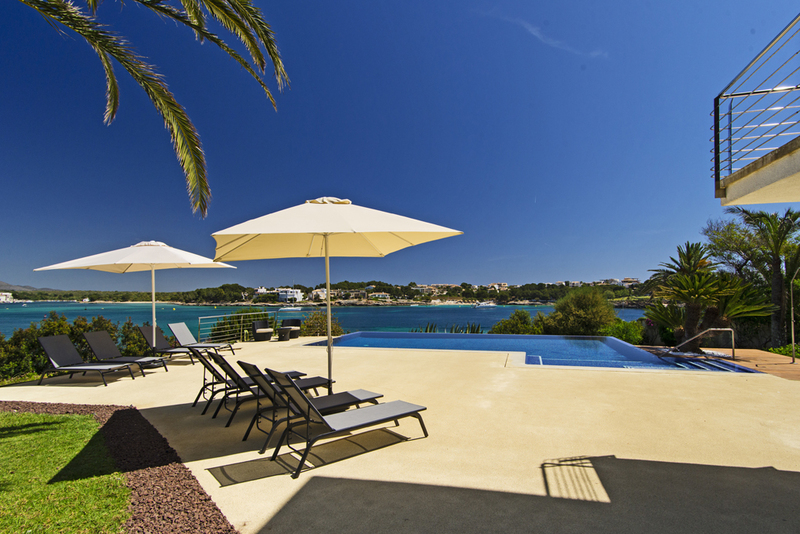 Cala Mondrago) are only 3 km away, the fantastic Golf Club Vall d' Or is about 10 casr minutes away. 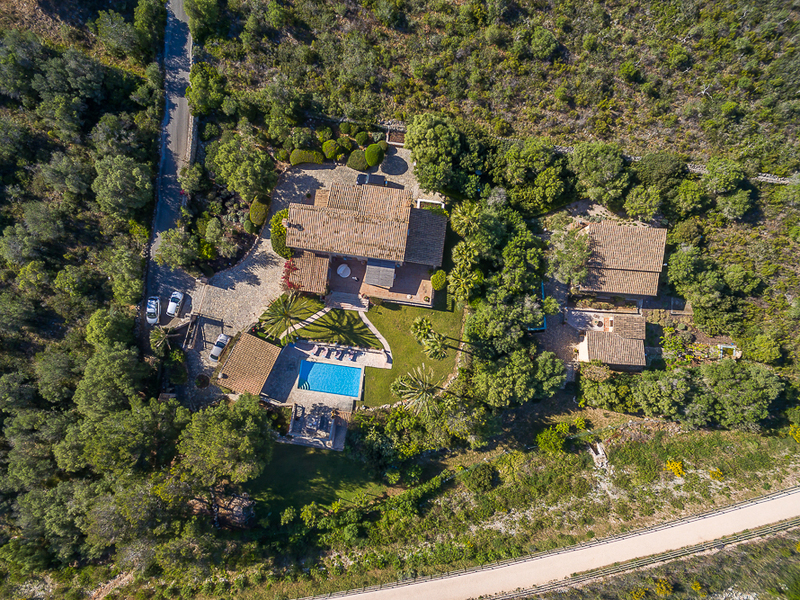 A private driveway lined by mature trees winds up to the representative property surrounded by park-like gardens with extensive lawns and lush vegetation. 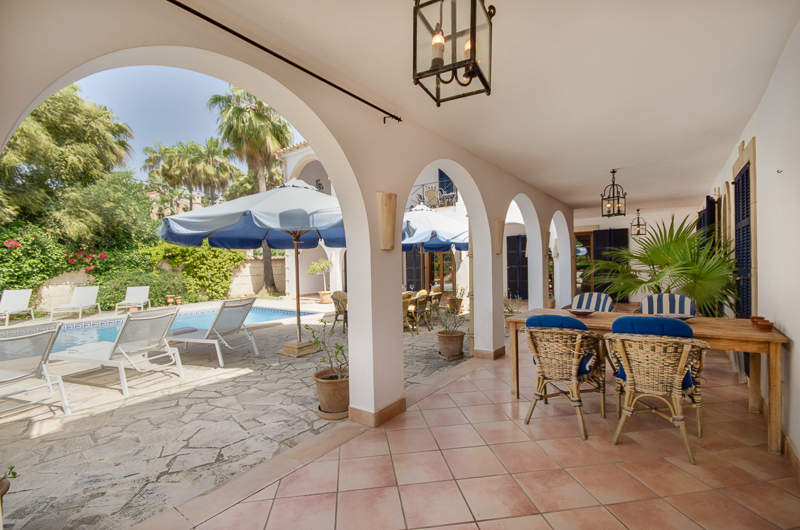 The focal point of the outside entertainment area is the very large sun terrace with pool, shower and small water feature. 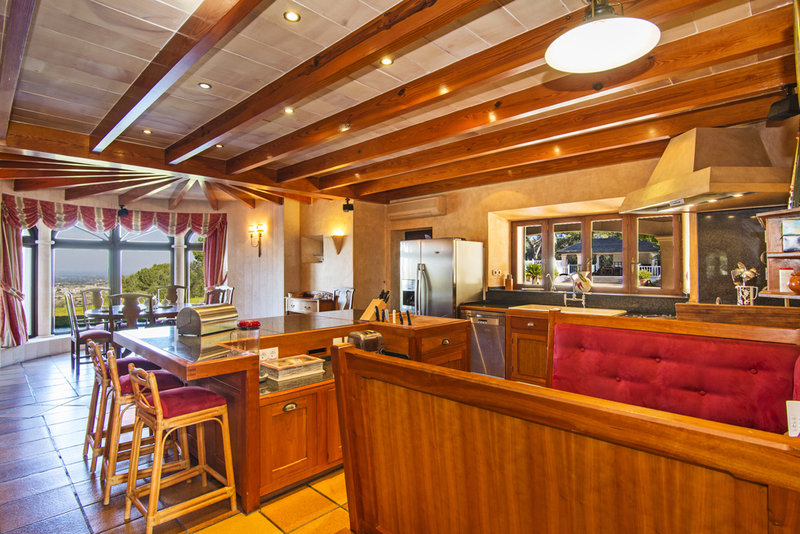 The adjoining pool house features a summer kitchen, a bar, a barbecue and a Jacuzzi. 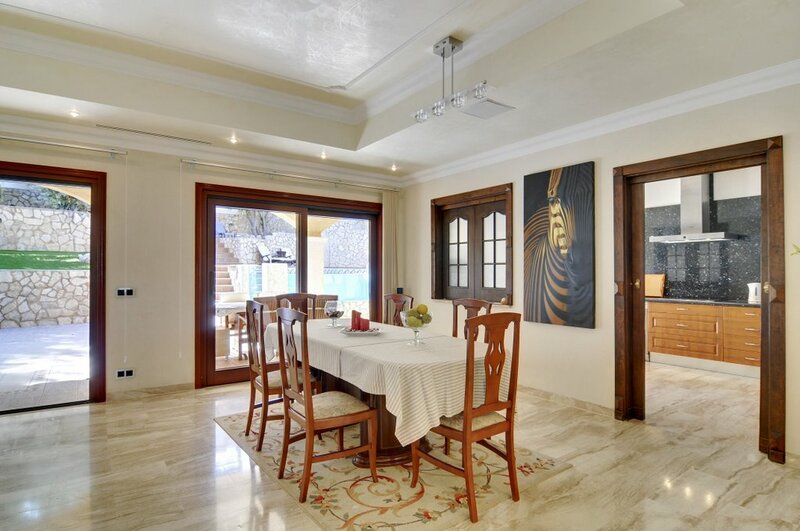 With its impressive architecture, its uncompromising, prevailing white interior furnishing and spacious room and pool terrace design, this property exudes cool elegance and true Meditereanean lifestyle. 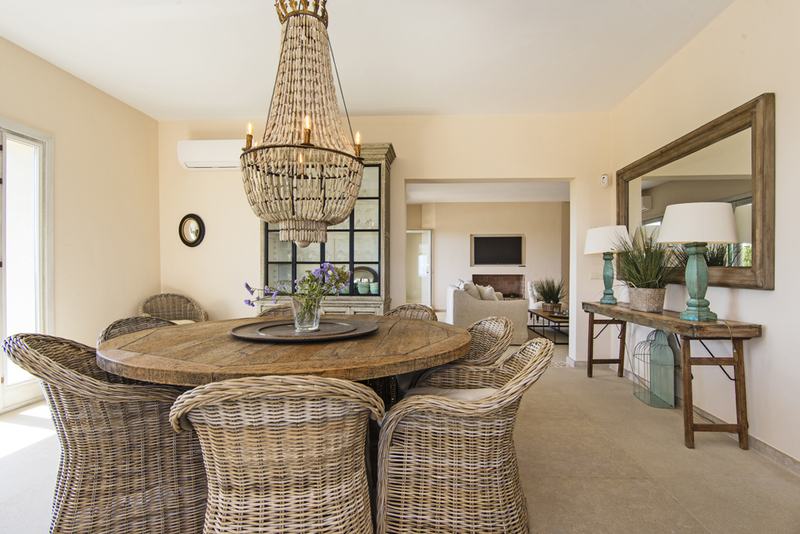 High-quality furniture and amenities add to the allure. 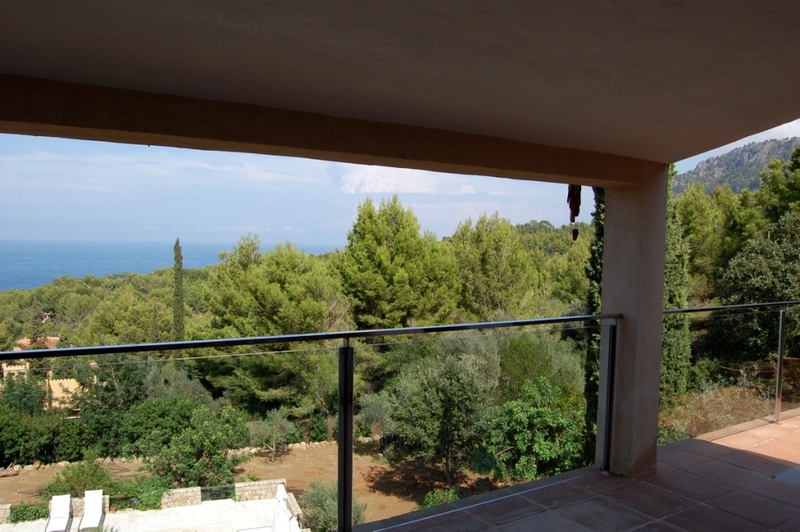 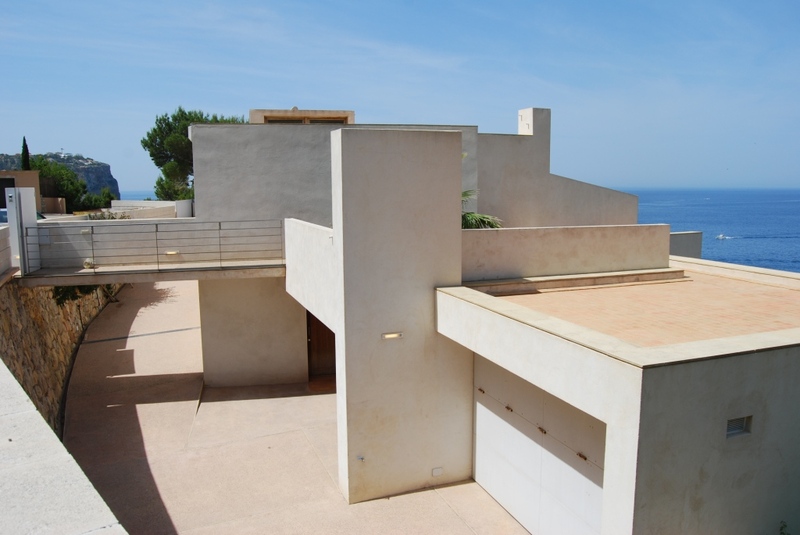 All 4 bedrooms with sea views and terrace access. 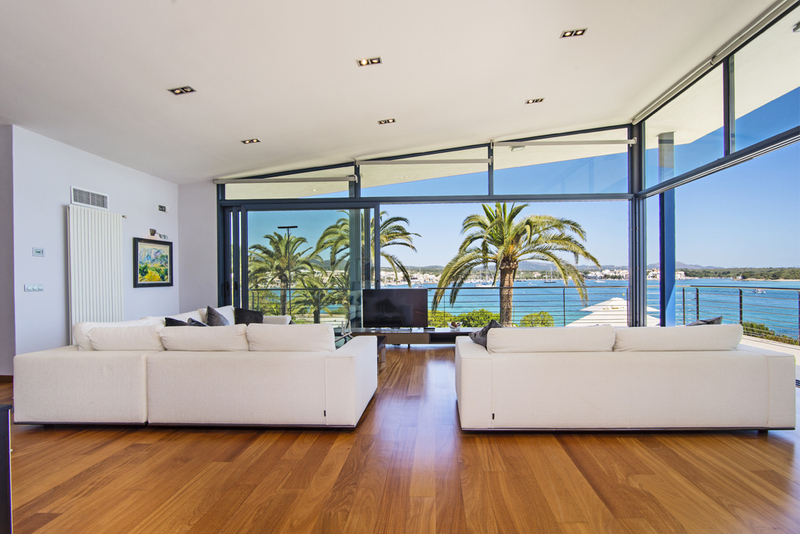 The large floor-to-ceiling windows of the livingroom flow onto the large, partly sun-shaded terrace with beautiful vistas of Cala Vinyas and the ocean. 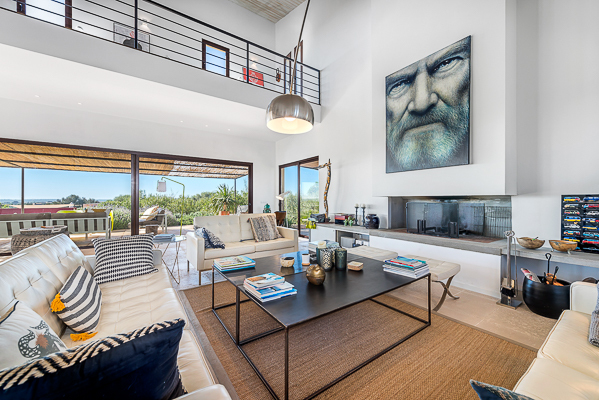 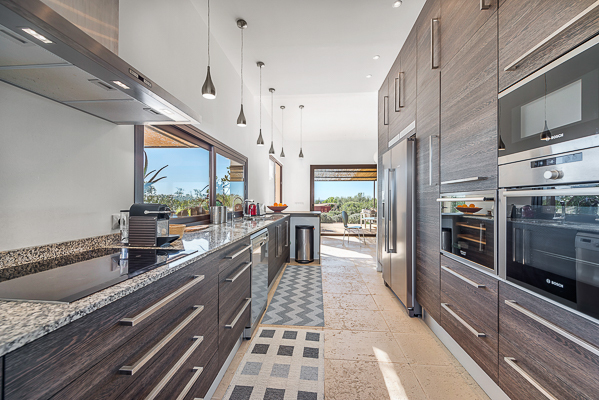 This exceptionally designed beach front villa and its appealing lifestyle concept has already been featured in various architectural magazines. 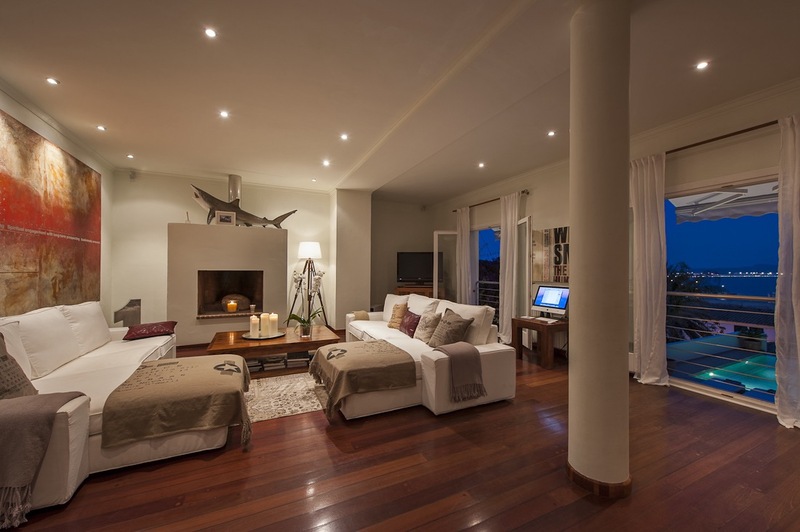 On different levels, the high class property offers a spacious and modern ambience combined with ultimate comfort and privacy. 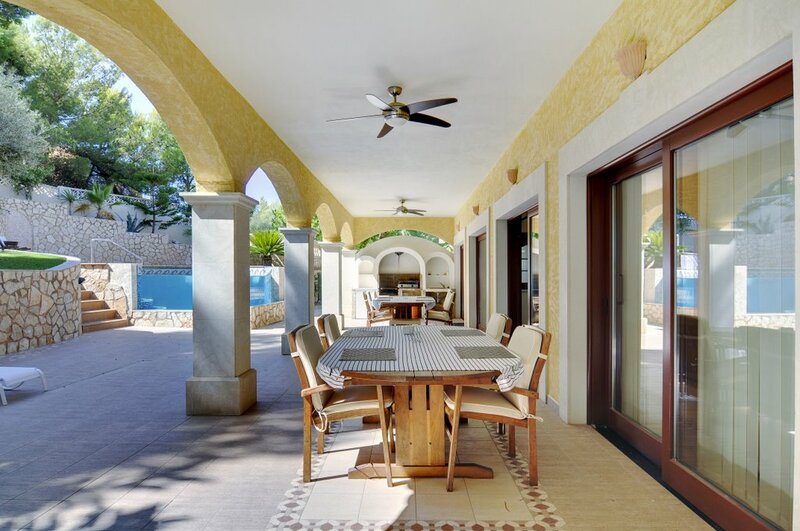 Numerous furnished terraces allow for finding the perfect place for relaxation or entertainment at any time of the day, especially because most of them boast spectacular views of the deep blue ocean. 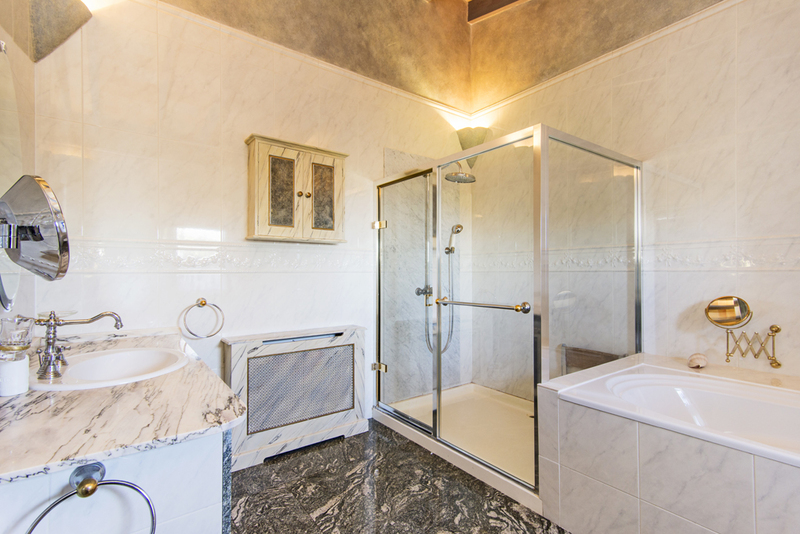 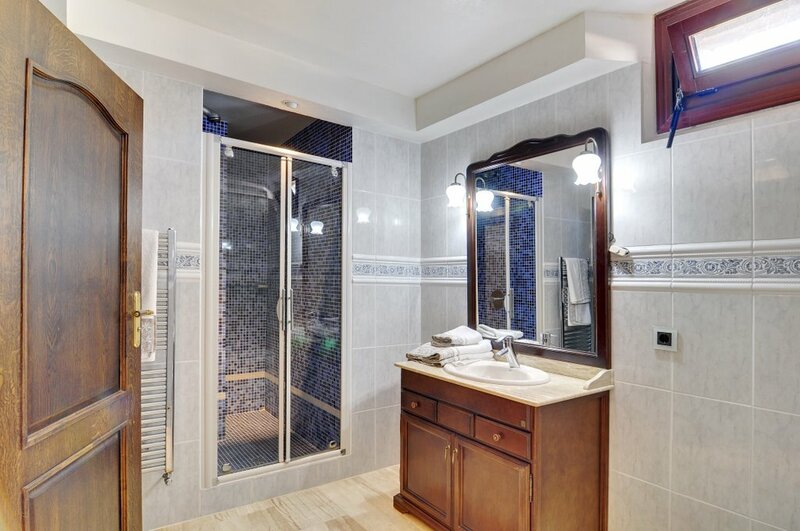 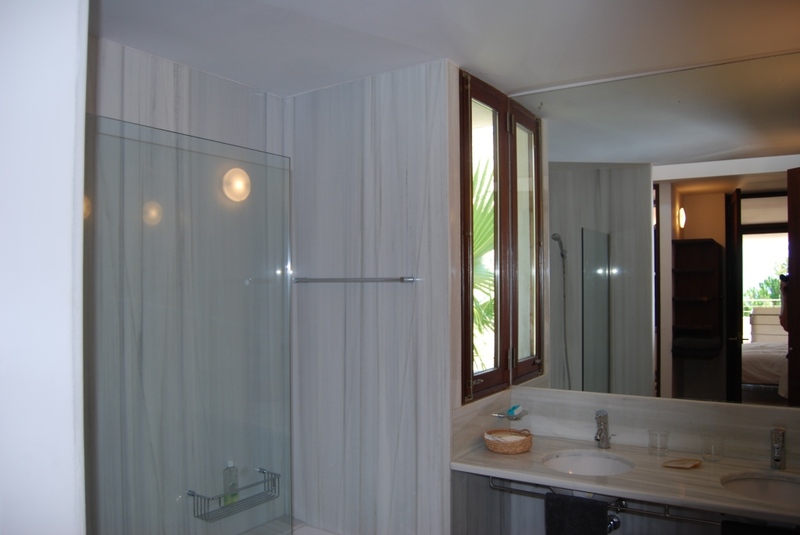 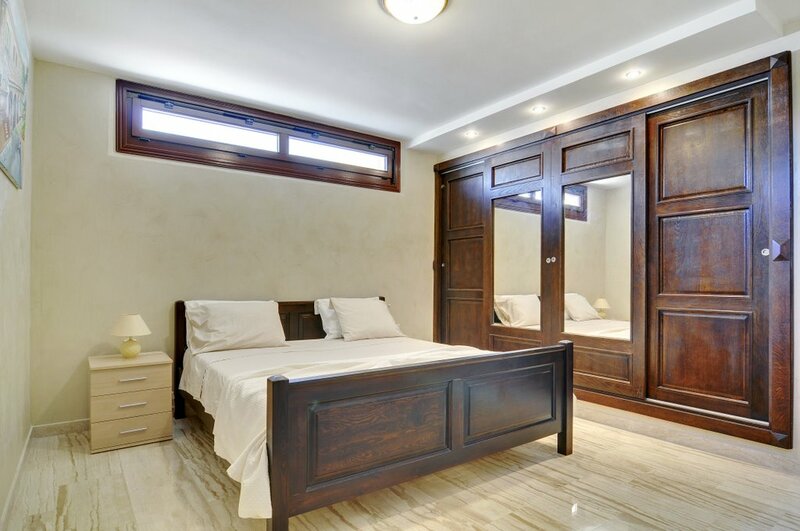 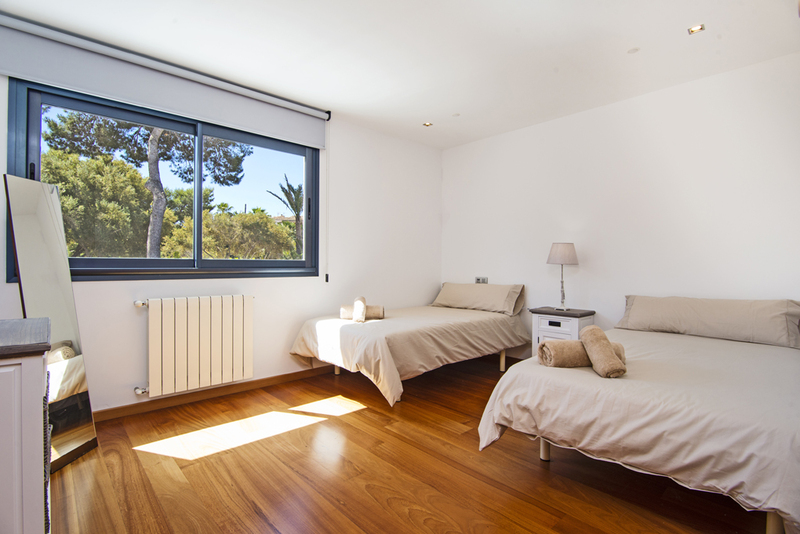 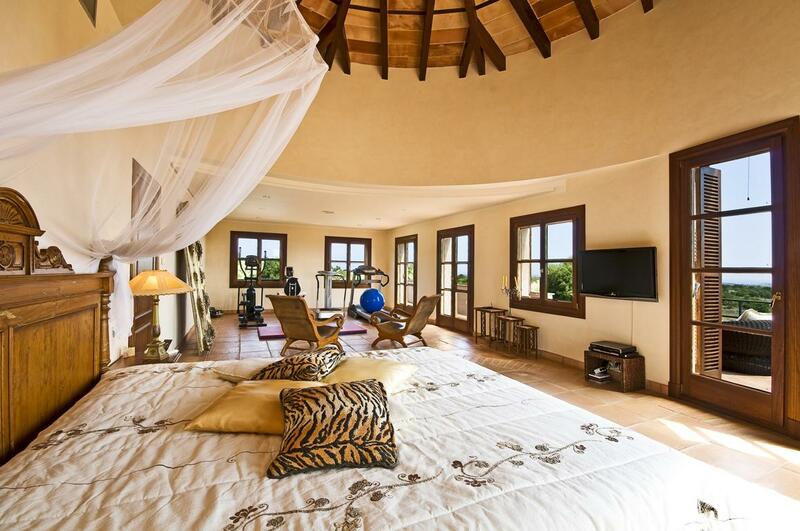 The master bedroom with en-suite bathroom and office is located on the highest floor. 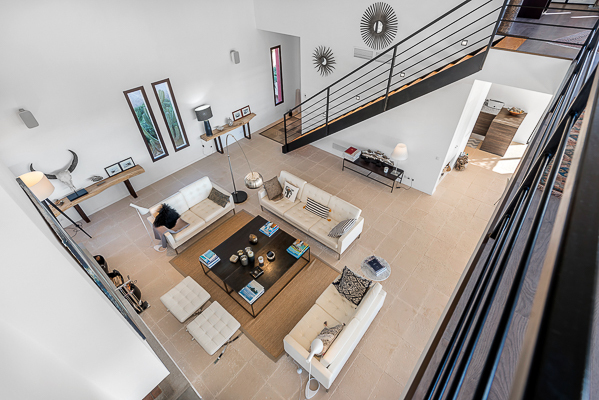 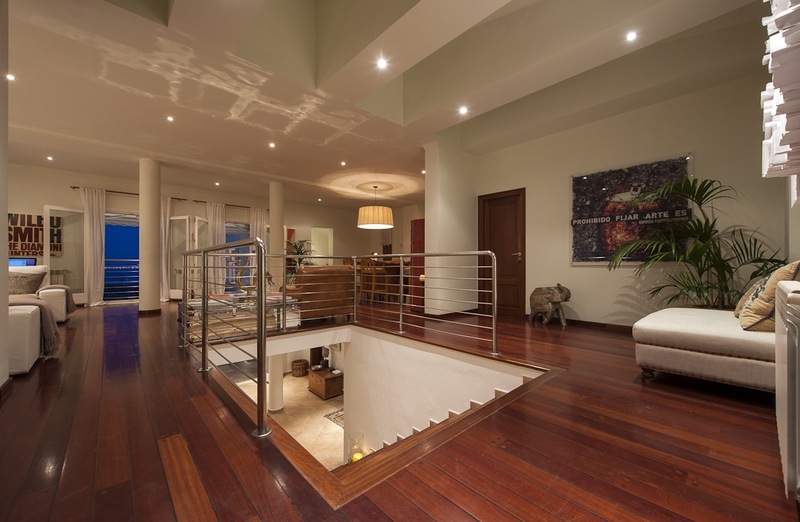 The entertainment area underneath with open-plan living room and kitchen represents the entrance level, while 3 more bedrooms and 2 bathrooms are located on the lowest level. 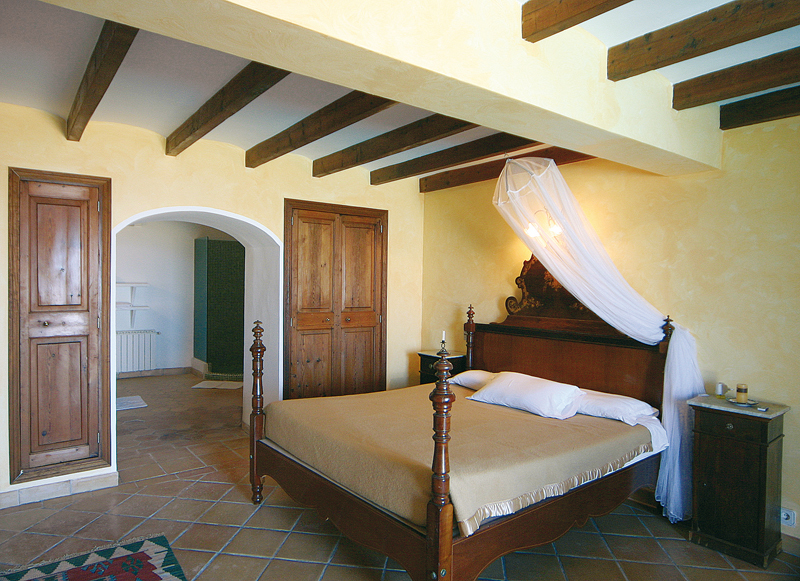 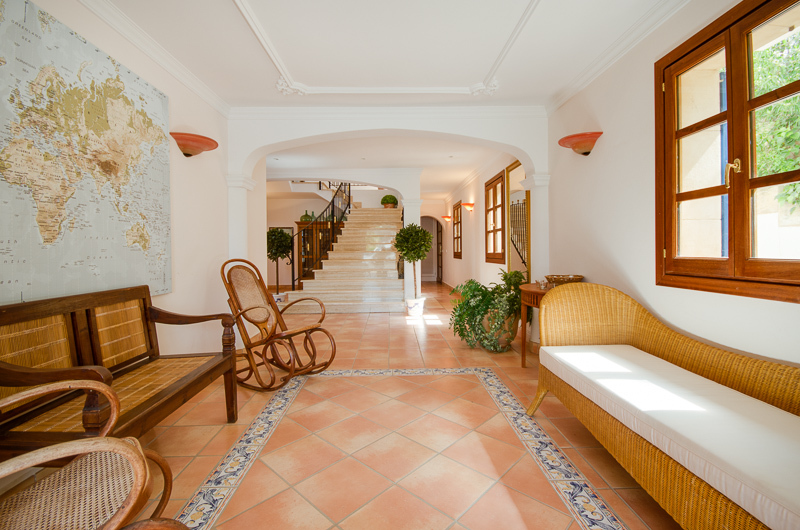 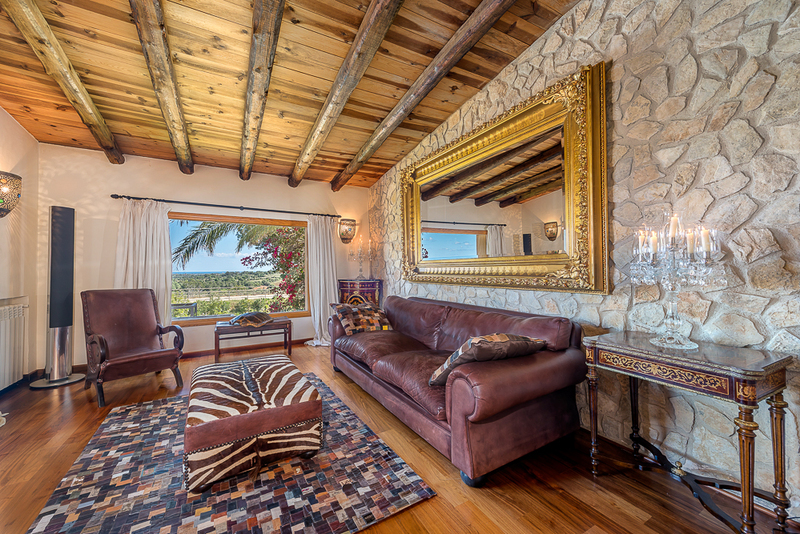 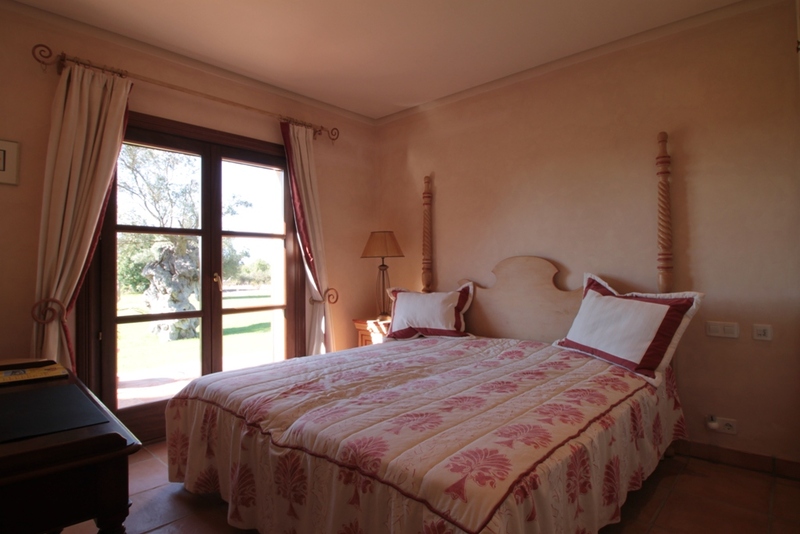 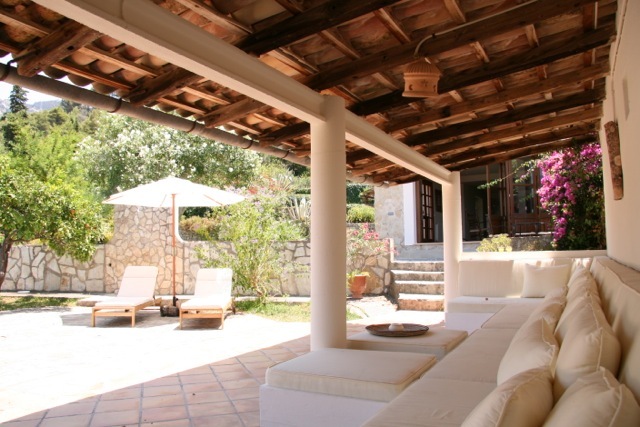 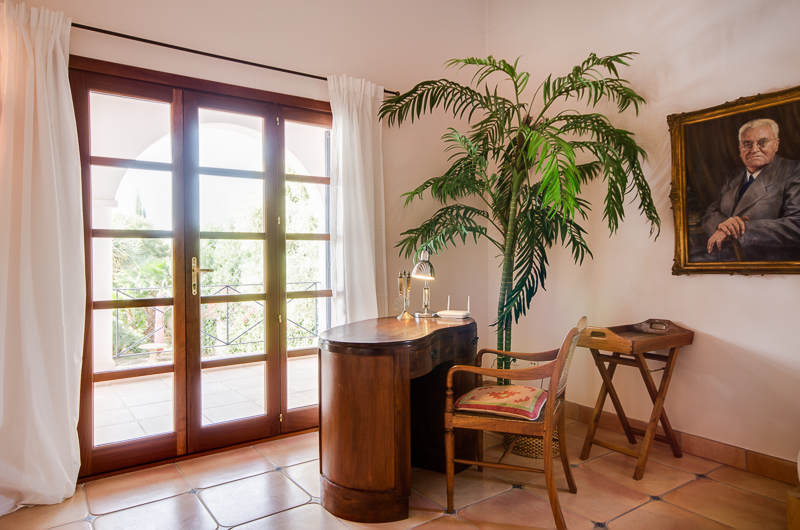 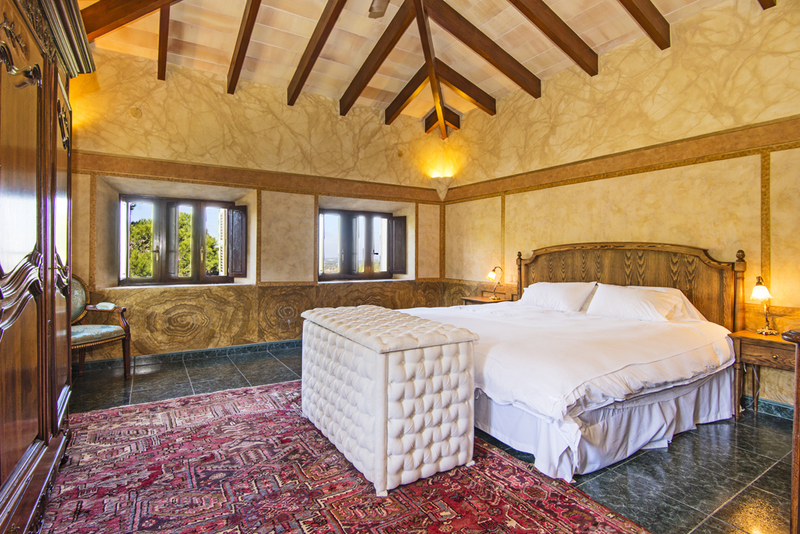 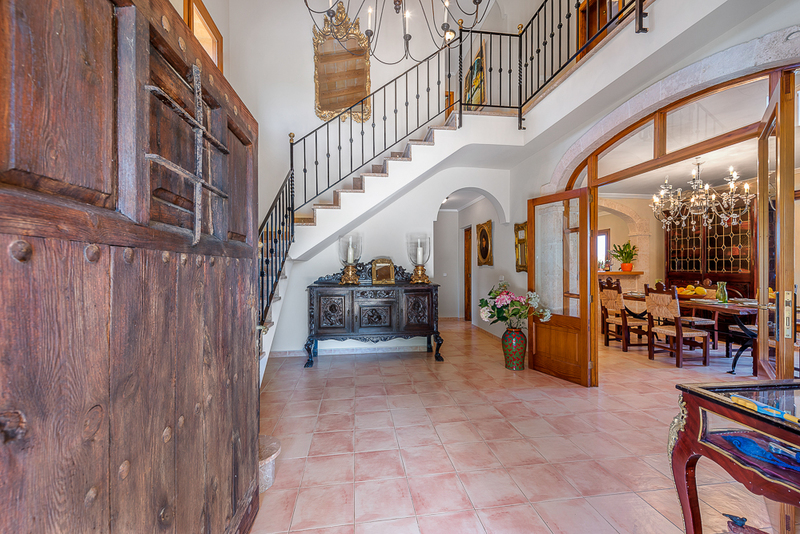 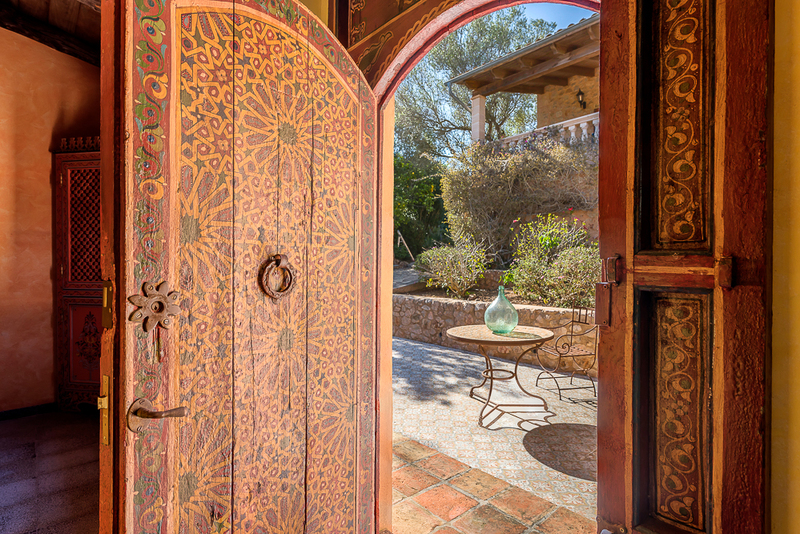 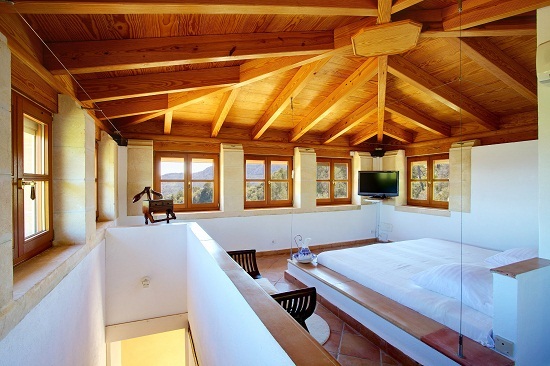 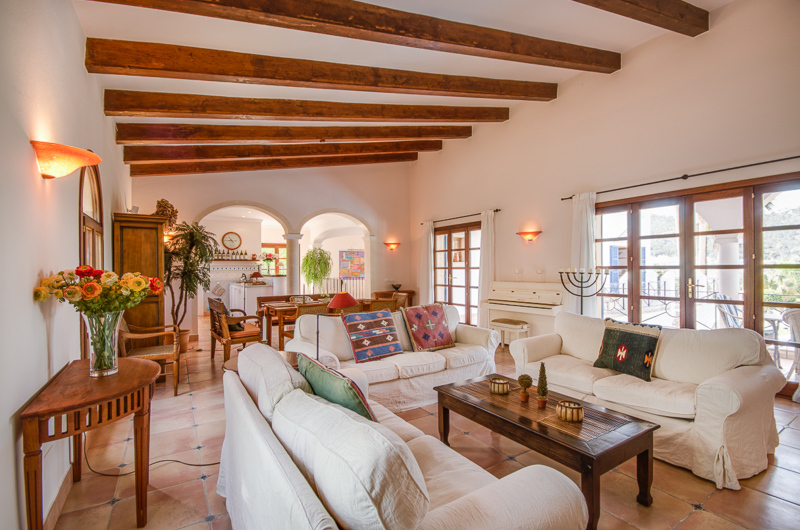 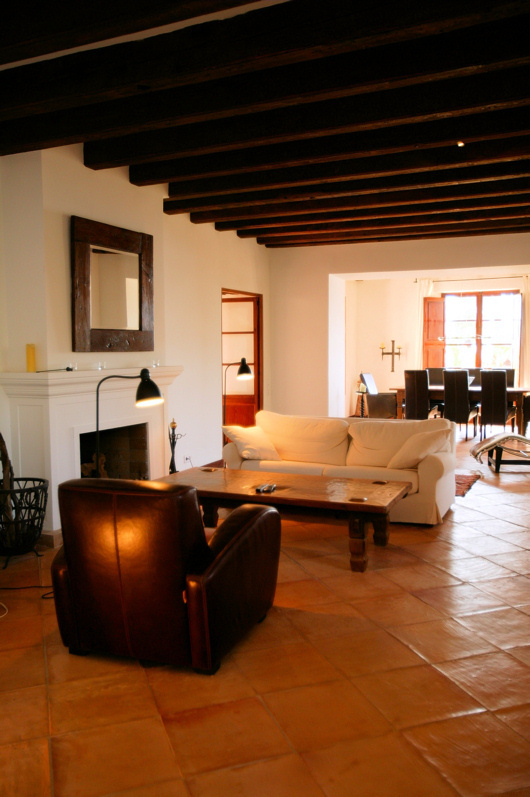 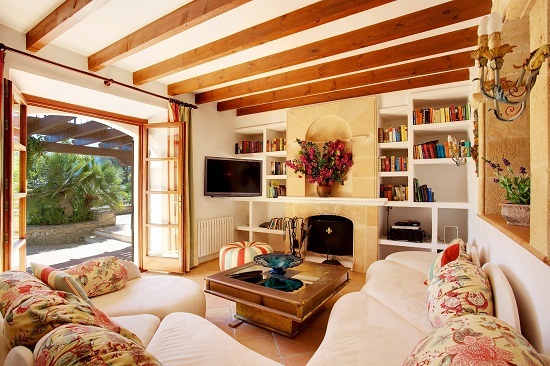 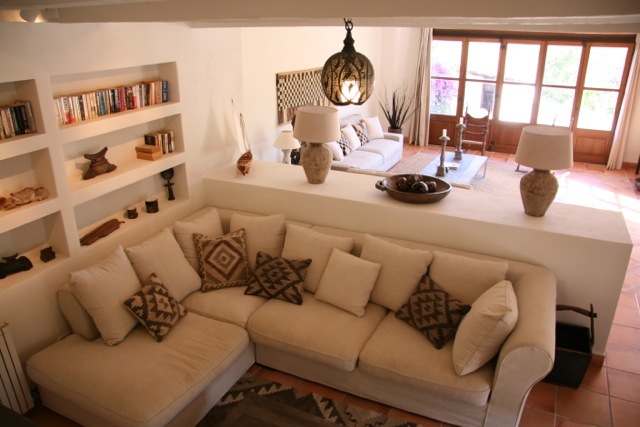 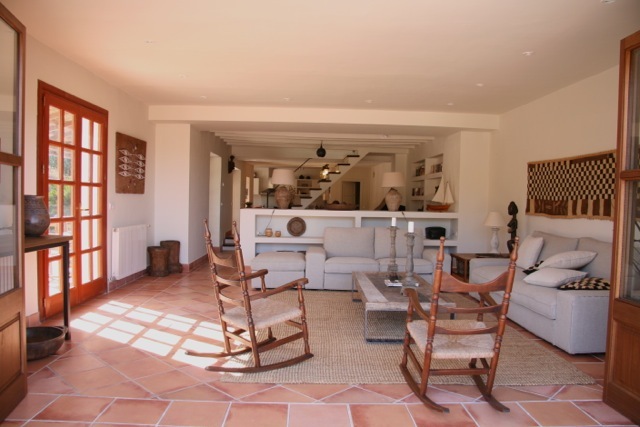 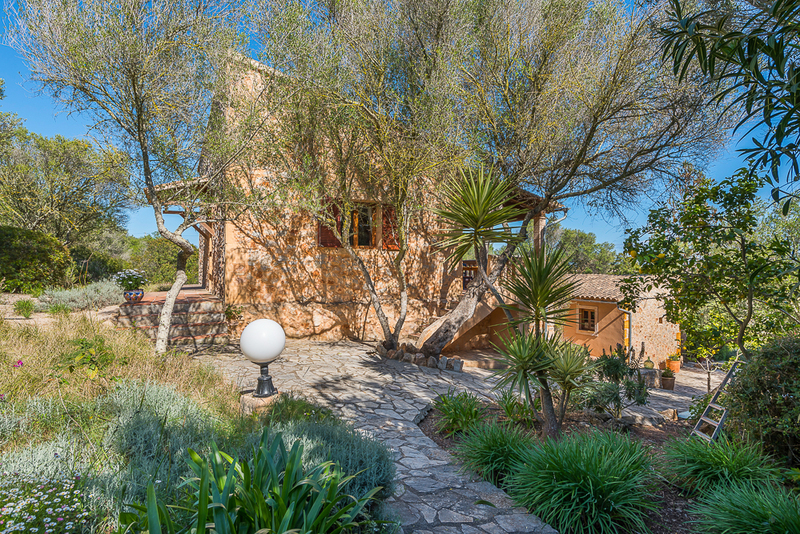 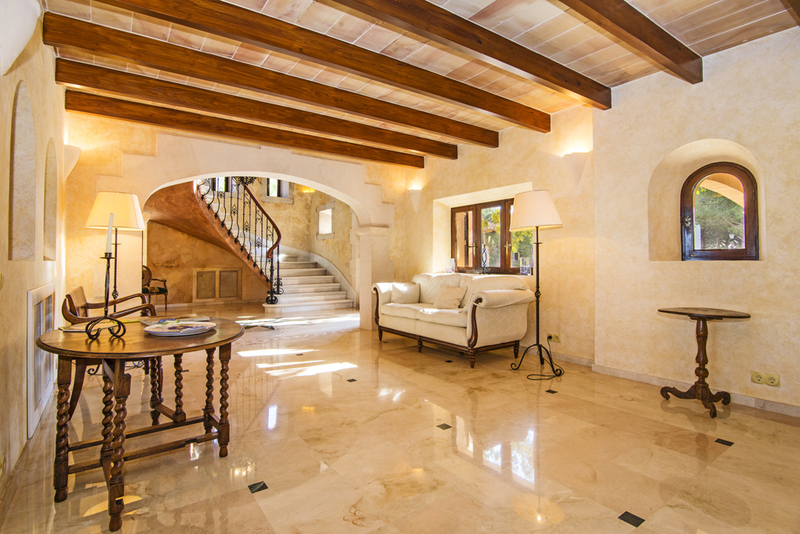 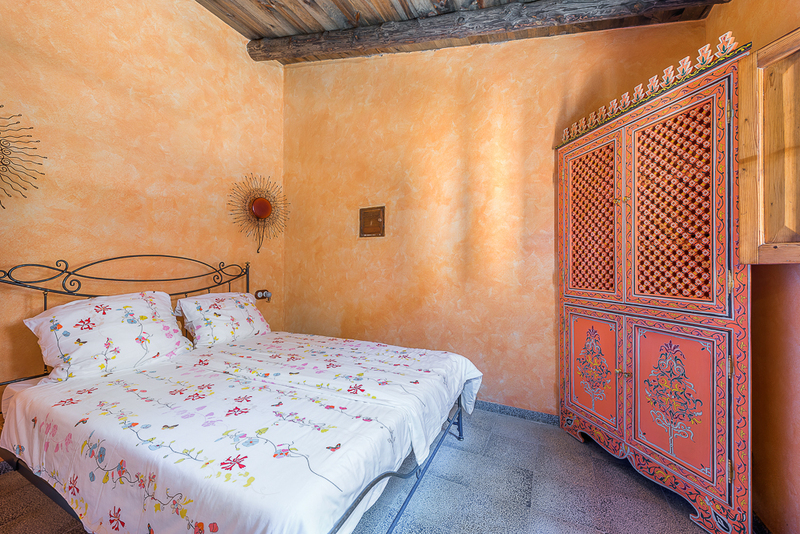 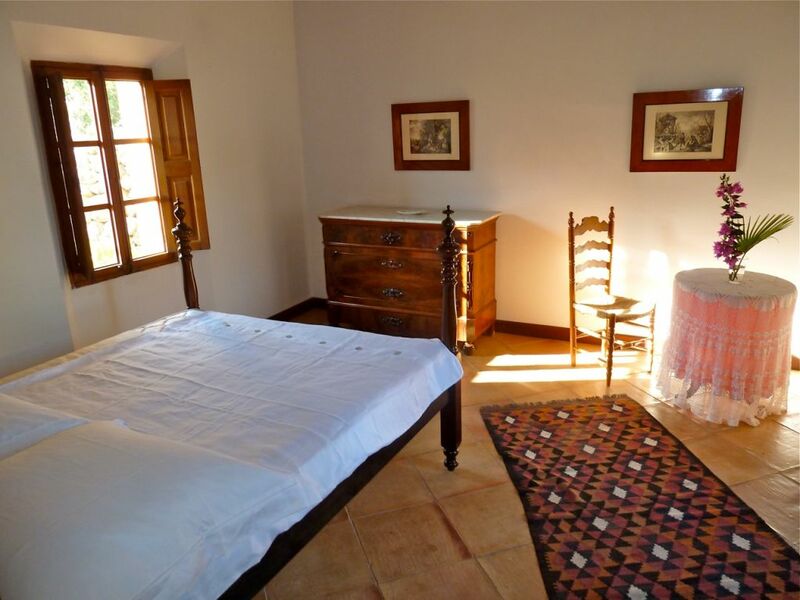 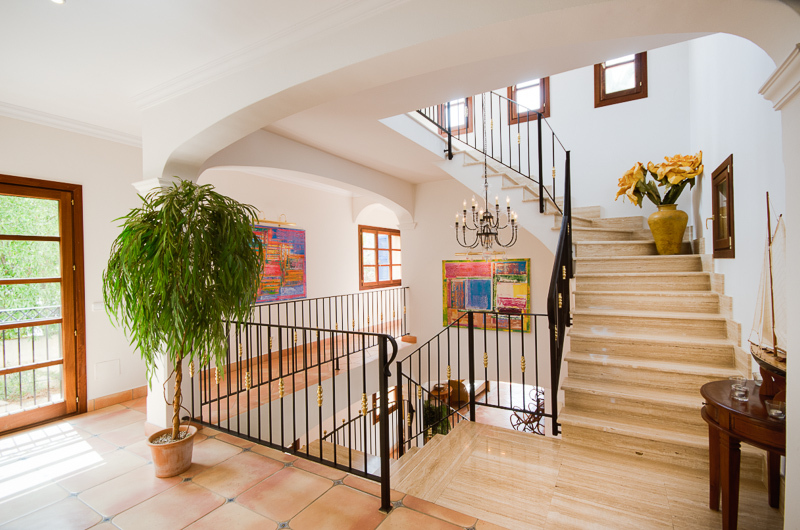 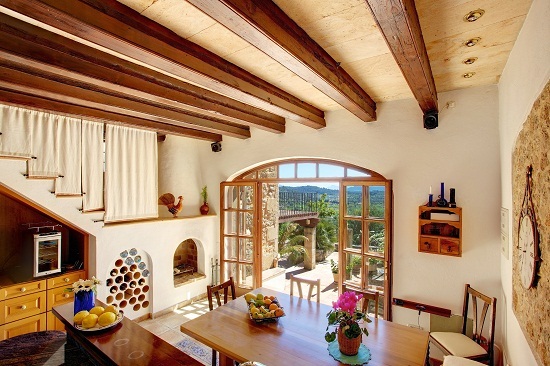 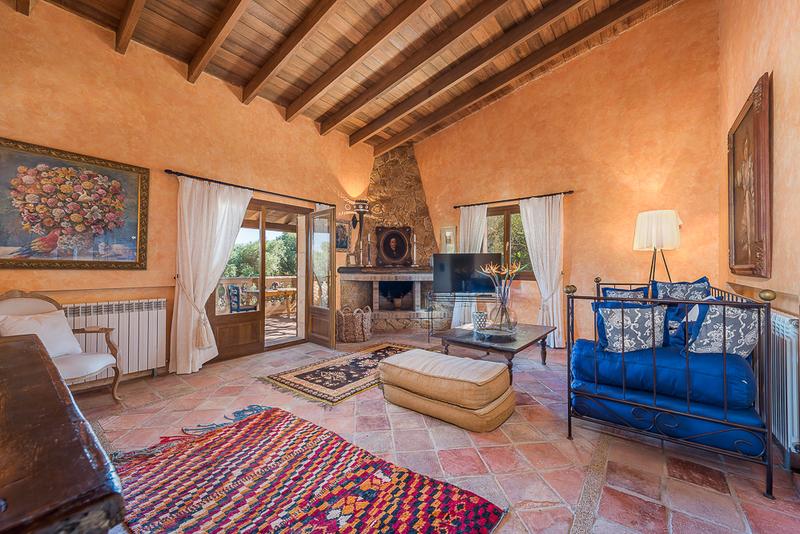 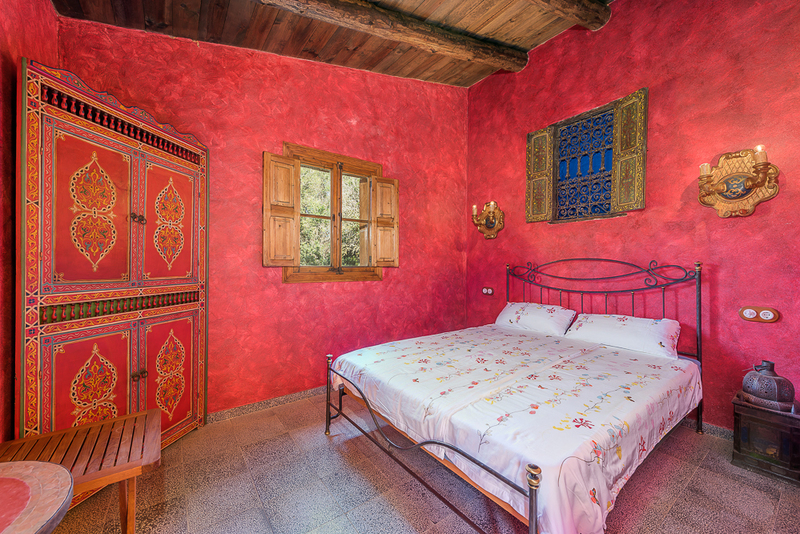 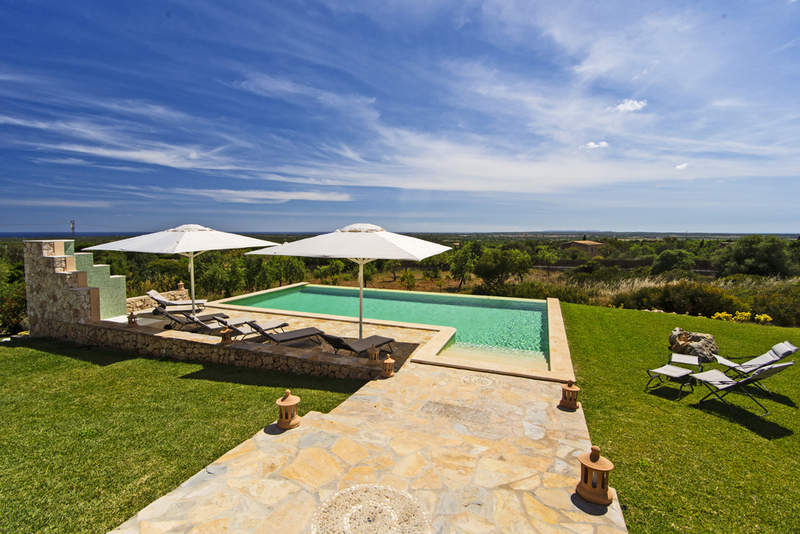 This extraordinary Finca is a very special gem. 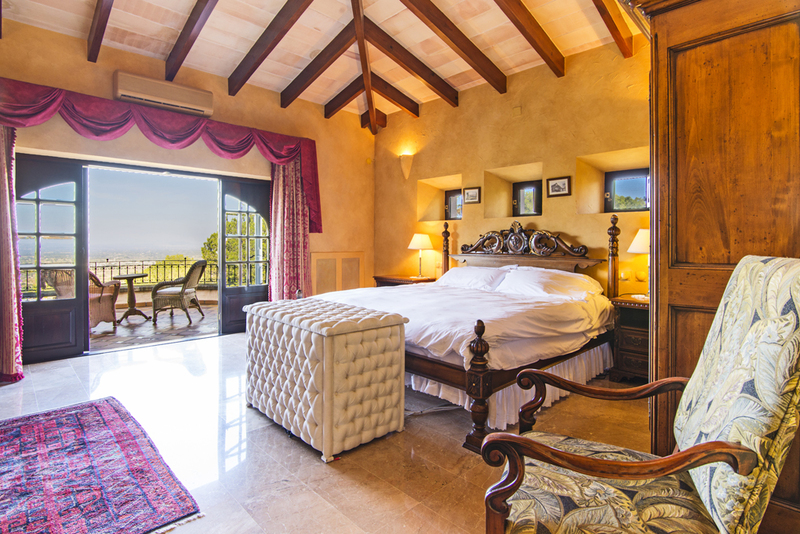 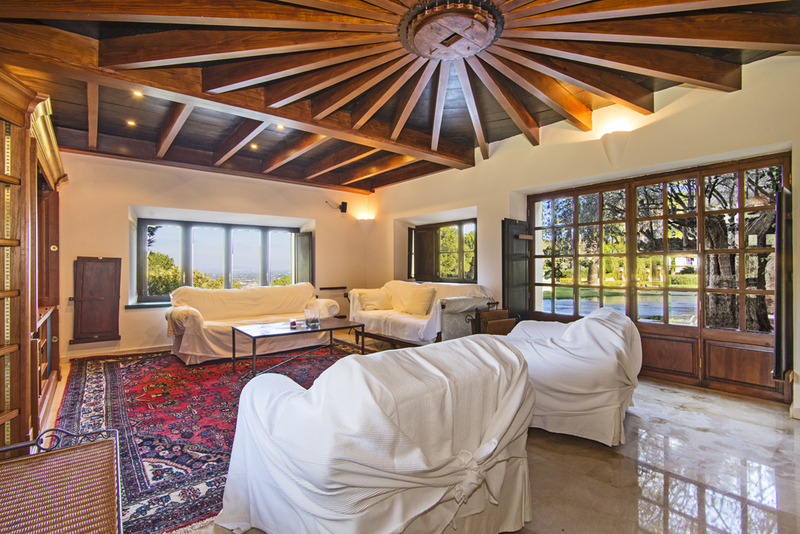 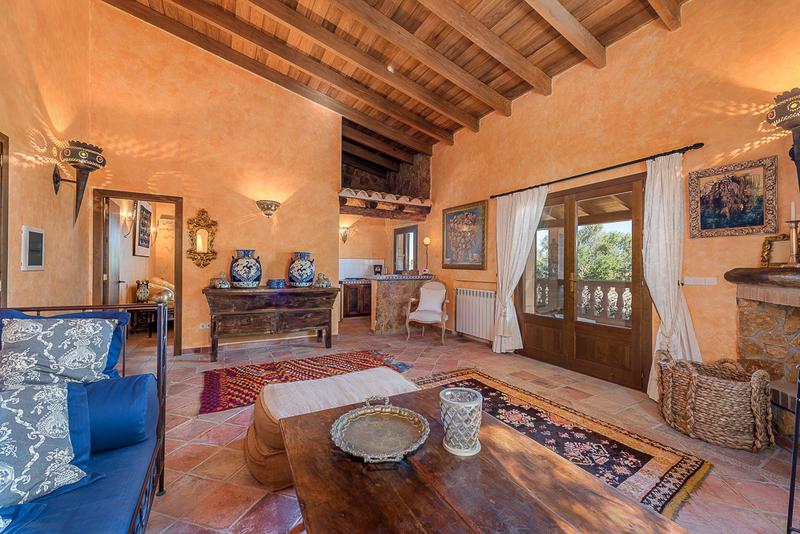 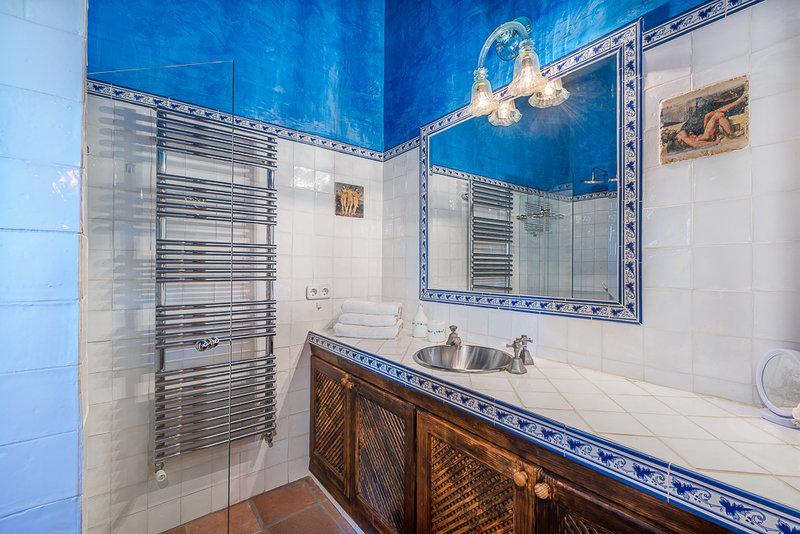 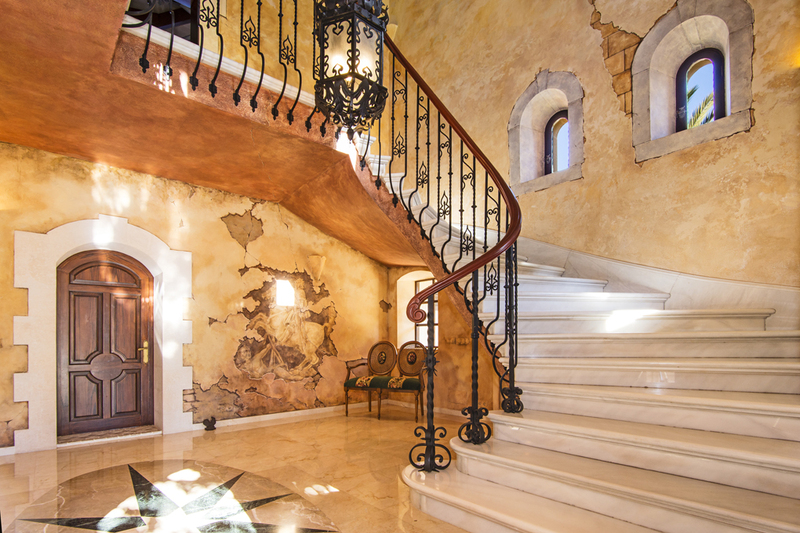 The owner has realized, that discerning guests appreciate a modern, tasteful and highly sophisticated furnishing, but also love the architectural charm of a historical Mediterranean country home. 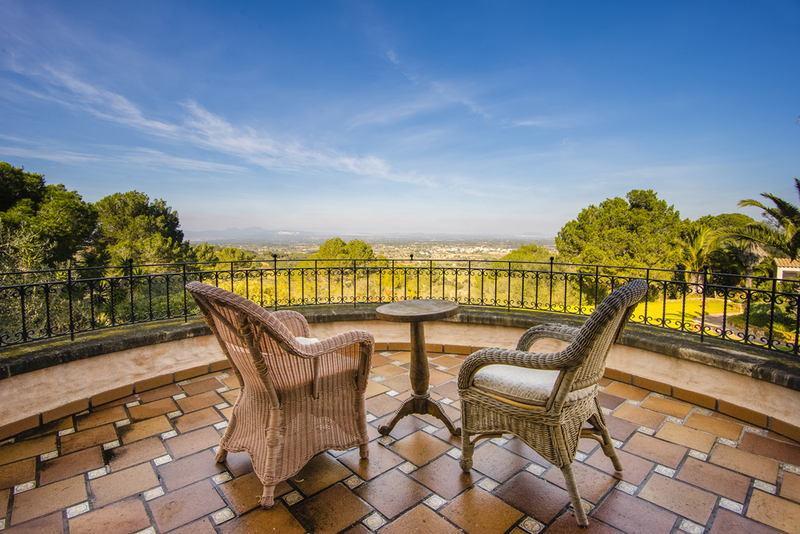 The picturesque environment with incredible panorama views harmoniously complements the overall picture. 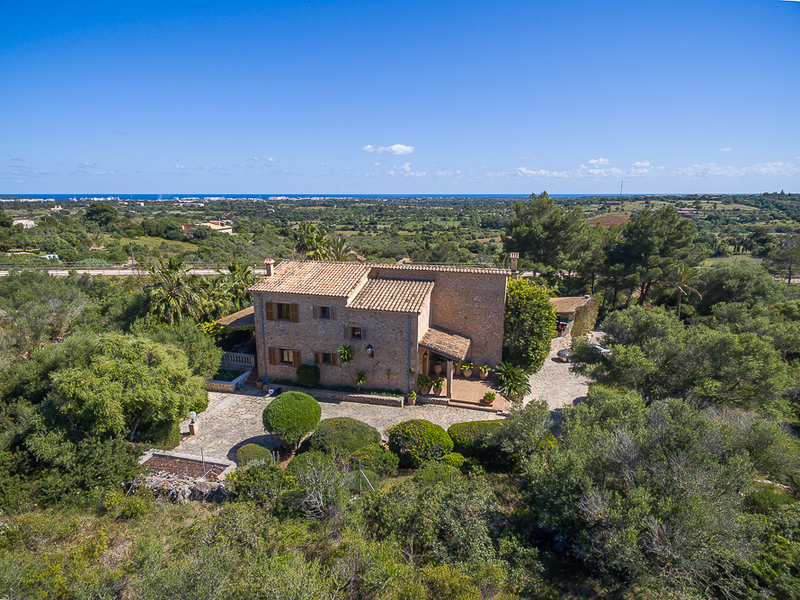 The villa with stunning views over the bay and the nature harbor of Porto Colom, is situated in a quiet residential area. 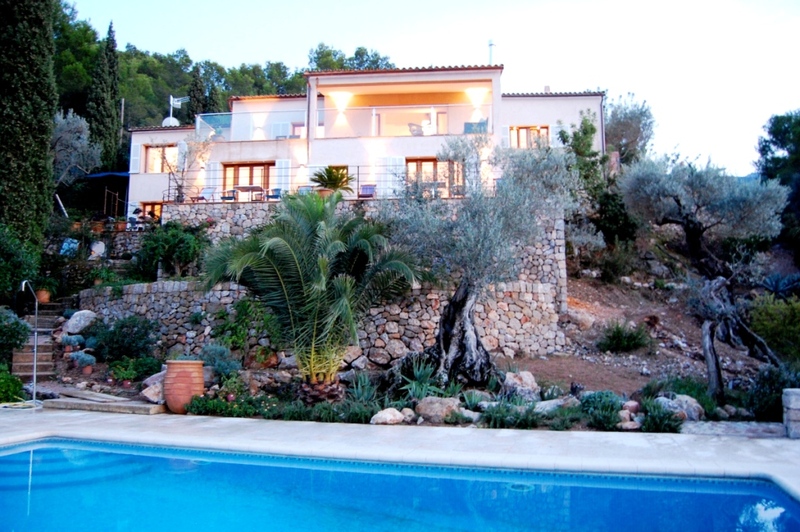 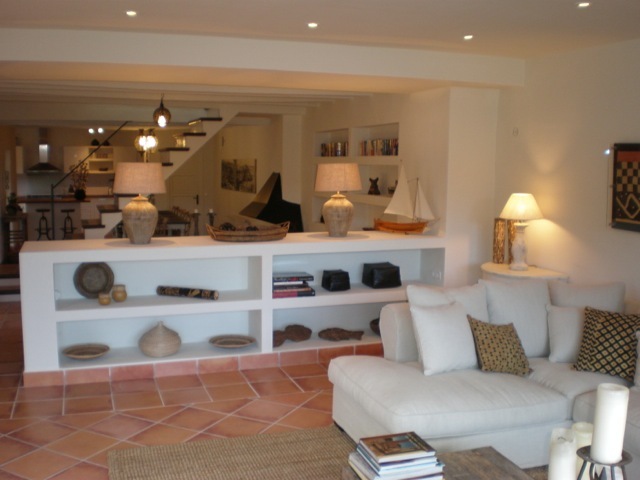 The spacious villa has been built on a large plot of land and offers sea access. 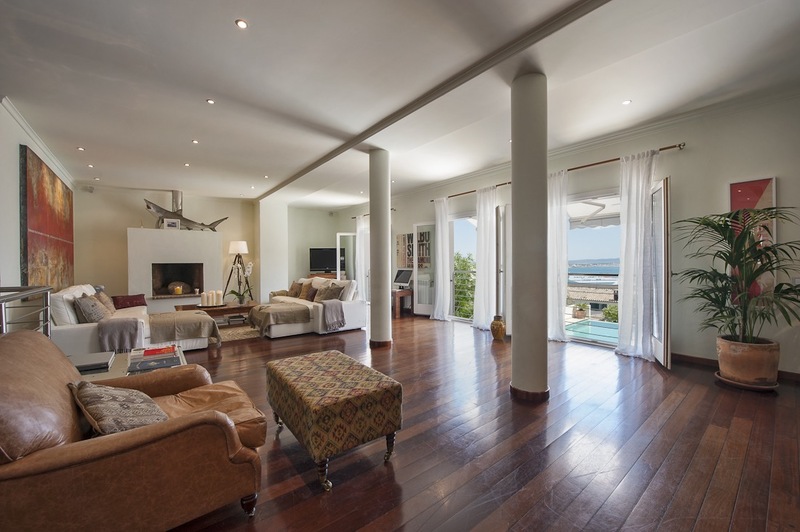 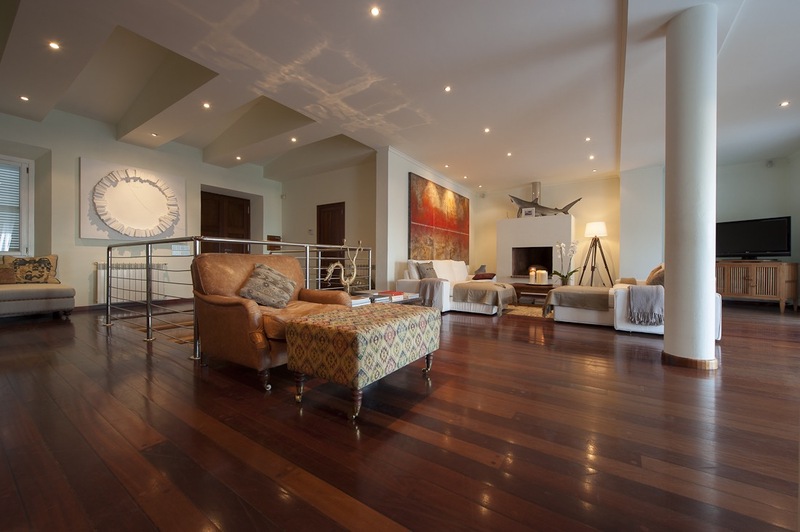 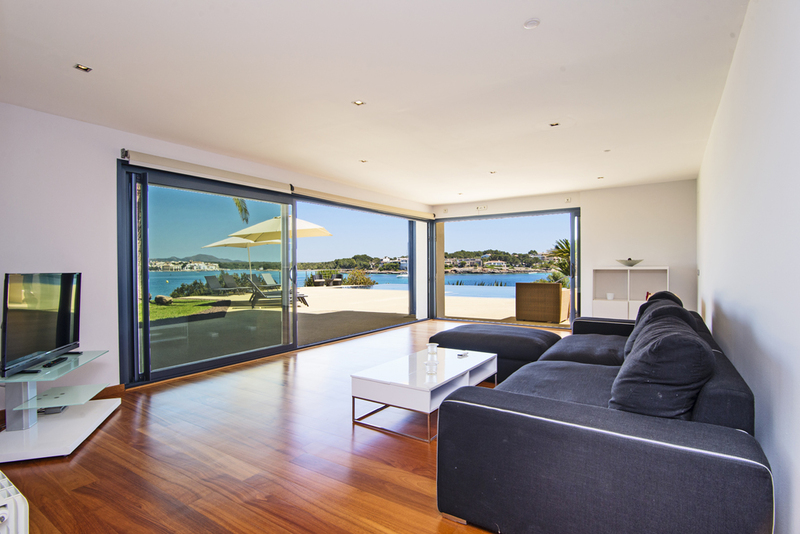 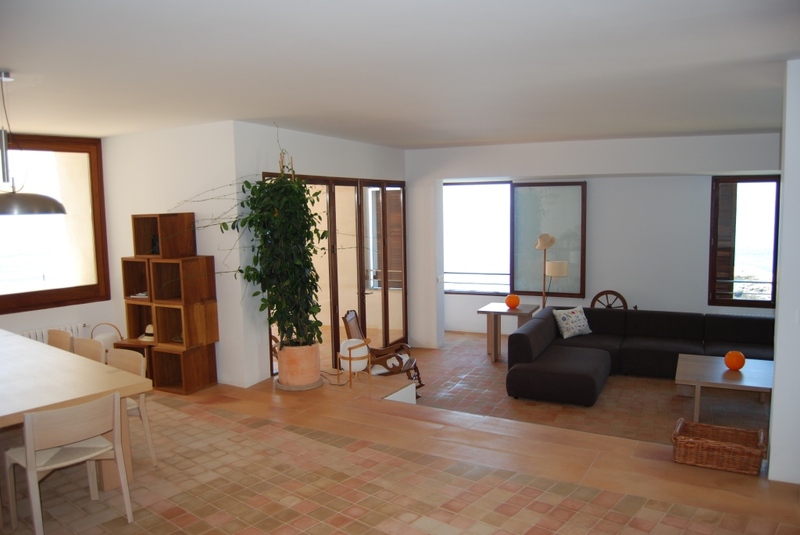 The bright and ample living room is situated at the same level as the entrance door. 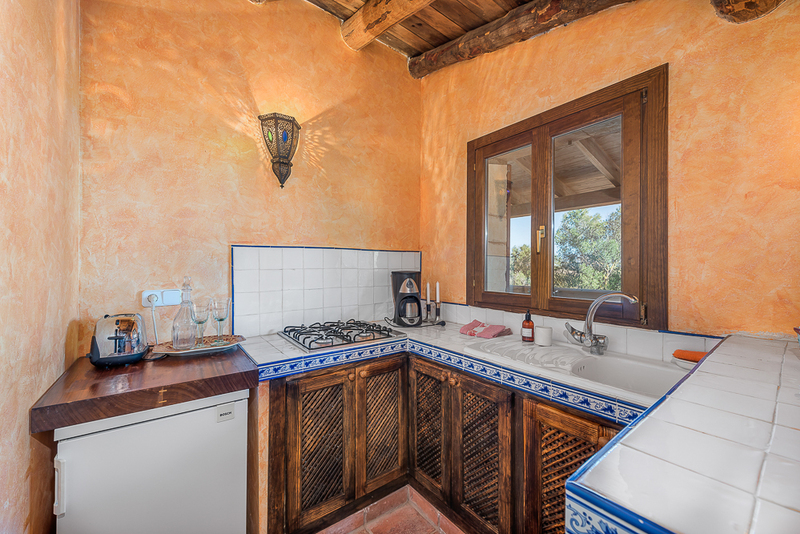 Here are also the kitchen, a small bedroom and the main bedroom with shower and a double bath en suite. 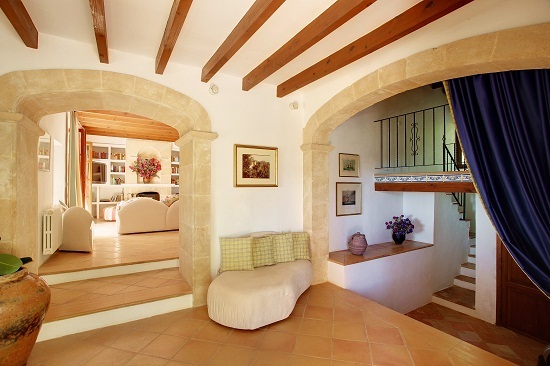 The floor downstairs you can reach over the staircase from the hall. 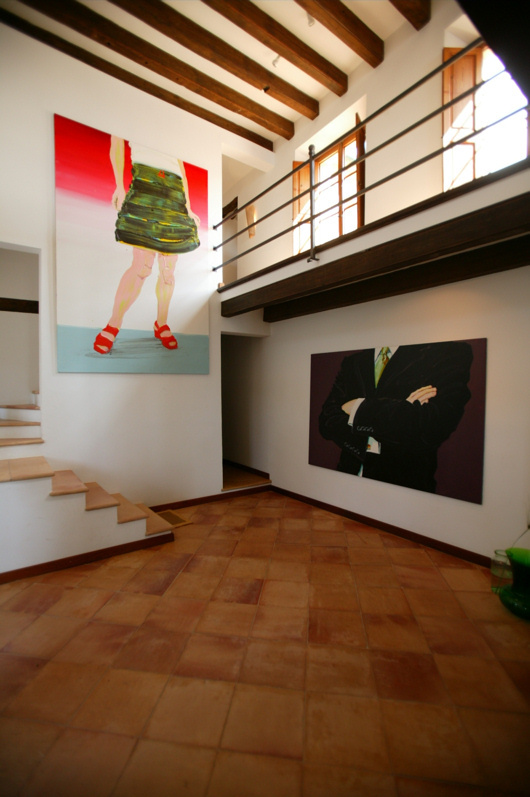 For clients with a handicap it would be possible to use the elevator (on petition). 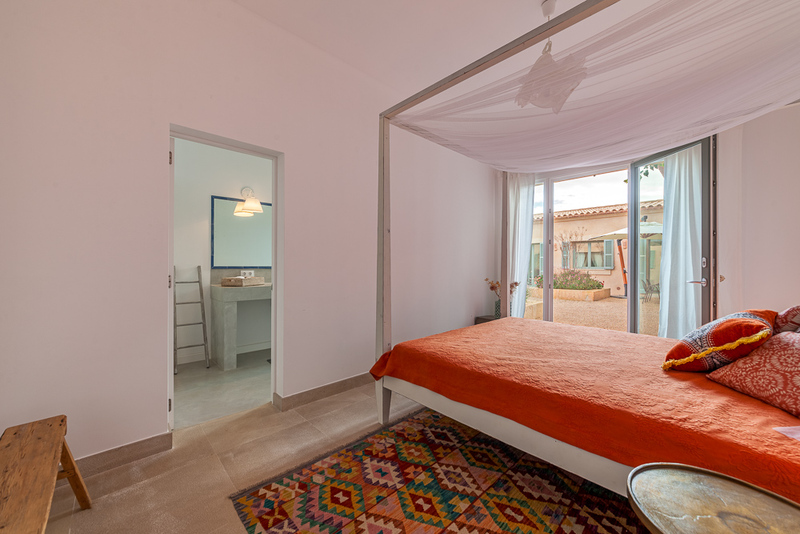 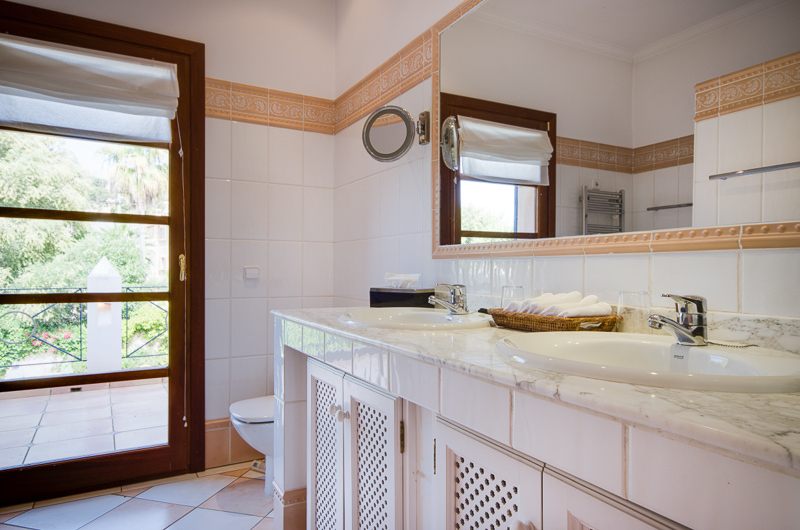 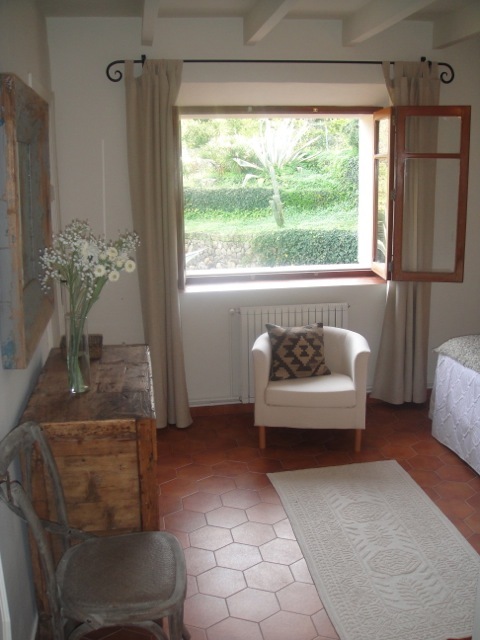 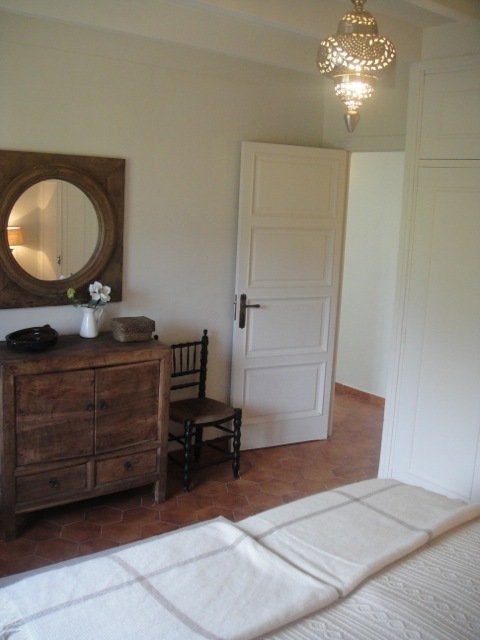 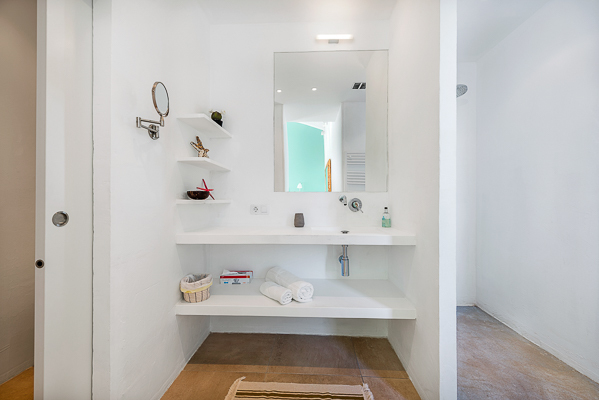 There are 2 bedrooms at the ground floor, both of them with bathroom en suite and access to the terrace and the garden. 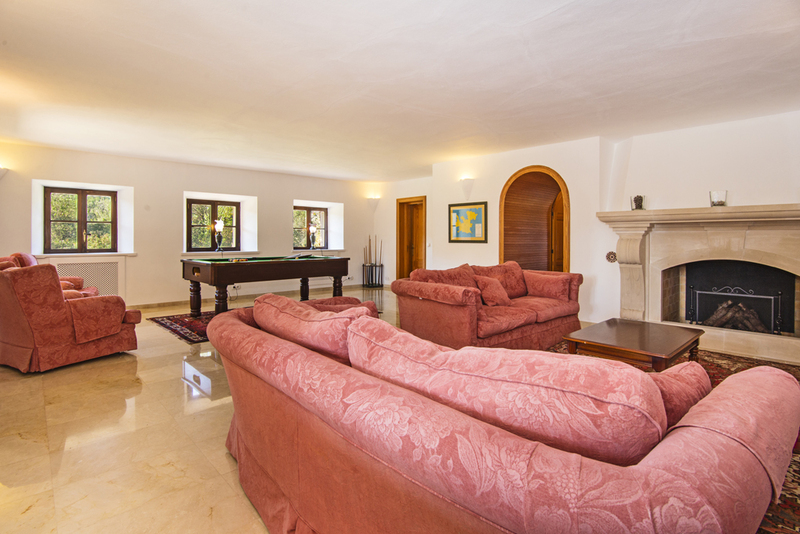 Further is here the TV room, the laundry, a small kitchen and another highlight…. 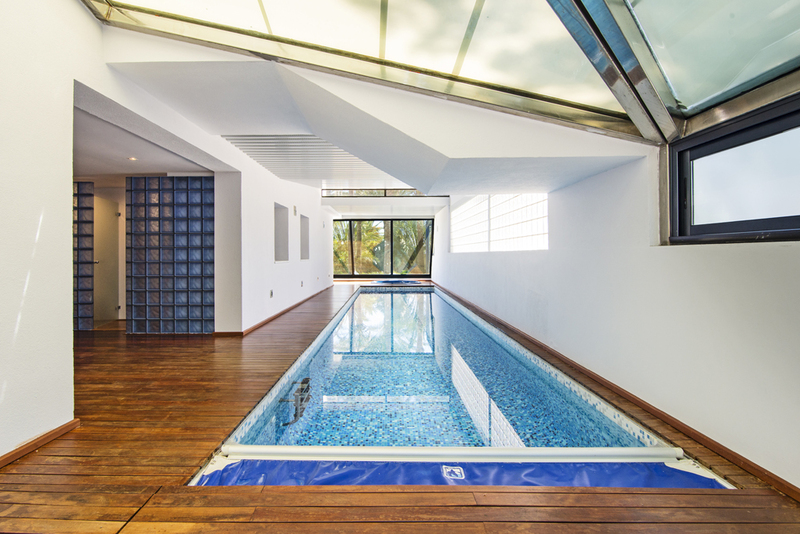 a 12,5 x 2,5 m inside pool, which can be heated. 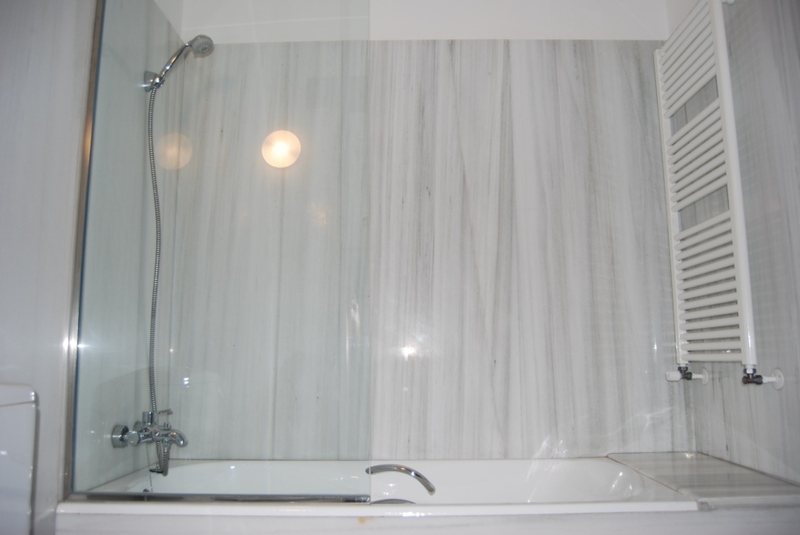 Ask for further information and prices. 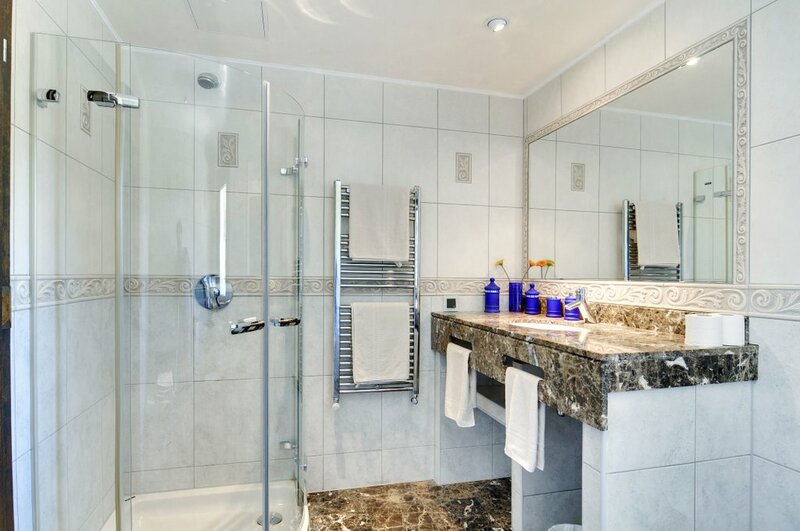 Here are also a few sports equipment’s, a shower and a whirlpool. 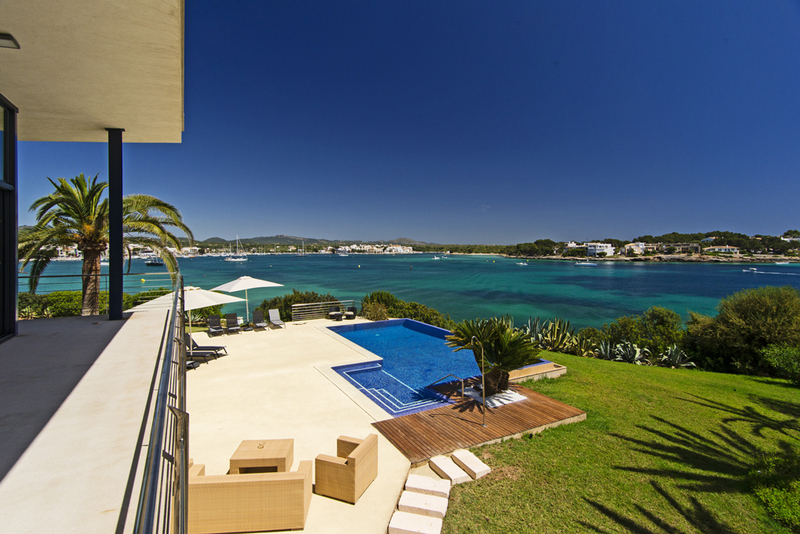 At this level is as well the garden situated with his outside pool, from where you have an amazing view on the boats and yachts that are entering and leaving the bay. 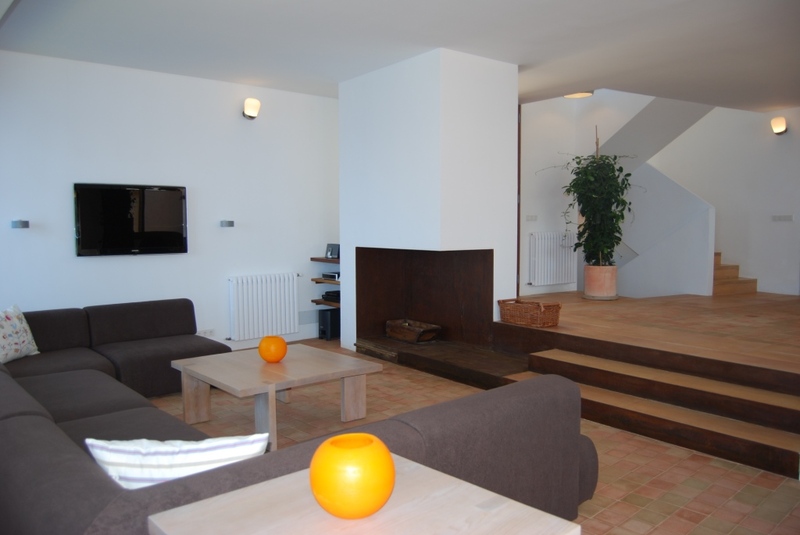 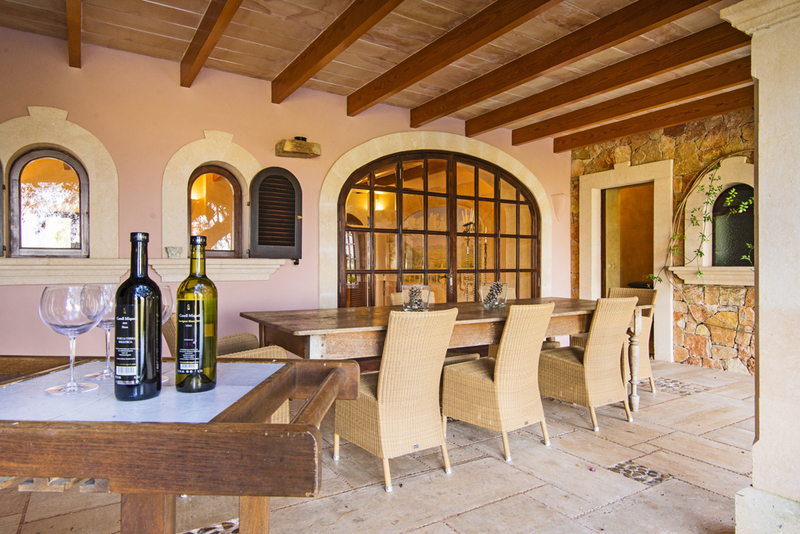 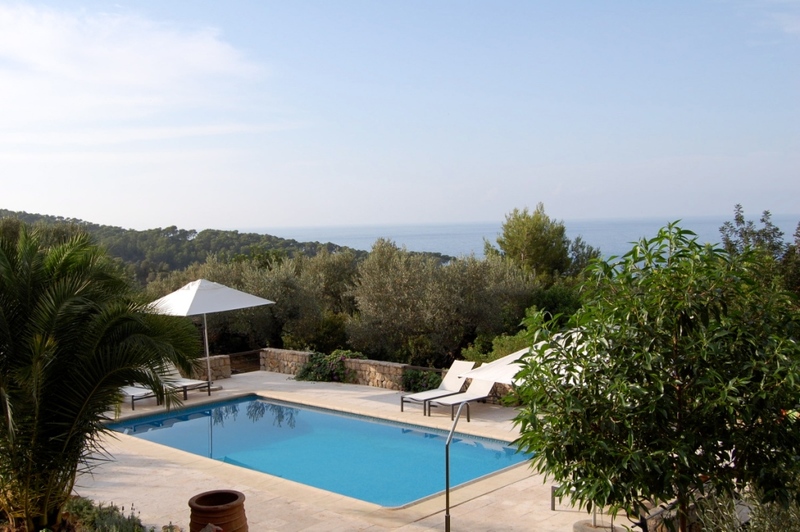 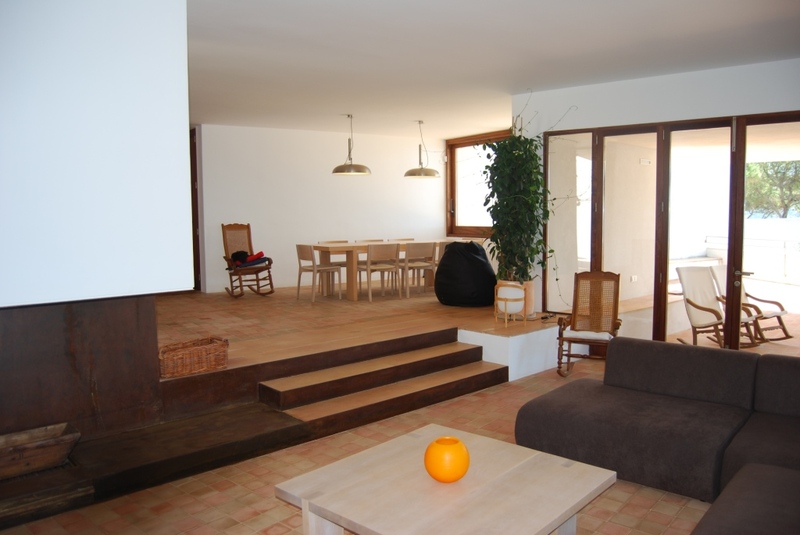 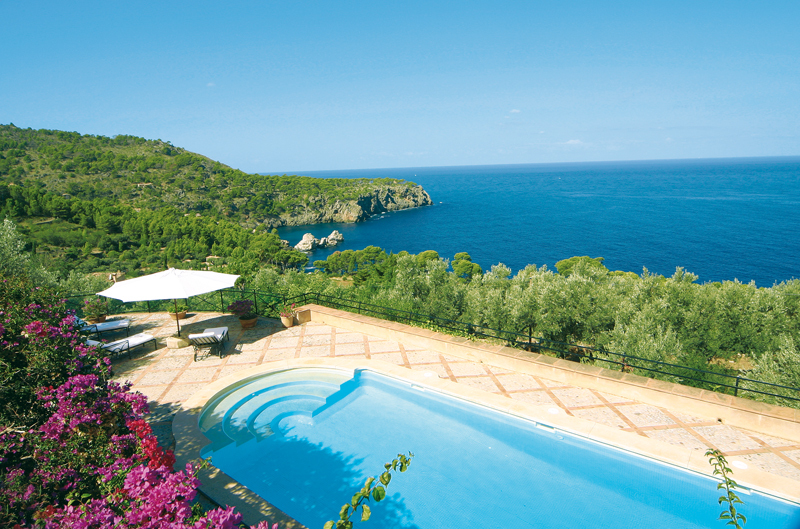 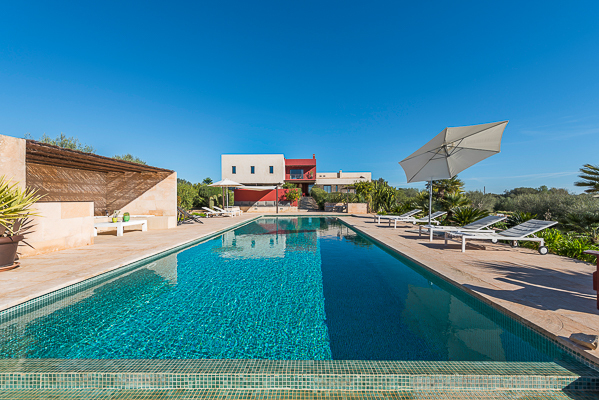 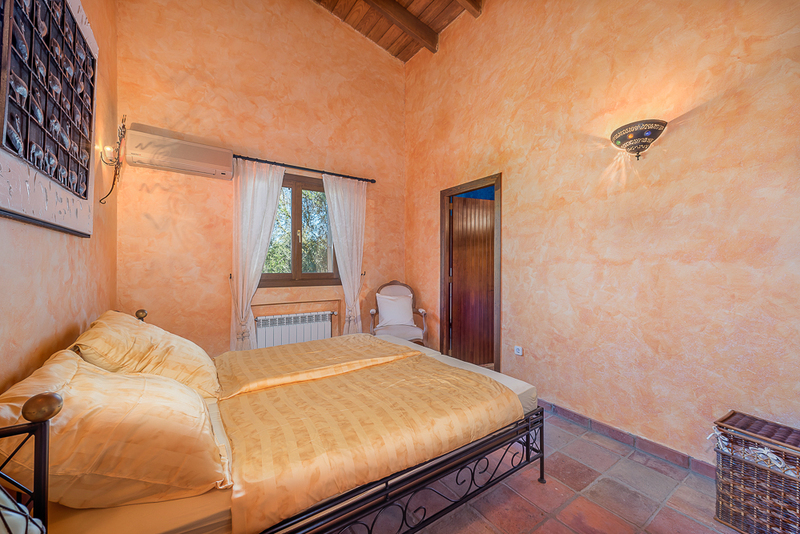 The villa impresses with its location and spaciousness and is ideal for several families or smaller groups. 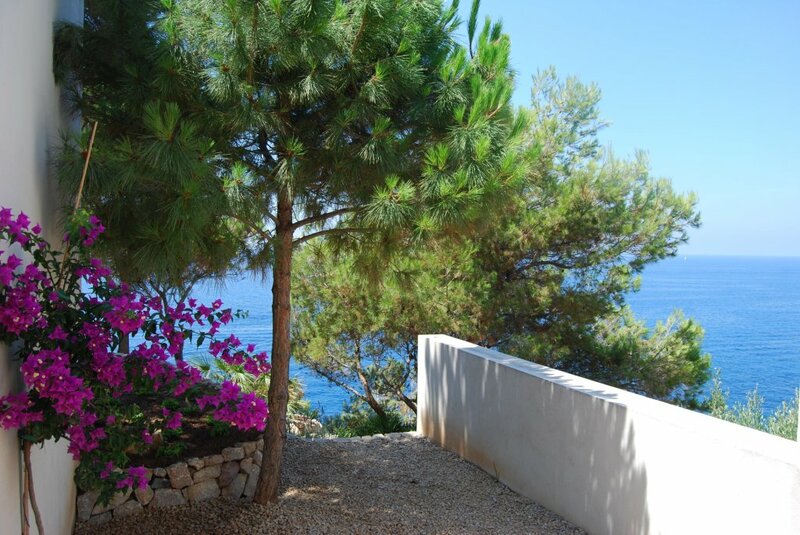 The beach of Port Adriano and the marina is in walking distance (15 min). 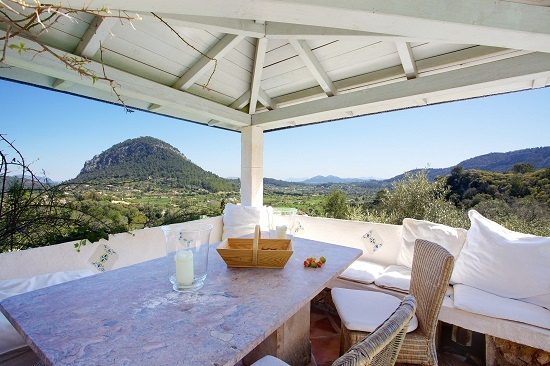 On the roof terrace you can enjoy great BBQ evenings with terrific sunsets.